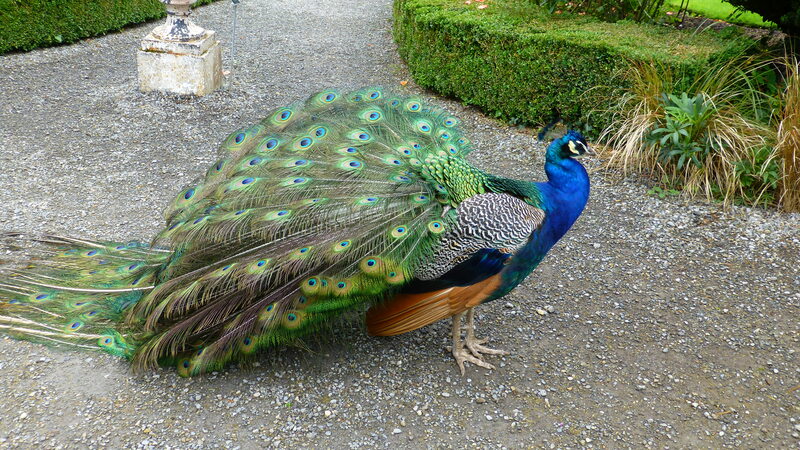 Set above the southern banks of the River Fal in Cornwall, Trelissick Gardens are large and park like. 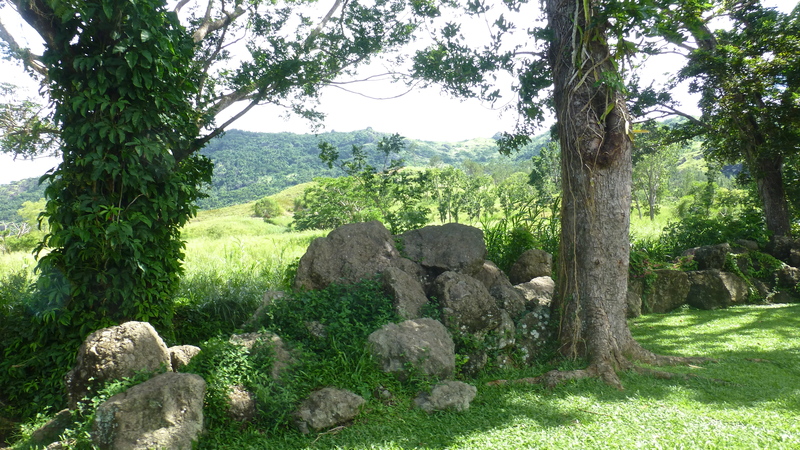 In a picturesque setting, they cover a peninsular of several hundred acres of contoured land. The garden has had many owners since its early days in the 1700s and each of them have made their own contribution to this garden. 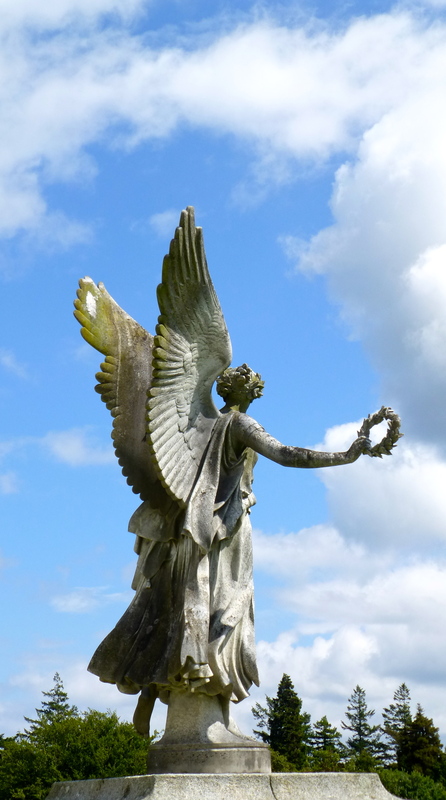 However, the greatest contributions have been made by Carew Gilbert in the late 1800s, Ida and Ronald Copeland from 1937 to 1995 and, since then, by the National Trust who now own the gardens. Three NT gardeners now take good care of the gardens with the help of volunteers (Friends of Trelissick) and students during their holidays. The NT restored the orchard in the 1990s. It now contains 68 different apple trees, mainly Cornish varieties, and as such is a valuable asset to Cornish heritage. The grass in the orchard is left uncut in the summer to encourage wild flowers. Unfortunately we didn’t get to that part of the garden which must look good in any season with the spring apple blossoms, the summer wild flowers, the autumn apple harvest and then the tracery of the limbs in winter. Overlooking the visitor car park is the former water tower with its delightful squirrel weather vane. Because the house and gardens are so far above the river, the water tower was built in about 1825 to pump water from the river. Looking more like a fairy castle, this is now one of five NT holiday cottages which can be rented on the estate. The house and gardens were given to the National Trust in 1955 with the proviso that future generations of the previous owners, the Copeland family, could live on in the house. For now, just the gardens are open to the public. The reception, cafe and shop are housed in former farm buildings giving a rustic feel to the entrance. 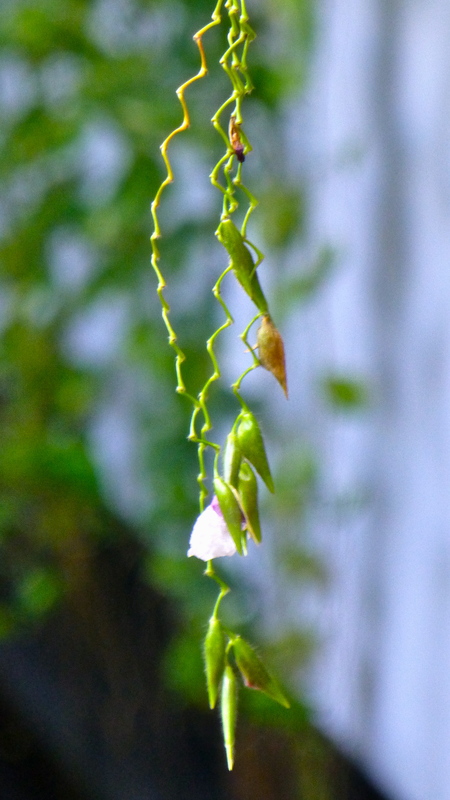 Once inside, the first thing that greeted us on a cool June morning was the beautiful sight and smell of wisteria. This curtain of flowers was labled as Wisteria floribunda ‘Macrobotrys’, a plant that has been known in Japan for at least 400 years. Flower beds line the short entrance walk into the main gardens. 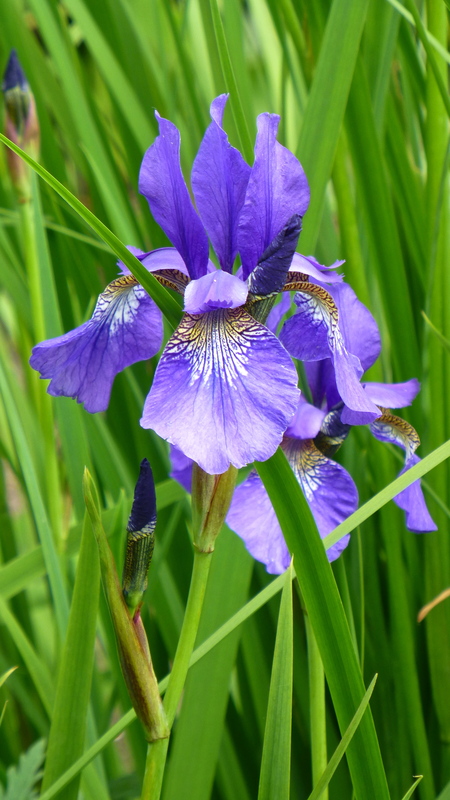 Purple iris were brilliant against the greens. 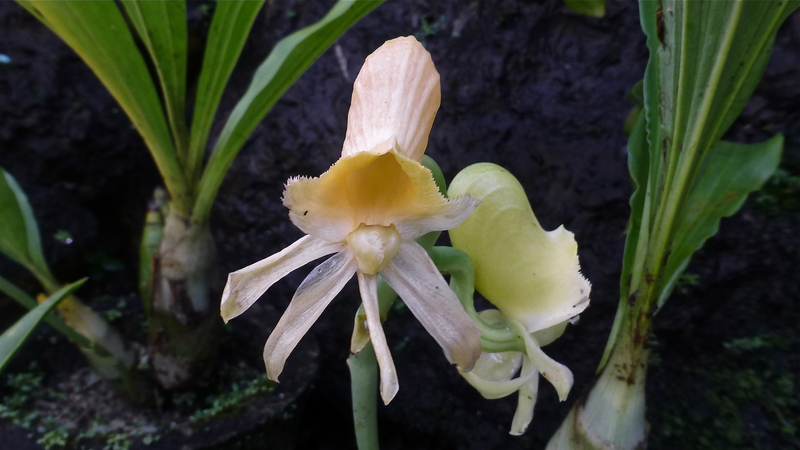 The markings on this yellow iris are stunning and the furled bud is so elegant. It always pays to stop and take a closer look. Colours, shapes and textures were carefully blended in the garden design. 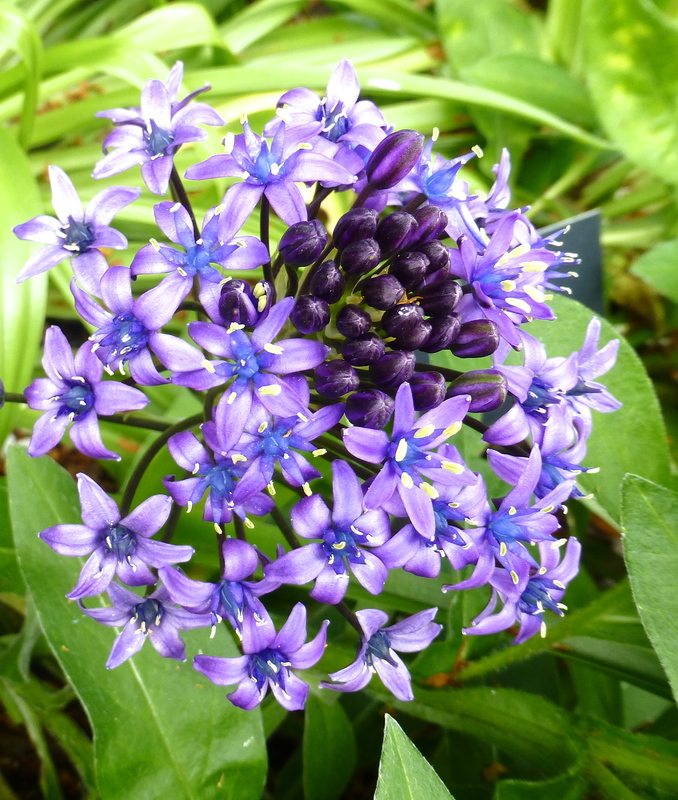 There were delightful small plants, too, like this Scilla peruviana. The main lawn spills down a slope to a border thick with trees and shrubs. 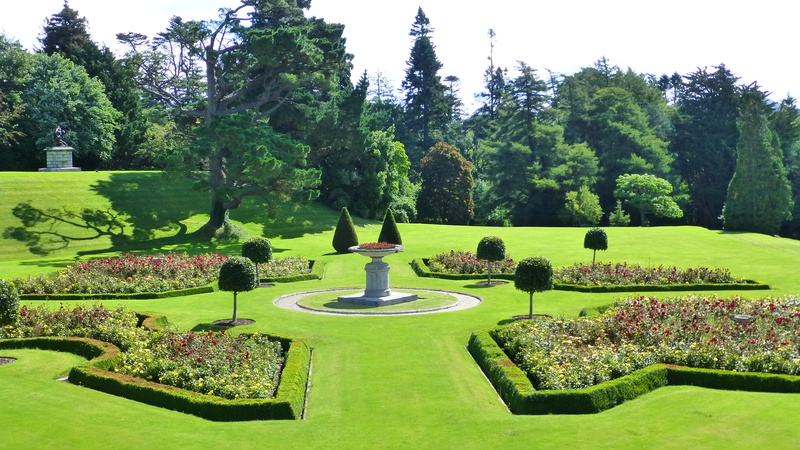 In the centre of the lawn is a large Cryptomeria japonica, Japanese Cedar, planted in the garden in 1898 by the estate’s owner at that time, Carew Gilbert. 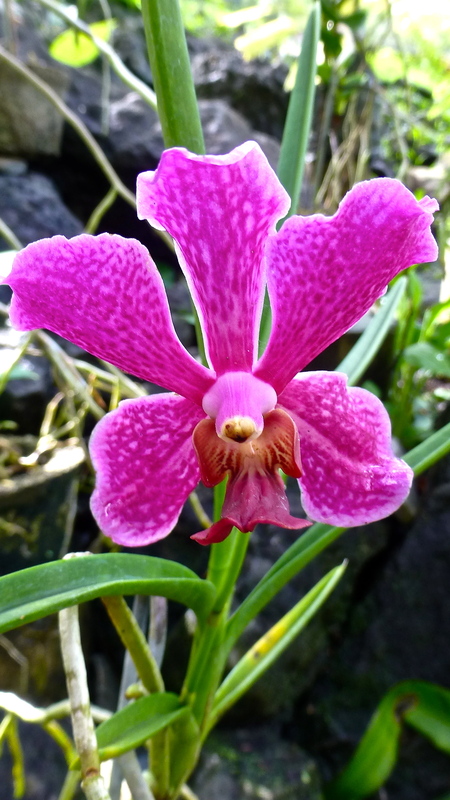 Carew was a great traveller and brought back many exotic plants from Japan, southern Europe, North and South America. 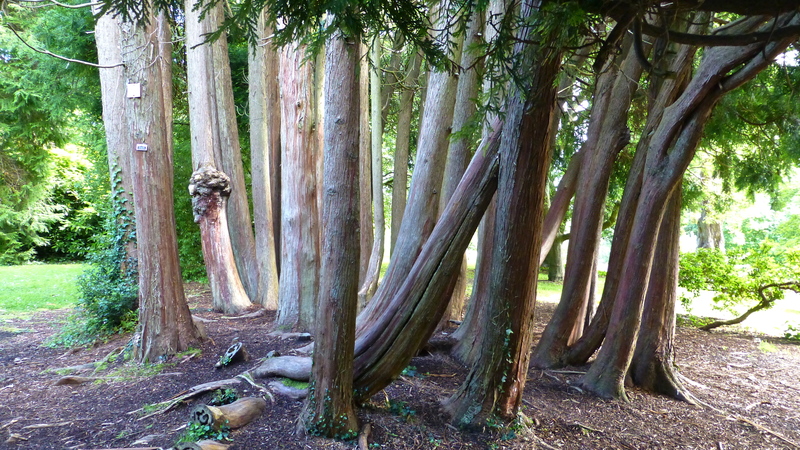 Many of the bigger specimen trees in the garden were planted in his time. This one dwarfs David. It’s magnificent. Paths run along the top of the slope with glimpses of the River Fal. Above the river, at the top of the hill, is a glimpse of the Tregothnan Estate owned by Lord Falmouth’s family. 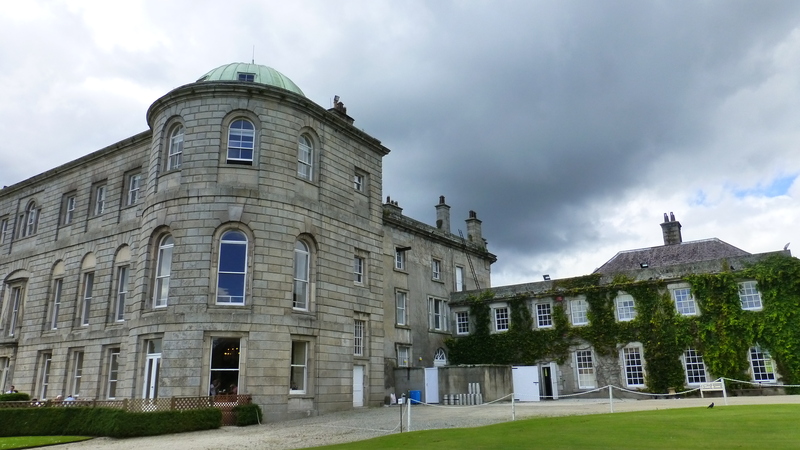 A closer view of the large mansion at Tregothnan. In 1832, Lord Falmouth of Tregothnan bought Trelissick from the then owners, the Daniells. The cost of building a new house at Trelissick and a slump in mining had forced the Daniell family into bankruptcy. The house was unlived in and the gardens untended until 1844, when the estate was purchased by John Gilbert, father of the plant hunter, Carew Gilbert. Thankfully, a keen gardener had come to live on the estate and his plantings form the skeleton of the gardens today. 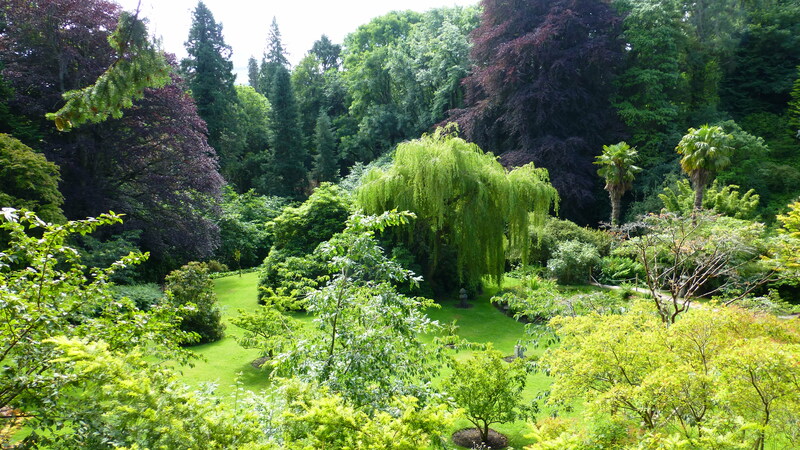 There is plenty of space in this garden to wander and unwind as you discover the great variety of plants that grow in the various micro climates formed by the topography of the garden and sheltered by those trees planted by Carew Gilbert. 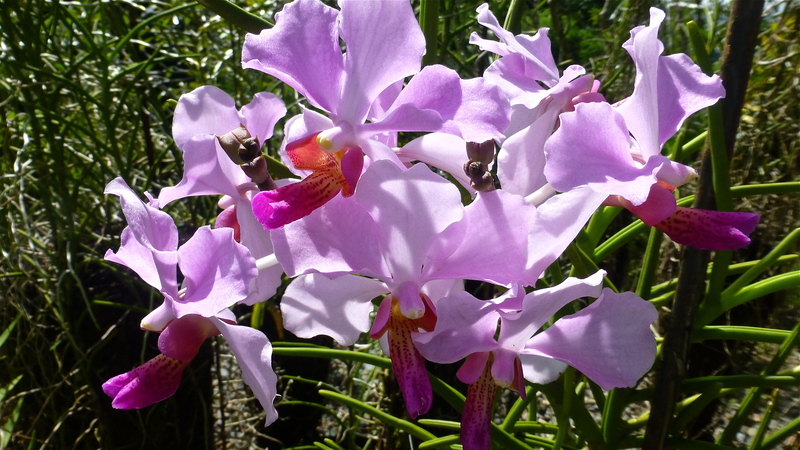 It’s a garden to be enjoyed in any season of the year although early spring and autumn must be the most spectacular. We were there at the end of spring when the garden was filled with many different greens highlighted by an occasional splash of colour. 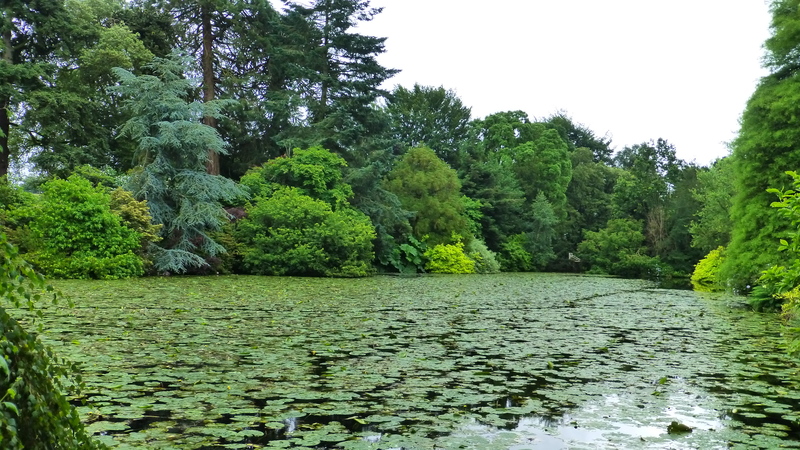 Trelissick is a huge garden. It’s not a place to try to see in just one visit. Those who live near by, can take it in a section at a time, a season at a time. We would, if we could. At the end of an hour or so of enjoying the garden and its trees, we came upon a small NT gate house. From there, steps lead down to the River Fal and the ferry, a popular way for people to come to the garden from north of the river. There’s also a river side path that’s always freely open to the public. 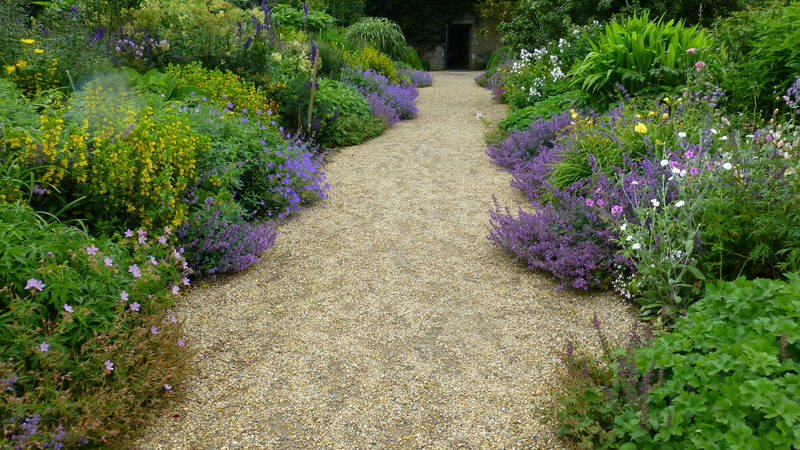 This path area is thickly planted to give the main garden protection from the wild Cornish winter winds. We decided to take the river side woodland walk and go on through the farm, leaving more wandering in the main garden until the afternoon. We’ll show you something of that relaxing walk in our next episode about Trelissick and then we’ll come back to explore more of the garden after that. 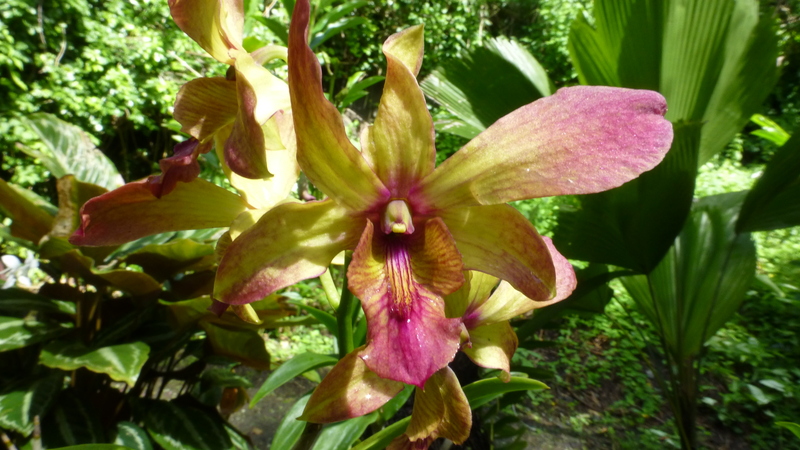 I left you wandering in the beautiful orchid gardens of the sleeping giant just off the road between Nadi and Lautoka. 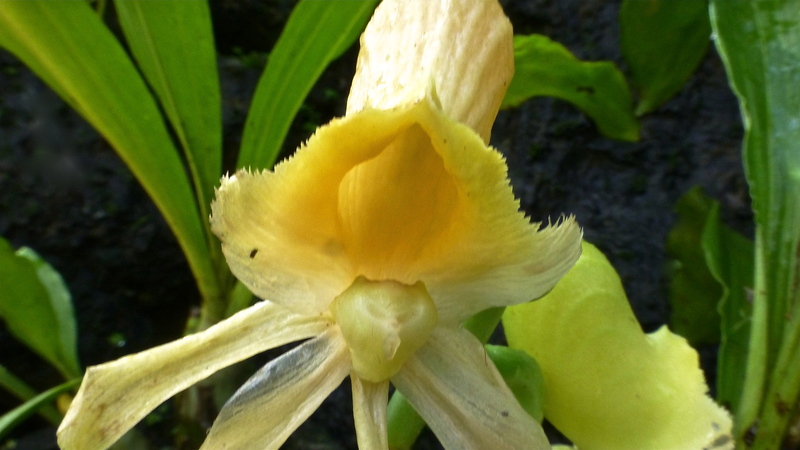 But there is much more to the Garden of the Sleeping Giant than just orchids – much more. It’s a tranquil place to walk on a hot day. 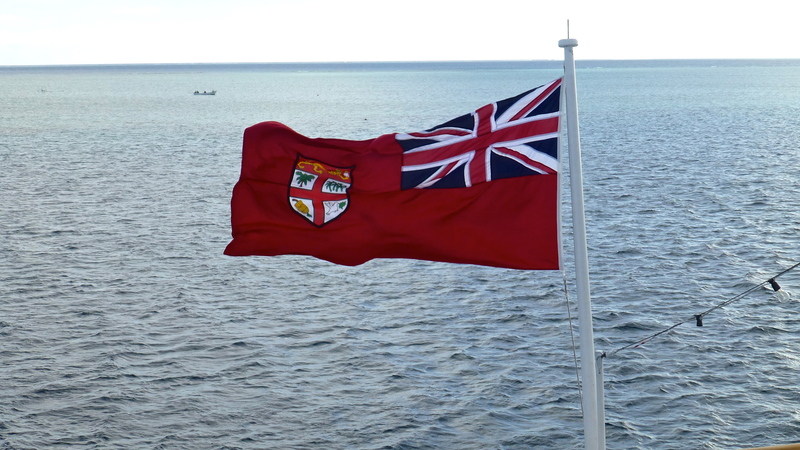 Unfortunately we did not see it all, partly because of time constraints – we had to get back to the ship for our next island hopping adventure – and partly because cyclone Evan had badly damaged the forest. Much of it was closed to the public for the time being. I’m sure it will be open again soon for those who wish to walk through the forest to the top of the hill for the fine views that I am promised are there. to make a welcoming grassy patch. 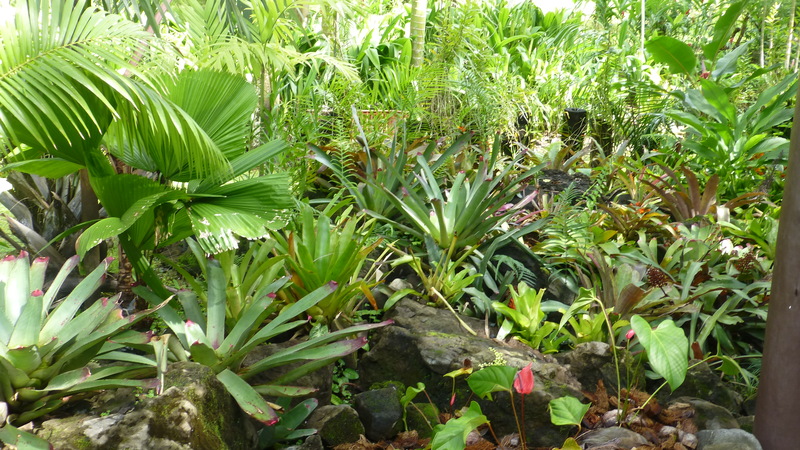 Small gardens of tropical ground cover plants edge some of the ‘lawn’ area. 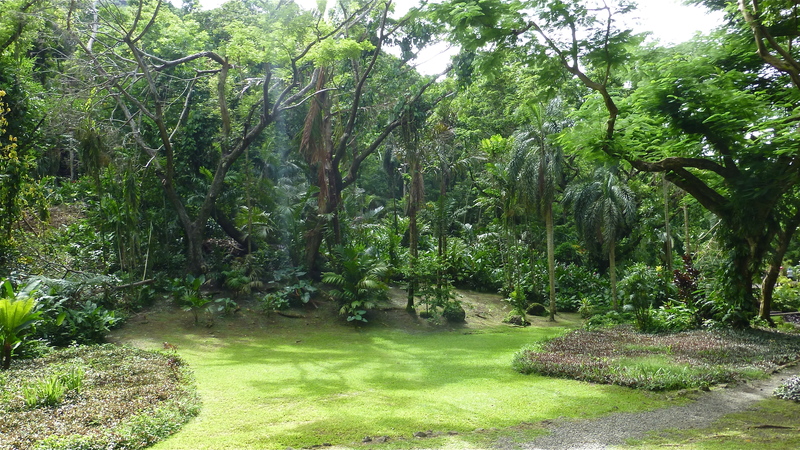 This part of the gardens is sometimes used for weddings. A wedding ‘chapel’ is on the hill above here. 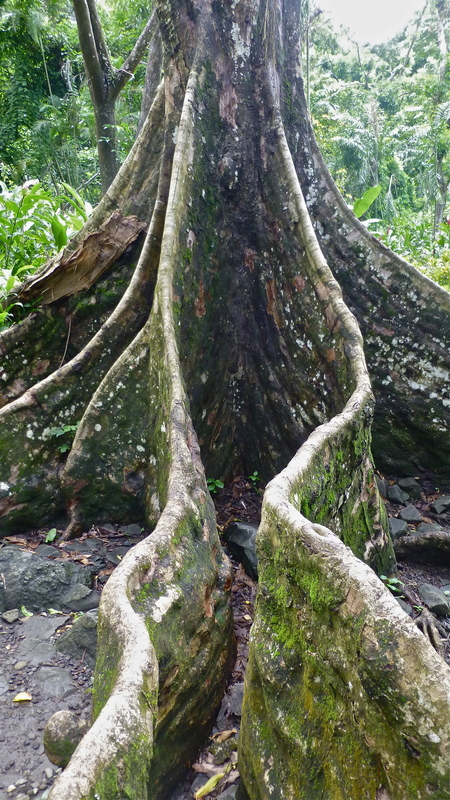 held into the ground with formidable roots. 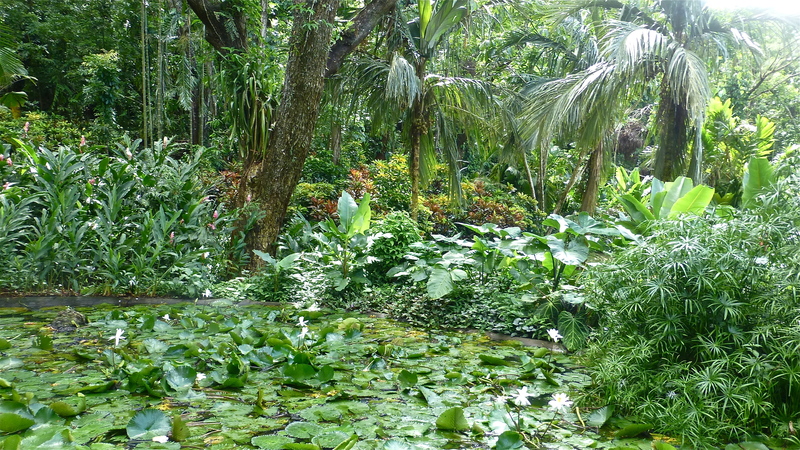 At the base of the gully is a lush lily pond. 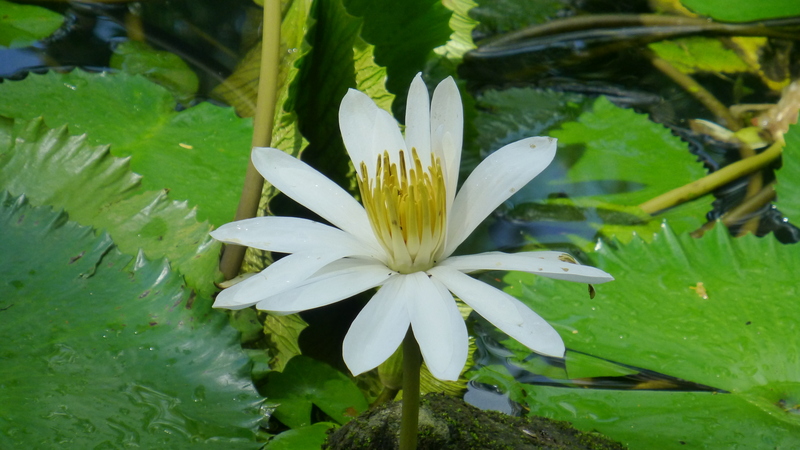 And where there’s a lily pond, there are usually lilies! 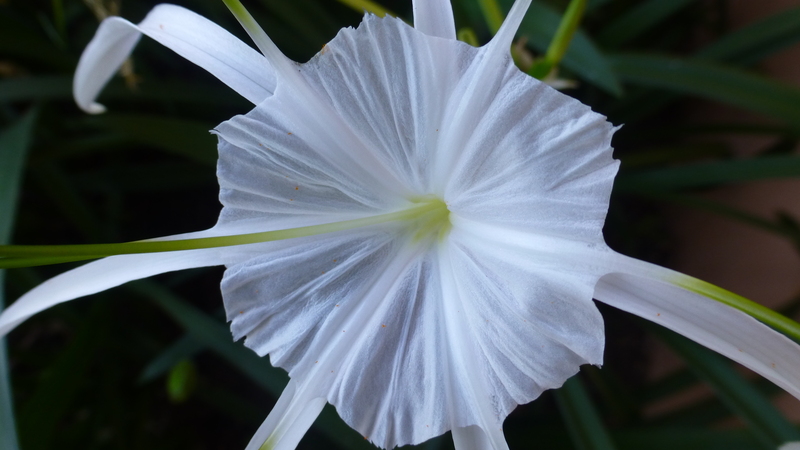 I love the structure of a lily. One of nature’s beautiful sculptures. 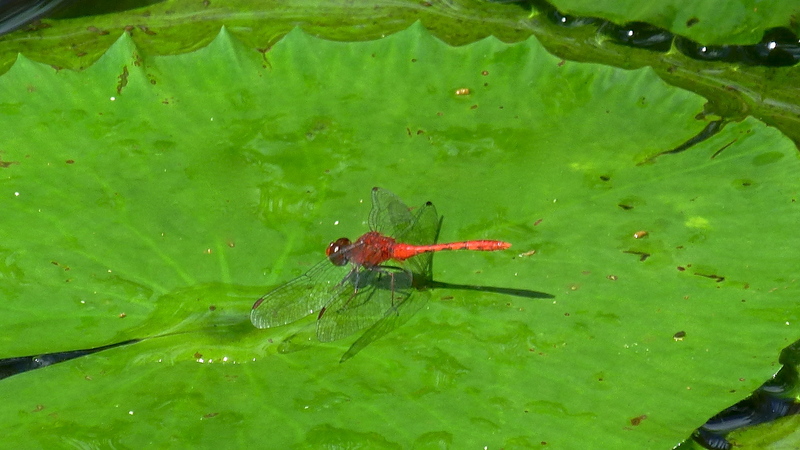 Several beautiful red dragonflies made use of the lily leaf water pools. 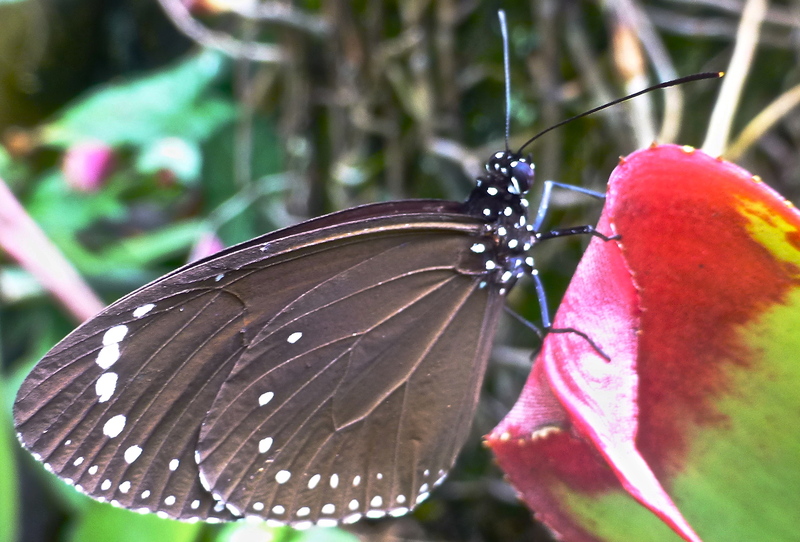 Their gauzy wings are another delight of nature. Water iris are another delight found beside this pool. 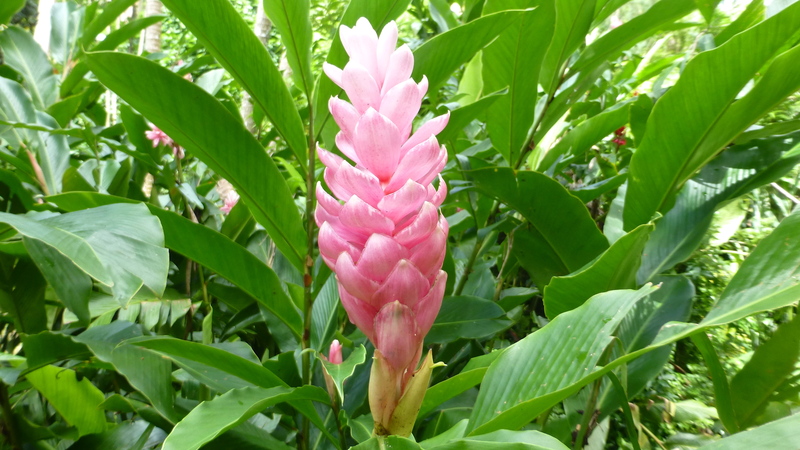 Nearby, there were tropical gingers in abundance. I’ll leave you to enjoy them as we did. Too soon it was time to wend our way back up the board walk towards the entrance. 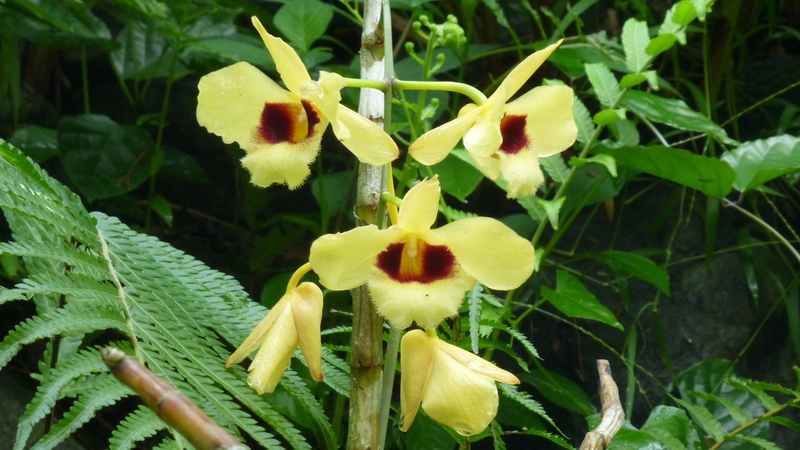 On the way there was time to look back at the hills – and enjoy more orchids. 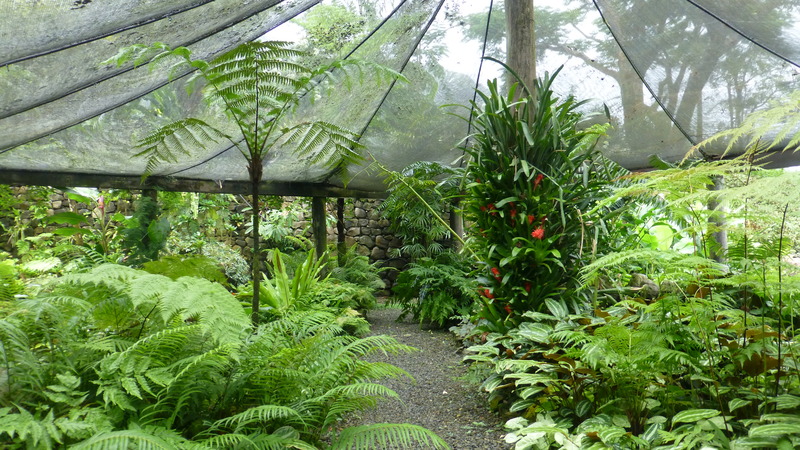 Close to the entrance to the gardens is a delightful shaded ‘fern house’. Palms. Again, one of nature’s masterpieces of sculpture. 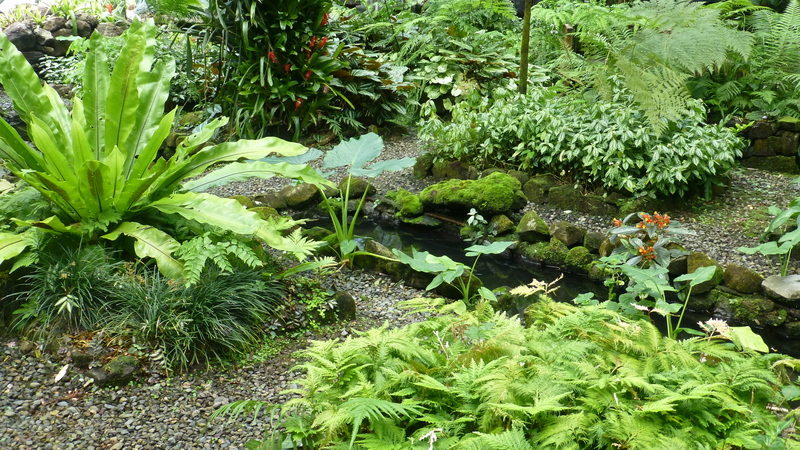 A small water ‘rill’ had been diverted through the fern house. 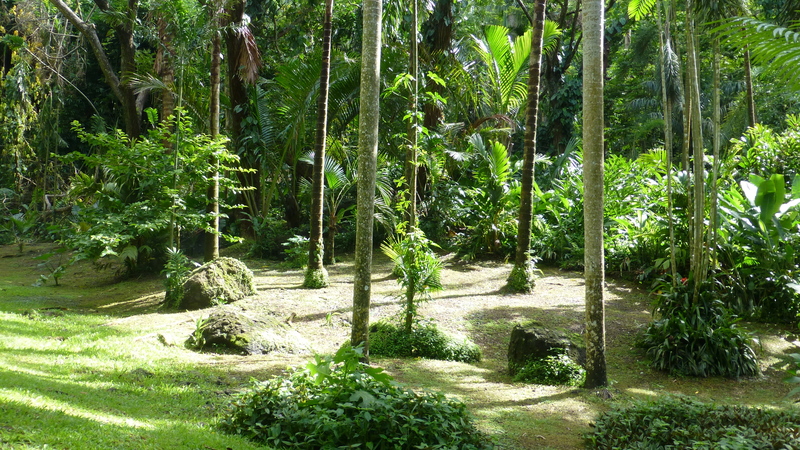 The sound of gently running water gave authenticity to the fern forest feeling. 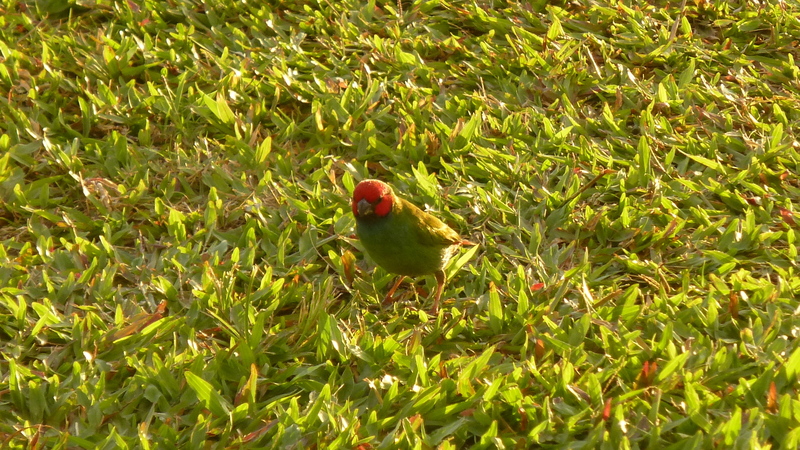 In this area, dashes of red and gold lifted the predominant greens. if you took more than a cursory look. 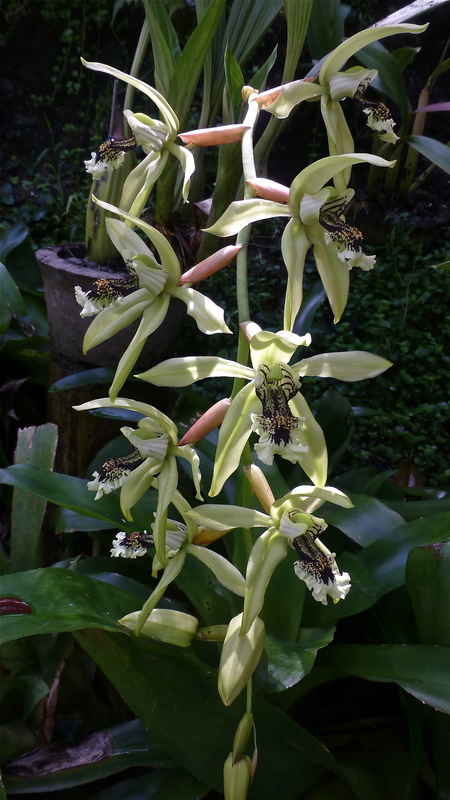 Just outside the fern house, a few bananas were in flower. Aren’t they superb? Well worth a close look. 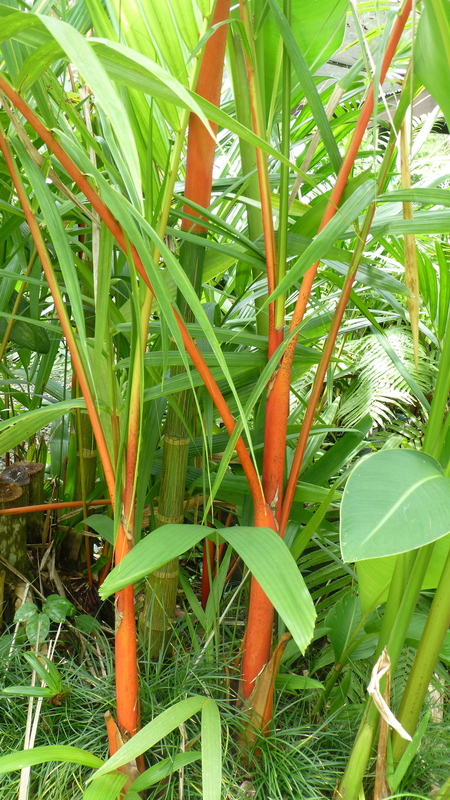 The entrance area is furnished with inviting, comfortable cane lounges. Welcomed back with a cool drink, this is the place to rest awhile. 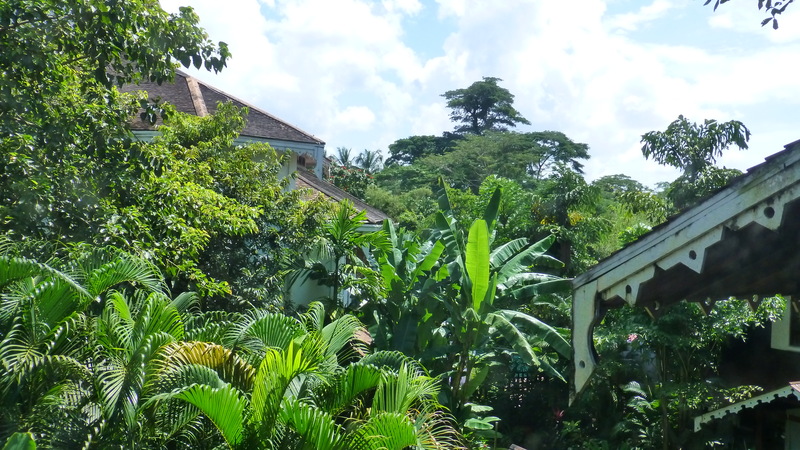 Taxis arrived, and it was time to leave this delightful garden. It was time to drive back to Lautoka. We were about to embark on another island hopping adventure. With some new passengers on board , we set sail for the Mamanuca Islands. Arriving at a small coral cay, we stopped to enjoy the late afternoon. An hour of snorkelling was a great way to end the day. On the horizon, though, clouds began to gather. 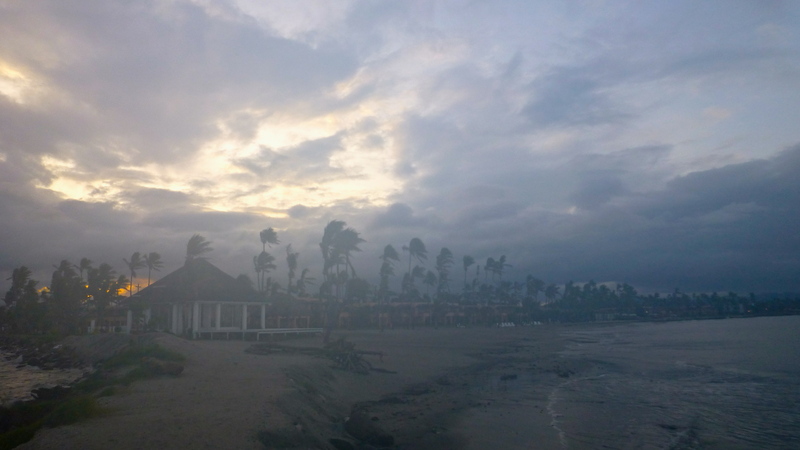 This is the tropics and afternoon storms are very frequent – and to be expected. Now join us as we sail through the warm tropical waters. 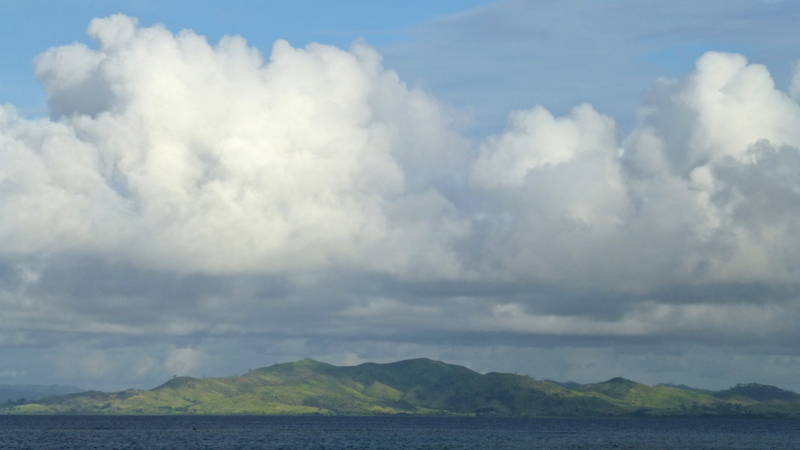 Ahead of us, an interesting three days as we explore the small archipelago of the Mamanuca Islands. 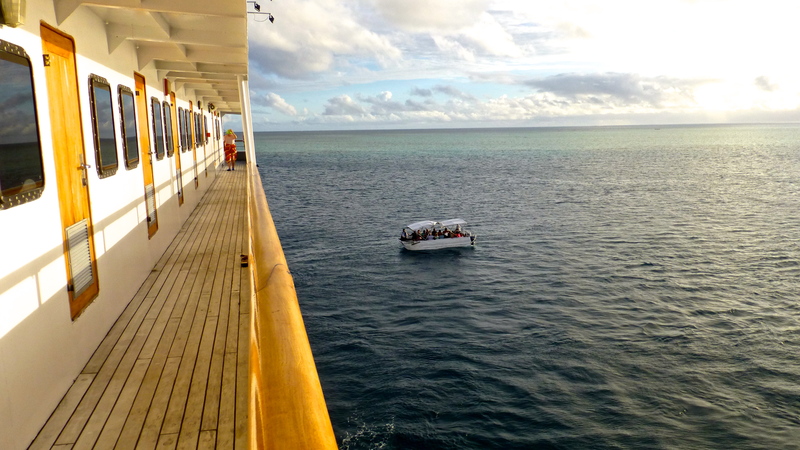 we are on board Captain Cook Fiji’s exploration ship, the MV ‘Reef Endeavour’. Why not join her sometime for your own Fiji adventure! 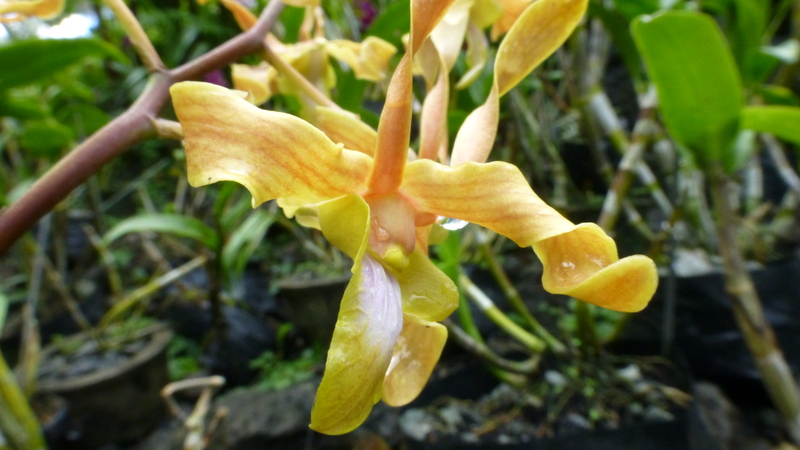 The Orchid Garden of the Sleeping Giant was a complete contrast from the experiences we had been enjoying on our island hopping journey on ‘MV Reef Endeavour’. 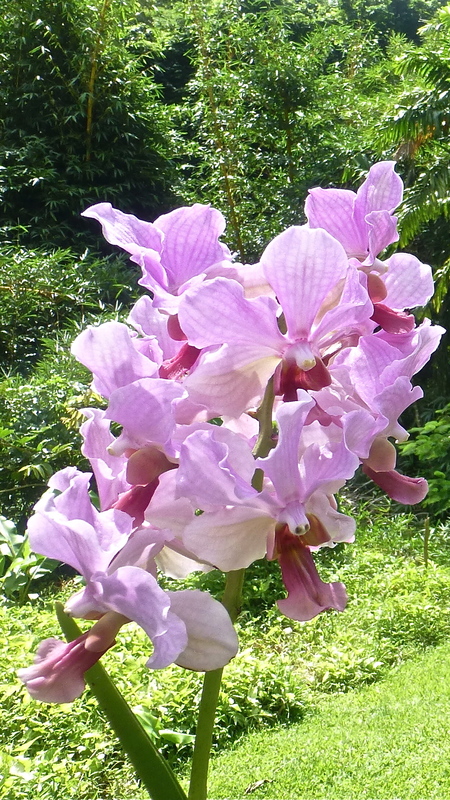 Here, in a plantation of some 20 hectares, over 2,000 orchids are grown. 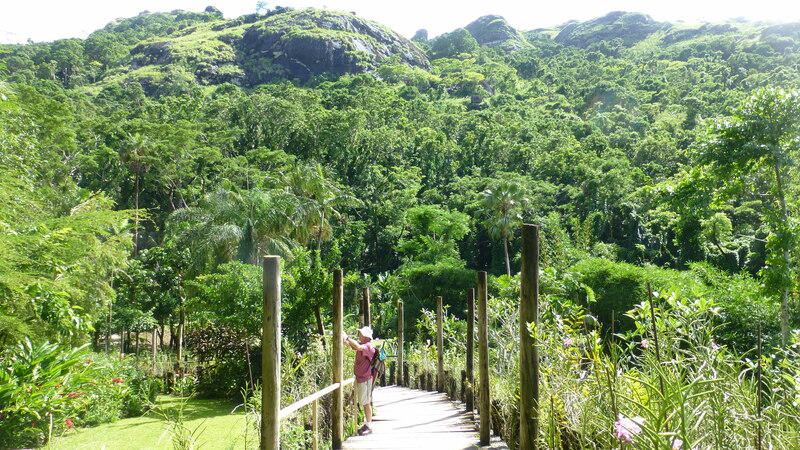 Not all were on display, because the garden was still recovering from the cyclone, but there were enough to make for a magical walk through a lush green forest at the foot of the mountain of the Sleeping Giant. 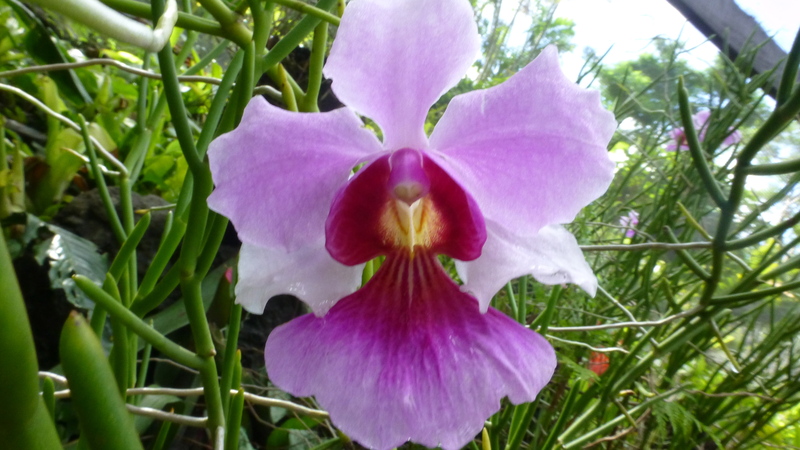 as well as plants from other tropical areas. 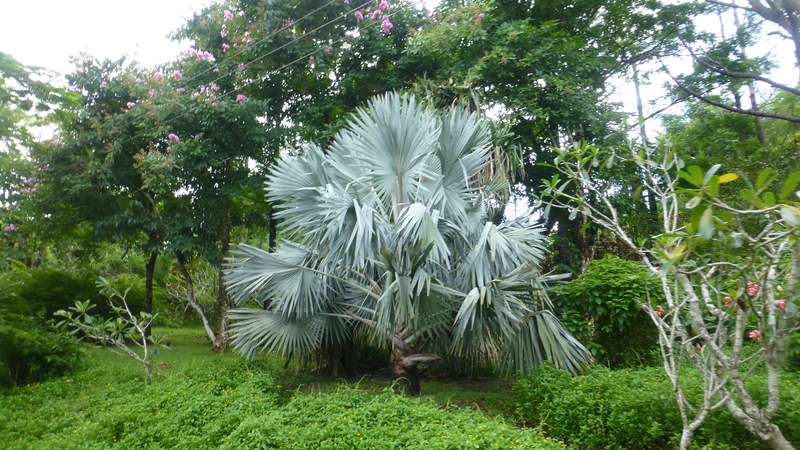 A welcome site at the garden entrance is this stunning Bismarckia Palm, endemic to Madagascar. 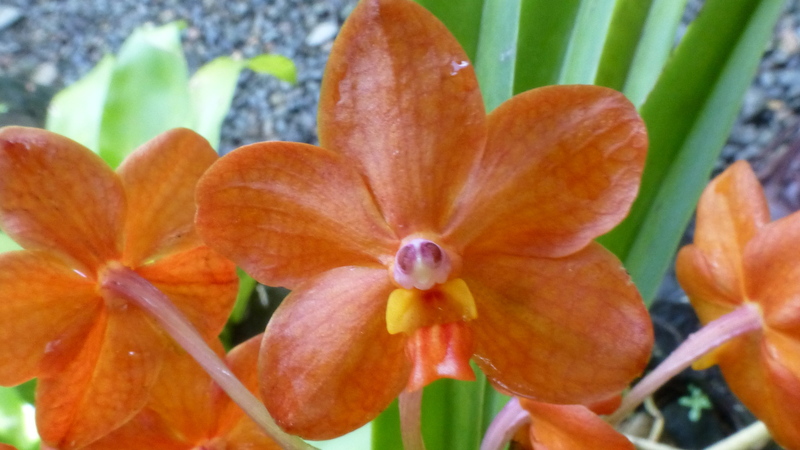 It really enjoys the hot wet summers and less wet winters of Fiji. 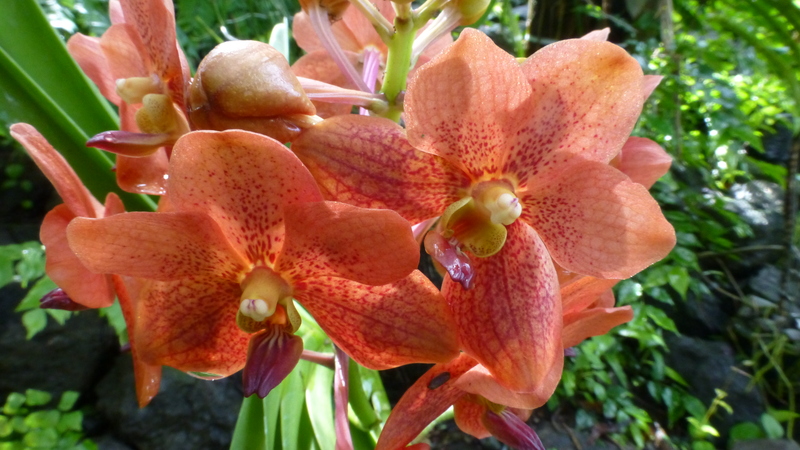 The gardens were begun in the 1970’s by the late Canadian born actor, Raymond Burr, famous for his acting personas of Ironside and Perry Mason. 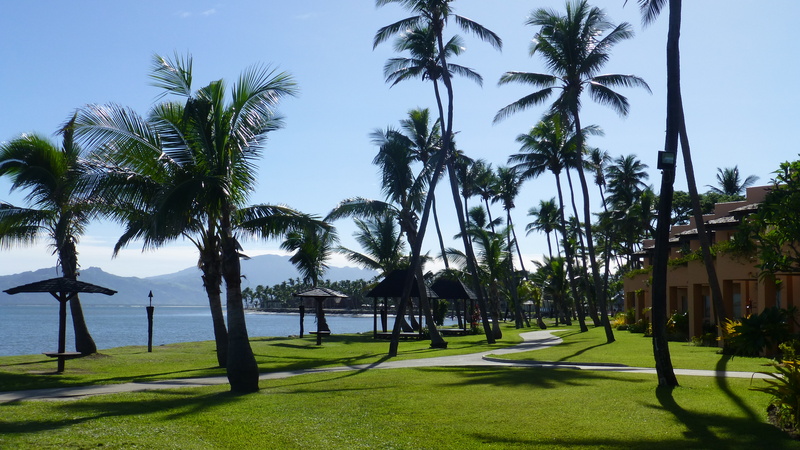 For Burr, Fiji was his second home, away from the Hollywood spotlight. 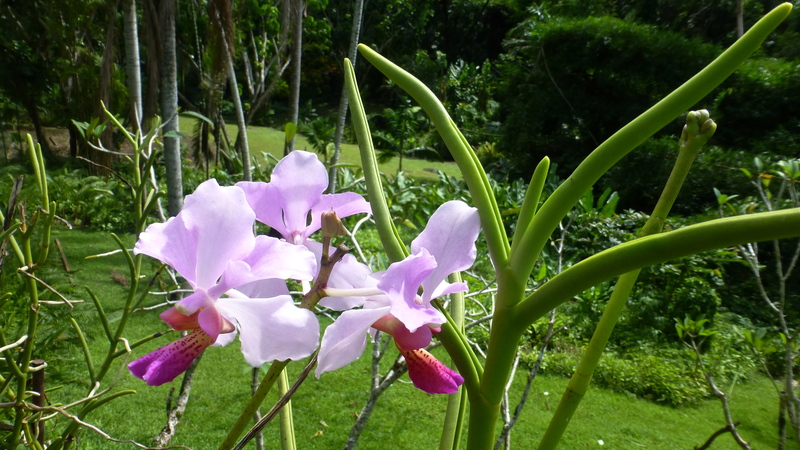 Apart from enjoying time on his secluded ‘hideaway’ on a small Fijian island, Burr and his partner, Robert Benevides, bought this plantation to house their private collection of orchids. 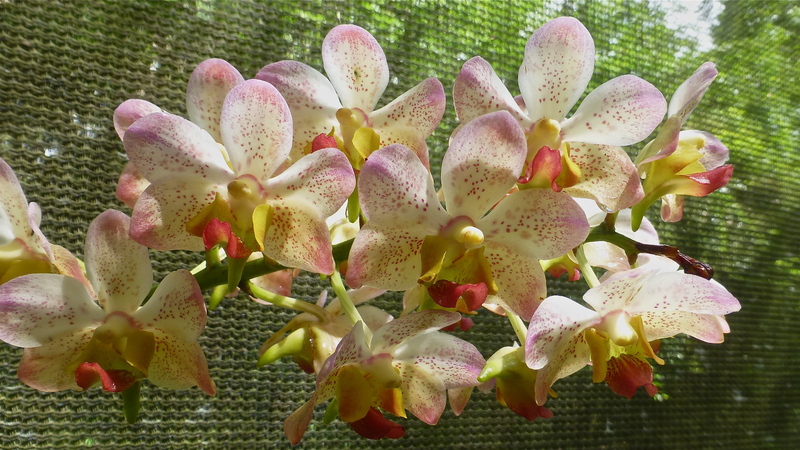 Burr hybridised an estimated 1,500 varieties of orchids before he left Fiji in 1983.
but has been developed into one of the major orchid gardens of the world. 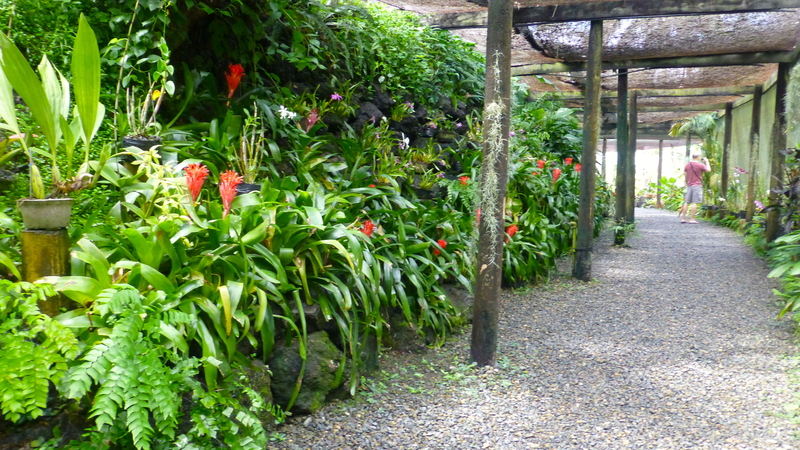 The paths through this botanic wonderland enter through a mesh-covered walkway. 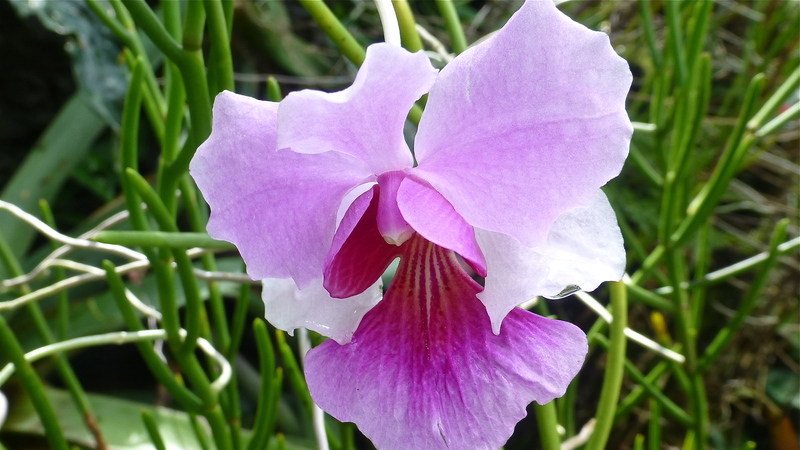 It’s lined with cultivated orchids growing in pots perched on rock walls. 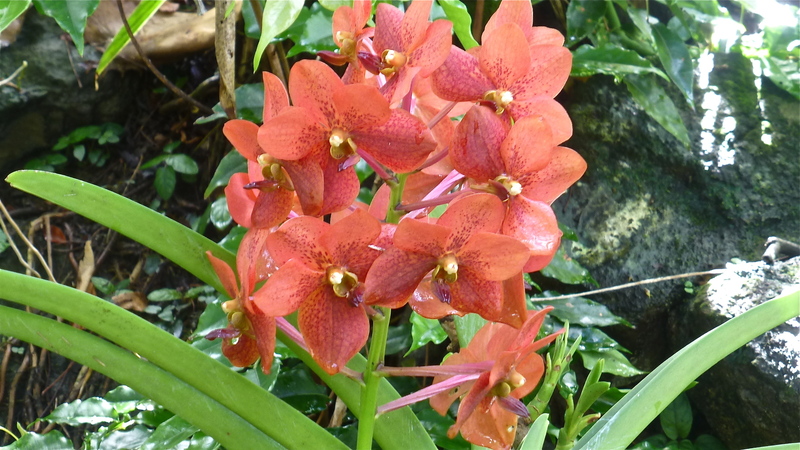 They are surrounded by perennial epiphytes and other plants such as low growing ferns and gingers. 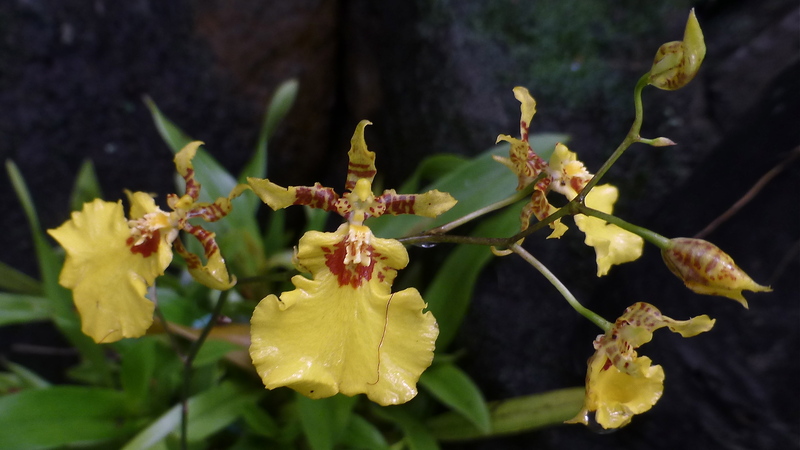 While not all of the orchids were on show, there were indeed many to enjoy. 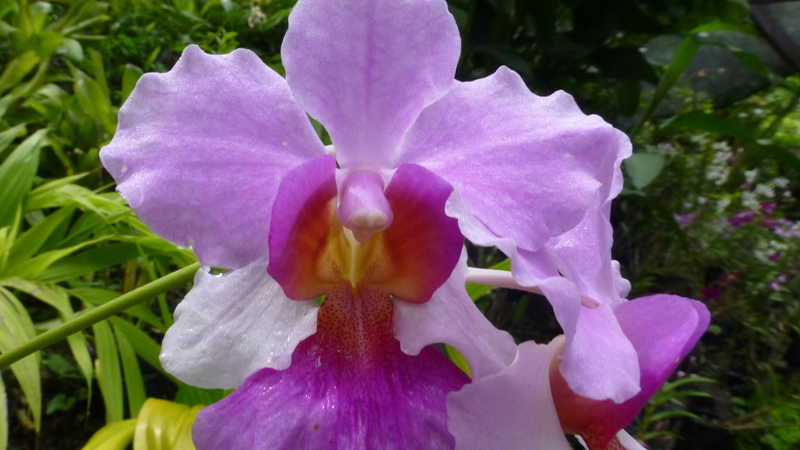 They come in an amazing variety of colours and shapes and sizes – all beautiful. 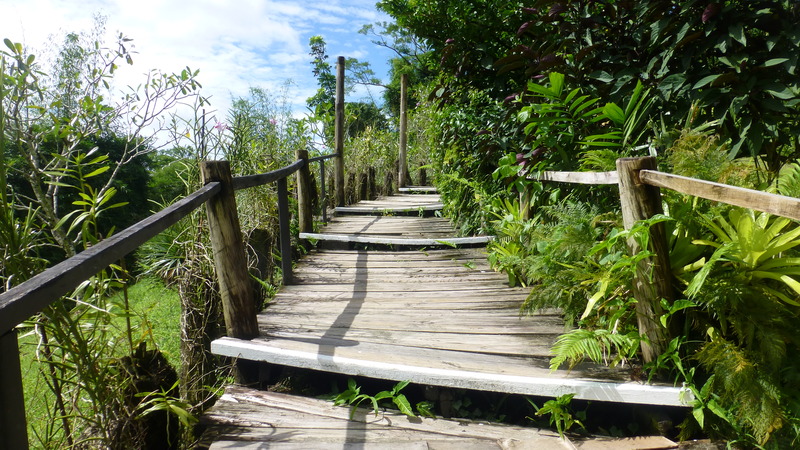 I’ll add a selection so that you can wander along this path with us. We hope that you enjoy them as we did. 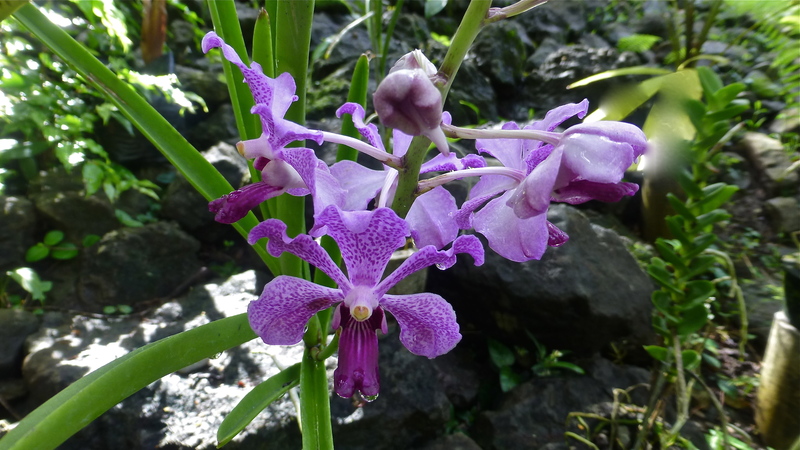 The orchids also had a large ‘supporting cast’ of delightful plants bedded amongst the rocks. 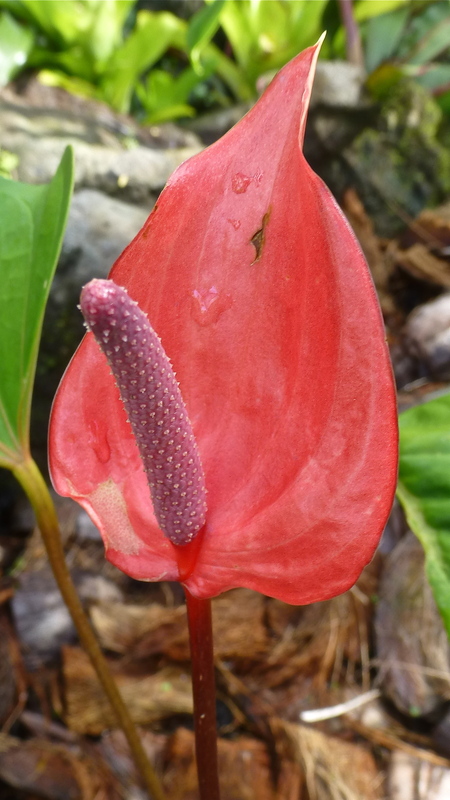 The bright red flowers of Anthurium added a dash of colour amongst the greenery of ferns. 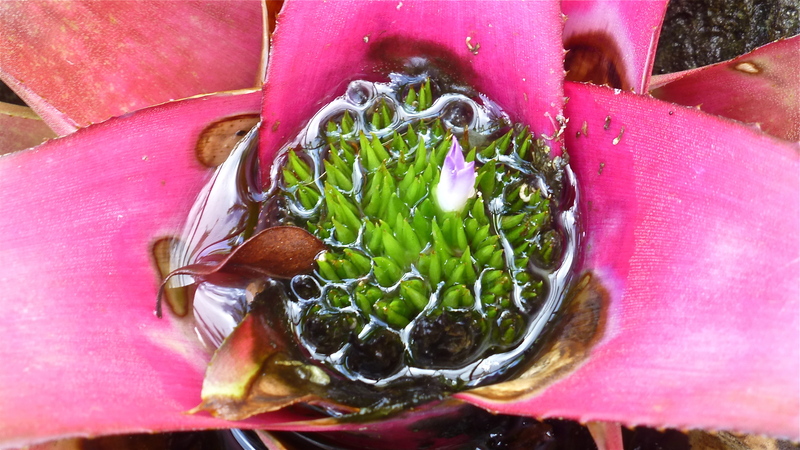 Bromeliads were well represented too. 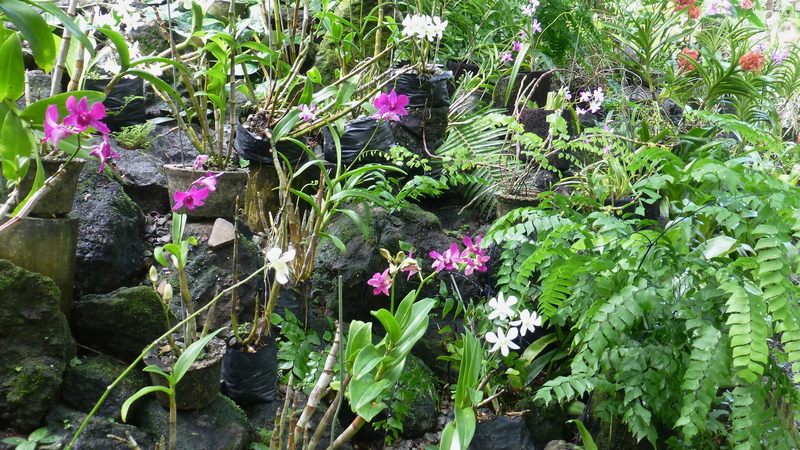 Butterflies added to the delightful experience of wandering in this orchid rockery. 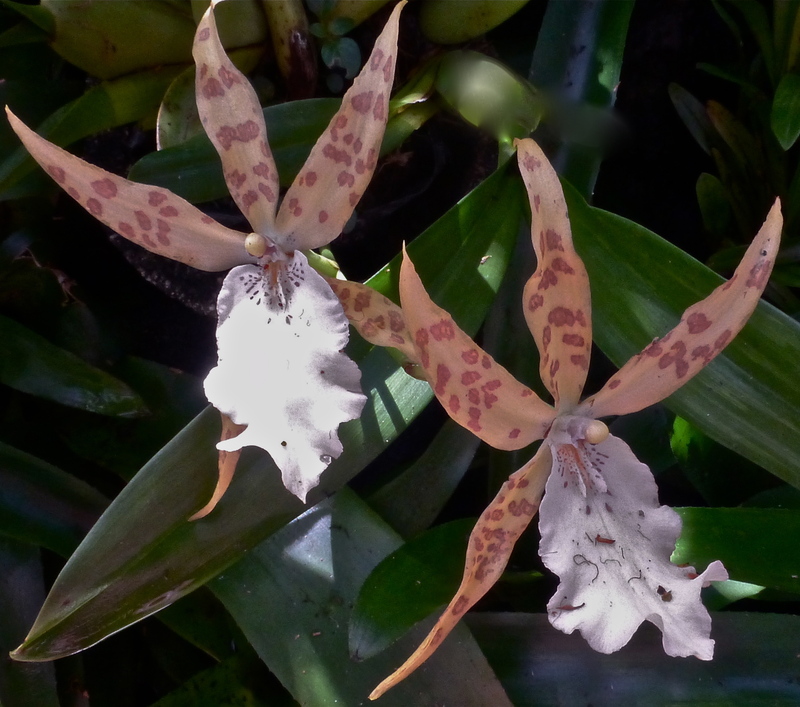 But the real stars of this garden were the orchids. And there many more still to discover. 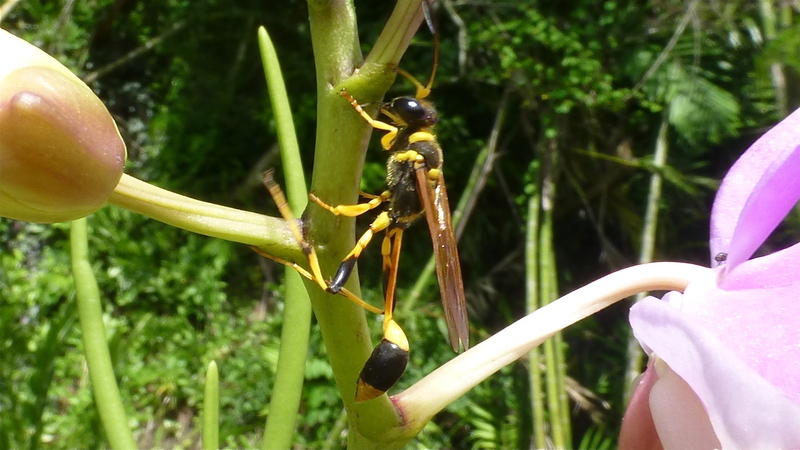 Occasionally something unusual like this wasp takes the attention away from the orchids. 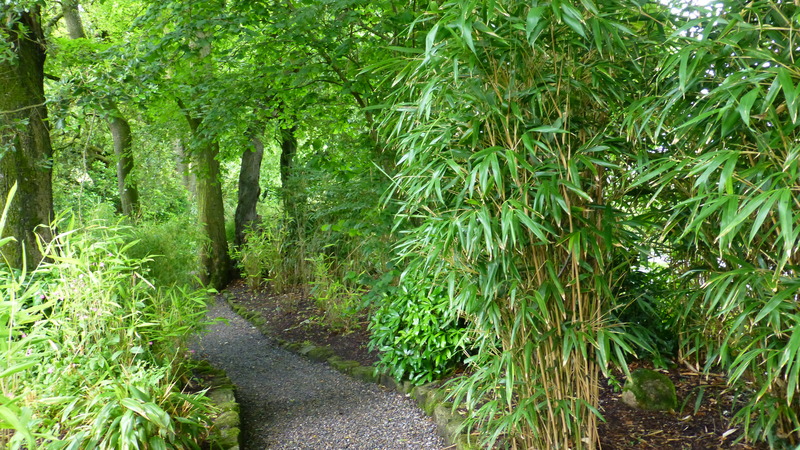 After a leisurely wander through the orchid rockery, the path came to the top of a rise with an open vista towards the hills. 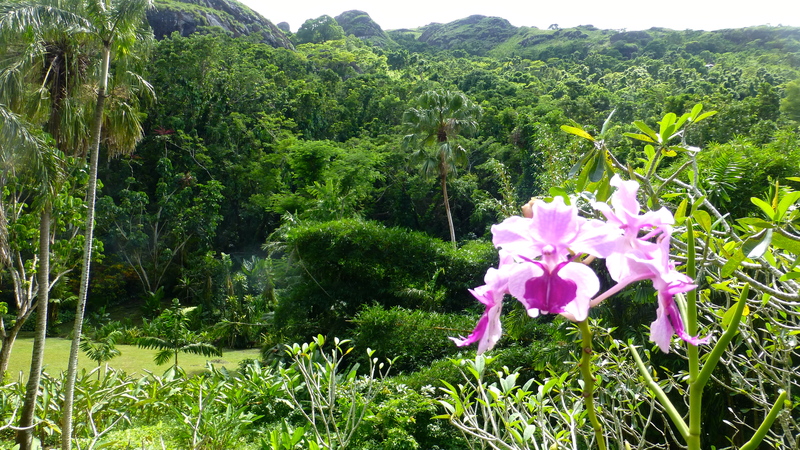 Here there’s a delightful feeling of wildness, with the forested foothills of the Nausori Highlands in the distance. 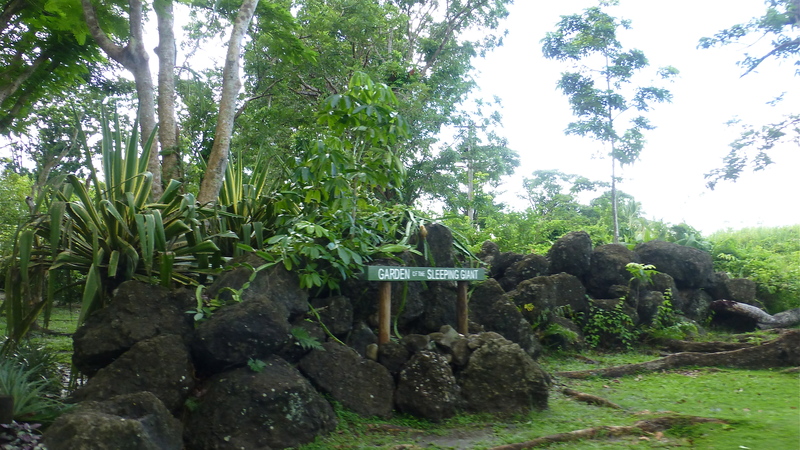 It’s these hills that give the garden its unusual name, as the corrugated ridge above the gardens is said to resemble the body of a sleeping giant. And from here, a boardwalk leads down into the cooler shade of the valley. And we’ll explore that part of the gardens in the next episode. 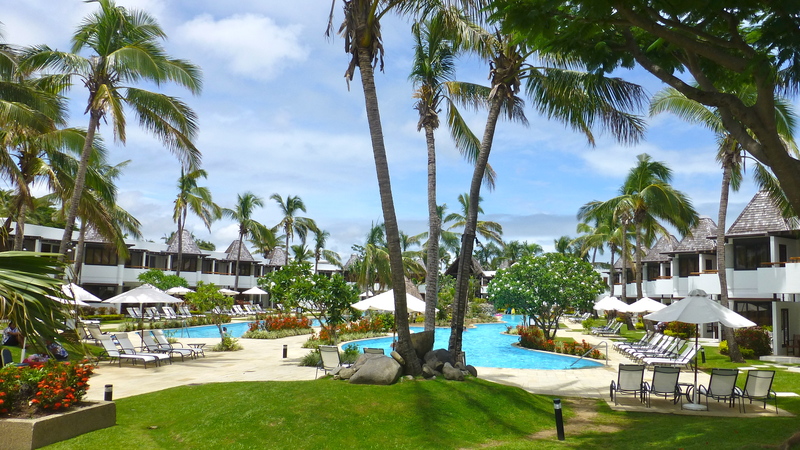 Come with us on an armchair ride to to Fiji – a great holiday destination especially for Australians and New Zealanders. It’s also not too difficult to get to for those from USA and Canada. In March, we flew there from Sydney to Nadi on Air Pacific. 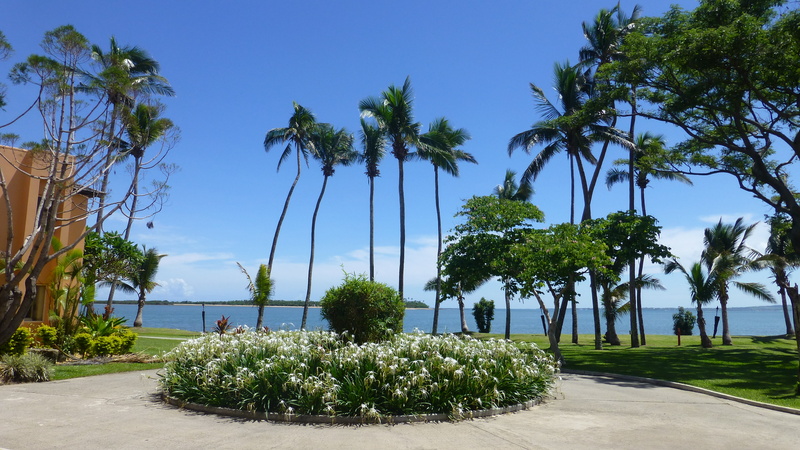 Our first few days were spent enjoying time unwinding and relaxing at the Sheraton Hotel / Resort at Denarau, close to Nadi. 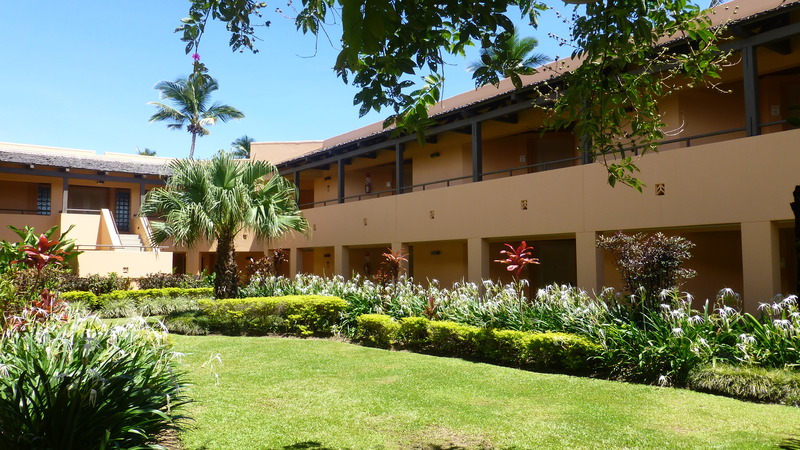 The Sheraton is a lovely resort spread out across many acres of gardens and lawns. All guests here can use the pools and restaurants of three adjoining hotels, The Sheraton, Sheraton Villas (above) and the Westin. 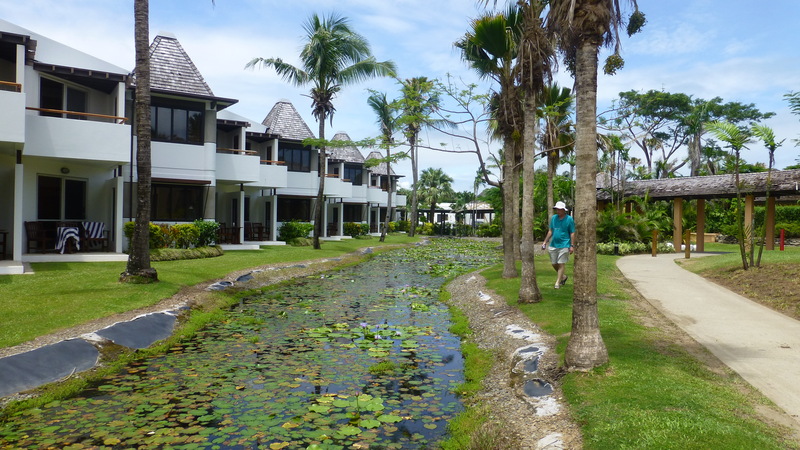 A lily pond separates the Sheraton from the Sheraton Villas. 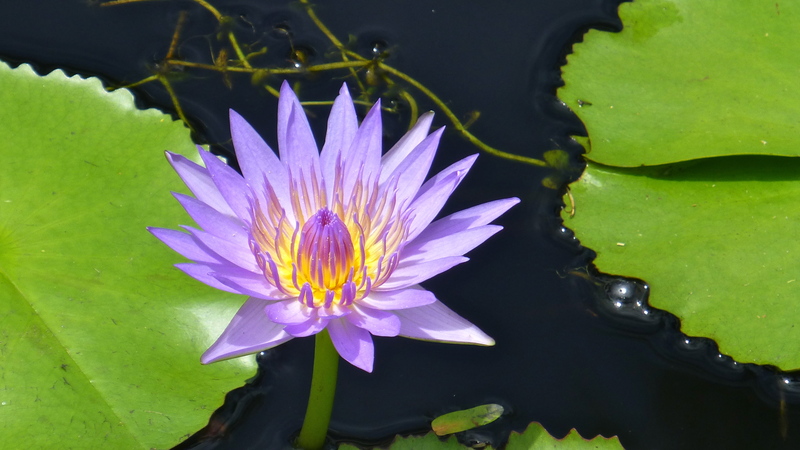 And of course, what would a lily pond be without waterlilies! It’s a cash free environment across all three resorts, all charges being made back to your room. Breakfast is included with a wonderful choice of foods on offer. 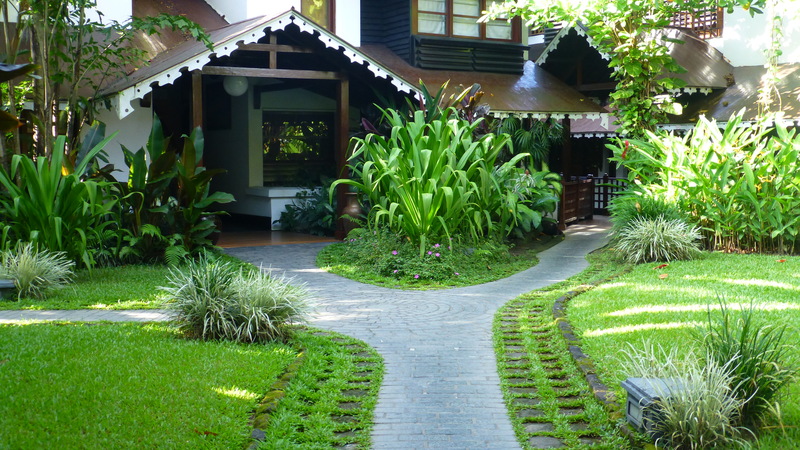 Our room was one of the furthest from the dining room so we had a good walk to and from eating – and time to enjoy the gardens. 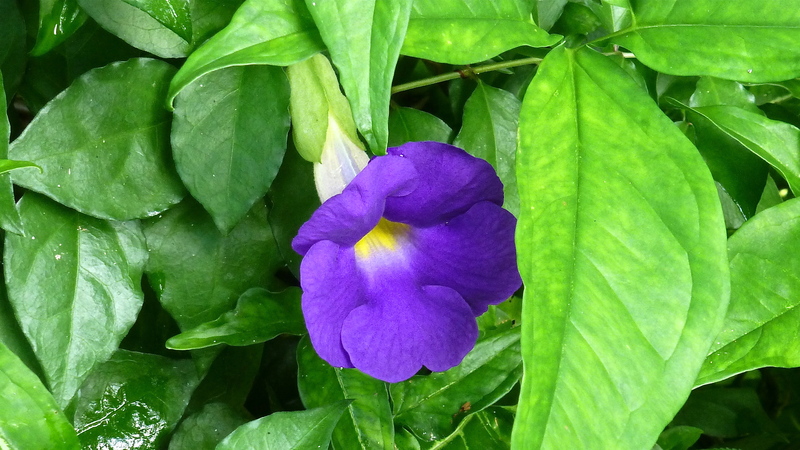 This delightful flower was planted by our small patio. 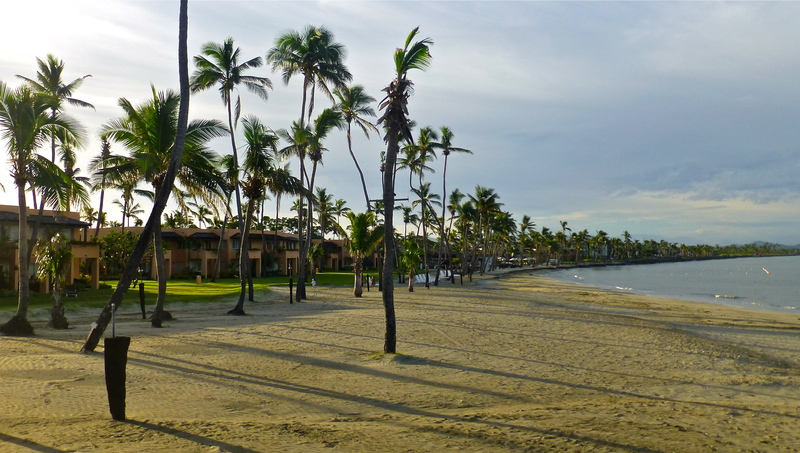 These hotels are a great place for families to have a relaxing holiday. There’s a free kid’s club and plenty of wonderful Fijian ladies who will baby sit the littlest ones to give parents a break for an hour or two or three. Many family groups were of three generations with grandparents having time with their families in a relaxing environment. We really enjoyed seeing everyone having a good time and I didn’t see one grizzly kid the whole time we were there. For those who want it, there’s an excellent golf course and tennis courts. A thatch covered free ‘bula bus’ does a continual loop around this area of hotels and another more conventional bus will take you, for a small fee, to Nadi shopping area. You can use your ticket to ‘hop on hop off’ all day. 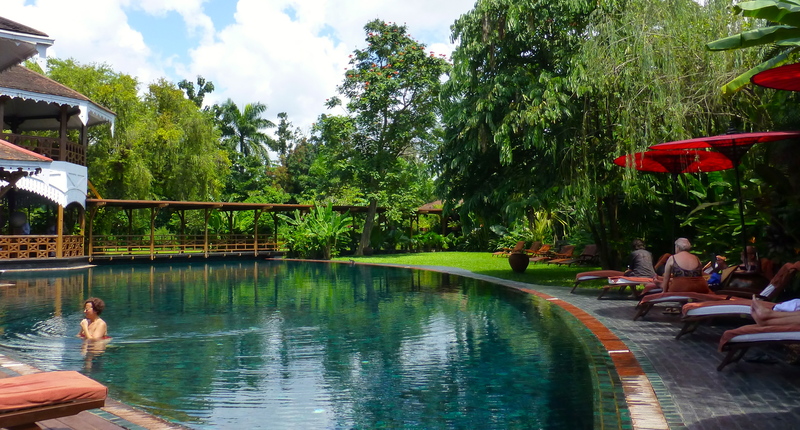 Yes it is hot – it’s tropical – but their are plenty of pools to cool down in. I found that a good book to read in a cool spot in the mid day heat was a good idea! This was our small shaded patio. 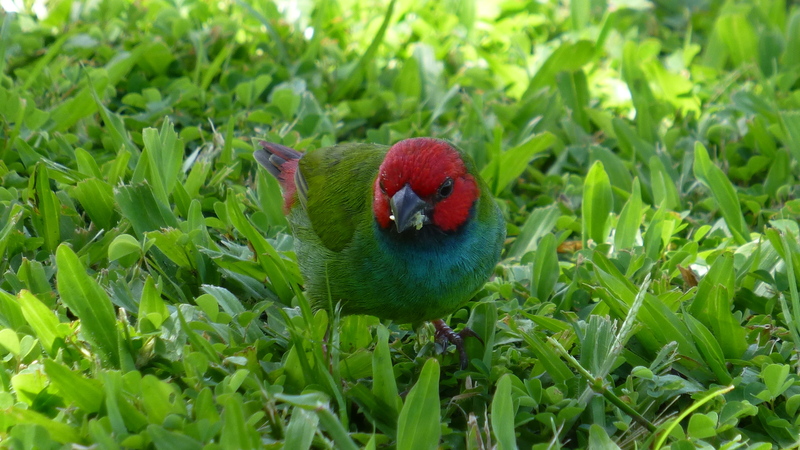 There was always company around the patio from these tiny finches, not much bigger than a blade of grass. These Fiji Parrot Finches move about quite quickly so it was a little difficult to get a sharp closeup shot, but David managed this one. 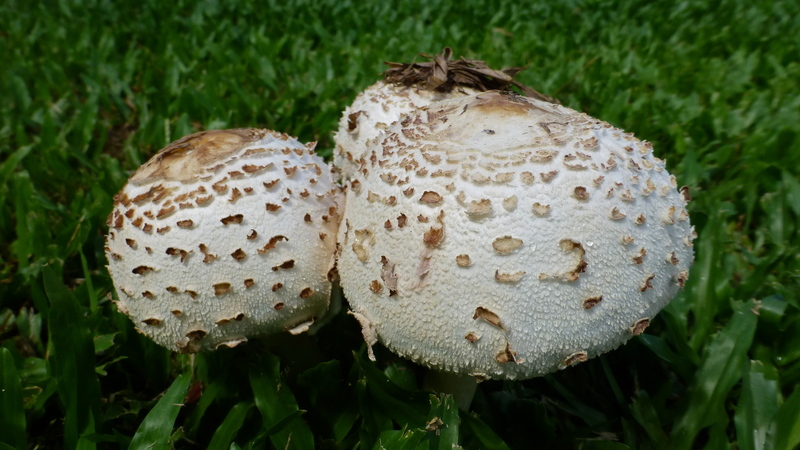 Mushrooms grew in the grass nearby. Edible? I don’t know but I don’t think so and I wouldn’t like to try. The delightful small wedding chapel was close to our room but its not in operation at the moment. Cyclone Evan blew away much of the thatch on the small side shade area. Repairing rooms has been a higher priority for the management. 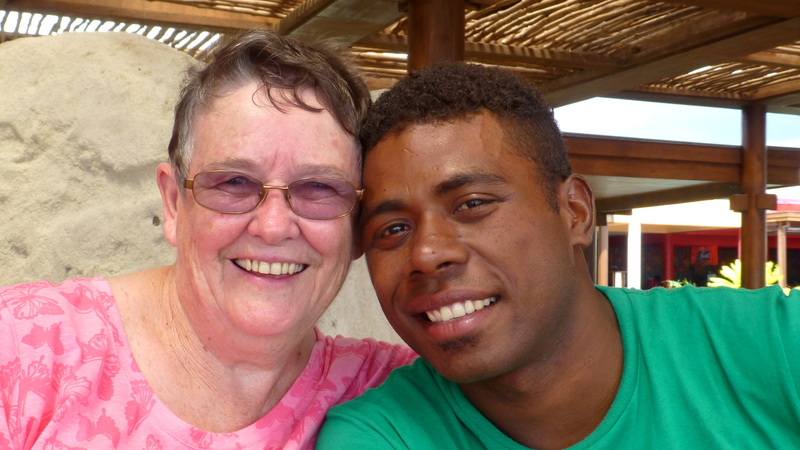 Whilst in Nadi, we had the opportunity to catch up with Siti, a most delightful young man who has been a part of my life for almost ten years. It was amazing how cool Siti was whilst I sweltered in the mid day heat! So how did this handsome young man come to be part of our lives? In 2003, David and I visited the outer Yasawan islands in company with a group of Melbourne Rotarians. While they helped the village people on the island of Matacawa Levu to paint their church, I spent quite a bit of time in island schools and getting to know lots of the local children. I soon came to realise that the children of these poor, far outer islands had very little chance of a good education beyond basic primary school. Most had never been to the main islands. They had never seen a car or traffic lights let alone had a secondary education. Their families survive on fishing and growing vegetables and coconuts. After discussion with the Rotary group, it was decided that we could set up an education program through Rotary to enable some of the brightest of these young people to have a secondary education on the main island. My Siti was the first of these young people and he has made the most of the opportunity that I was able to give him. He completed high school with flying colours. I then supported him through his tertiary education in IT. 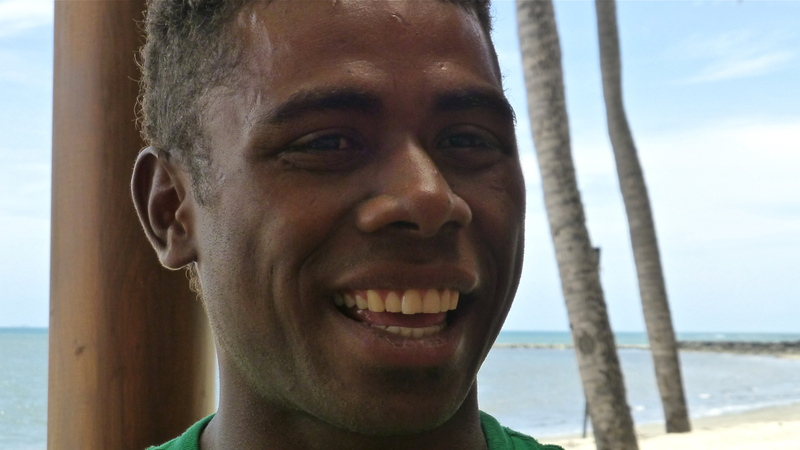 He’s now working in Lautoka and is a wonderful example of the power of education to change life chances. Other young students from the Yasawans have followed in his footsteps and are also gaining the benefits of an education. 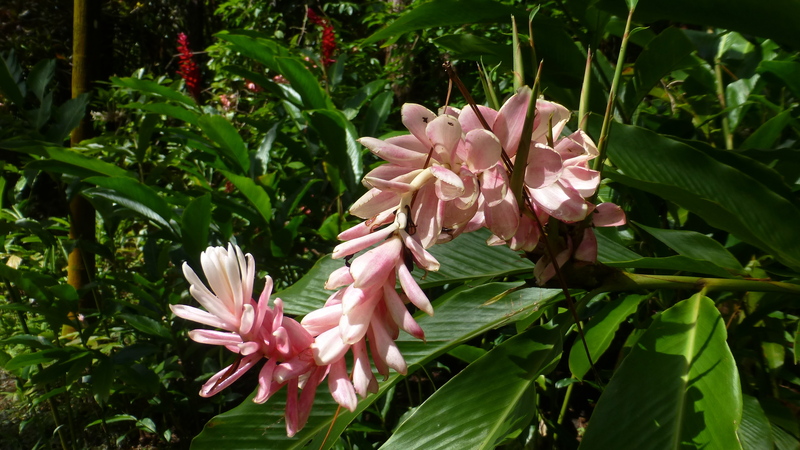 Now come with me on my walks around Denarau – camera in hand of course. 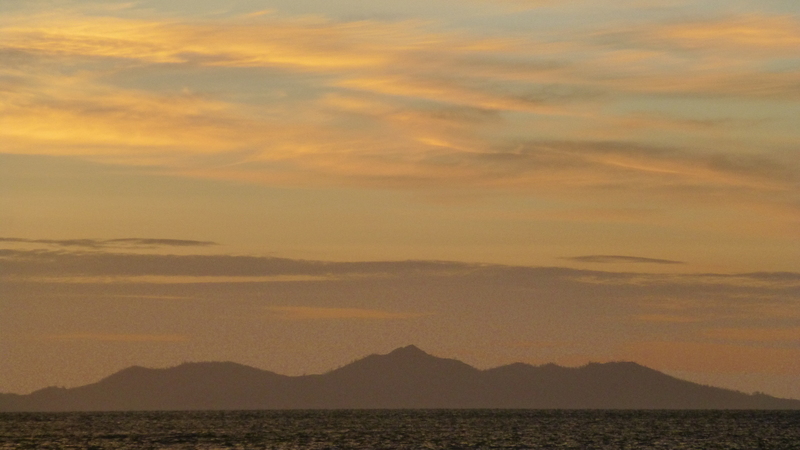 In the pre-dawn, the view from the breakwater at the end of Denarau peninsular takes on a mystical aura. 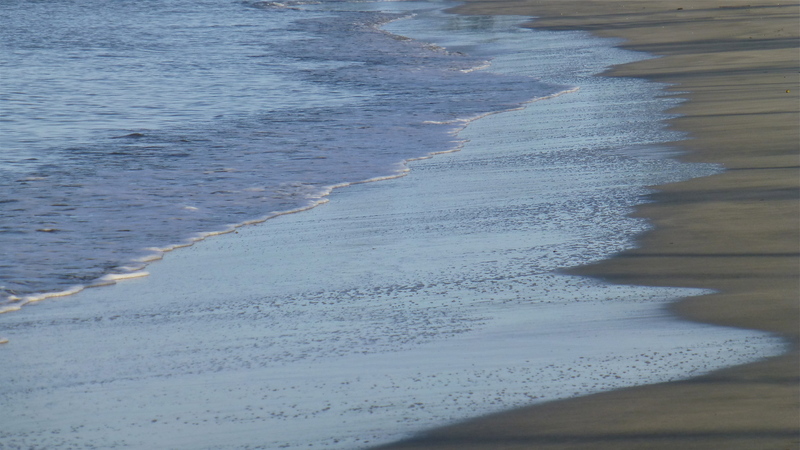 There’s something very calming about the gentle ebb and flow of water on the beach in the early morning. This beach was much wider and longer before Cyclone Evan washed much of it away in December 2012.. Here was another photographic challenge. 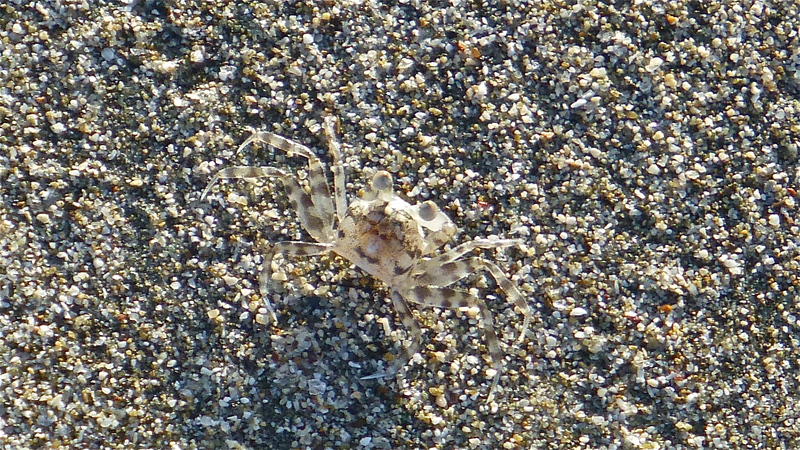 and their camouflage against the sand is quite extraordinary. 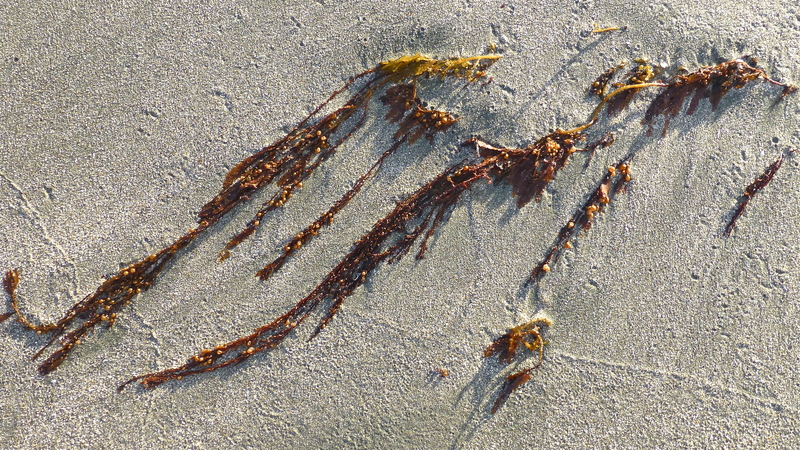 I just love looking for abstract patterns on the beach. 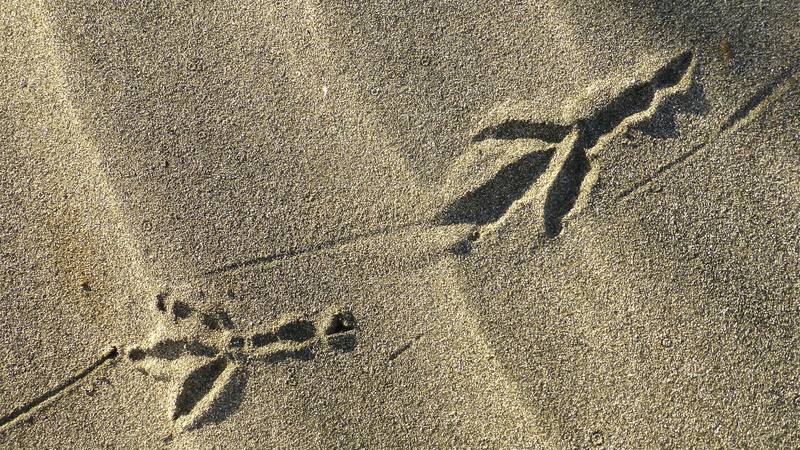 And in the early morning there are lots of interesting footprints in the sand. This is the tropics! Sometimes a quiet walk turns into a run for cover as a rain shower descends over the scene. 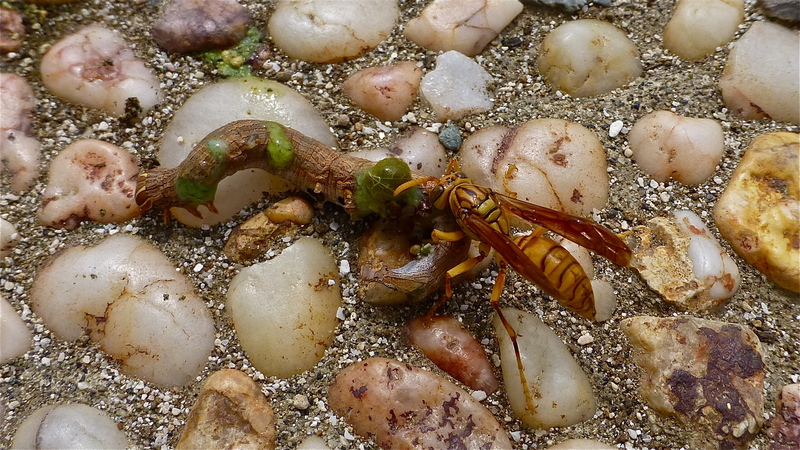 This rather ghoulish photo of a wasp attacking a caterpillar has an interesting story. David and I were walking down to another resort late one afternoon when suddenly a caterpillar came swinging down to the ground on a long silken thread. Just as David drew my attention to it, this wasp wizzed in and attacked. It then proceeded to bite several holes in the poor old caterpillar in which, we guessed, to lay its eggs. Macabre! 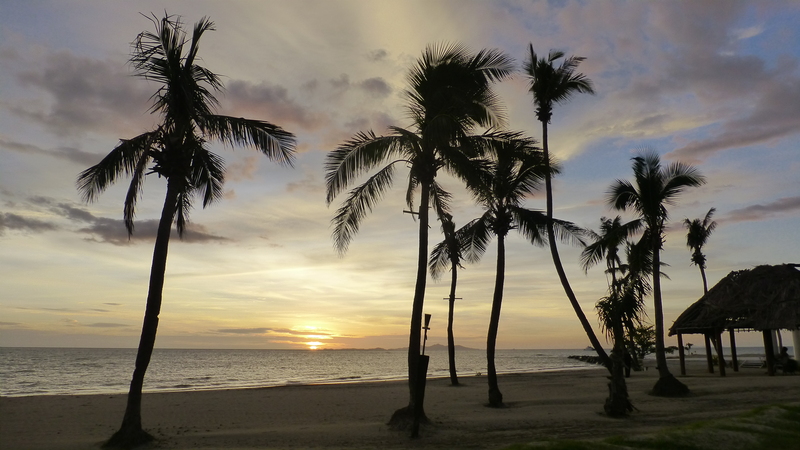 Late in the day is a magical time here on Denarau. It’s much cooler and the sun setting over the sea is a ‘must watch’ event. 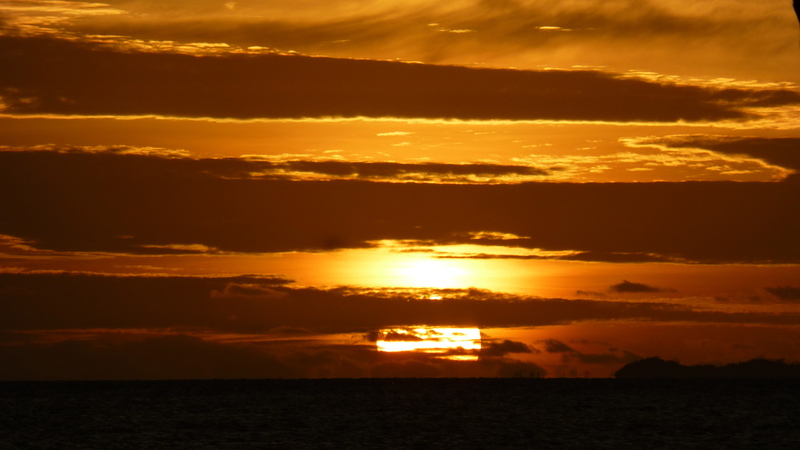 Each day the sunset scene is quite different, especially when viewed from different vantage points. Finally the sun goes down and a tranquil air of cool and calm descends on the place. It is idyllic. 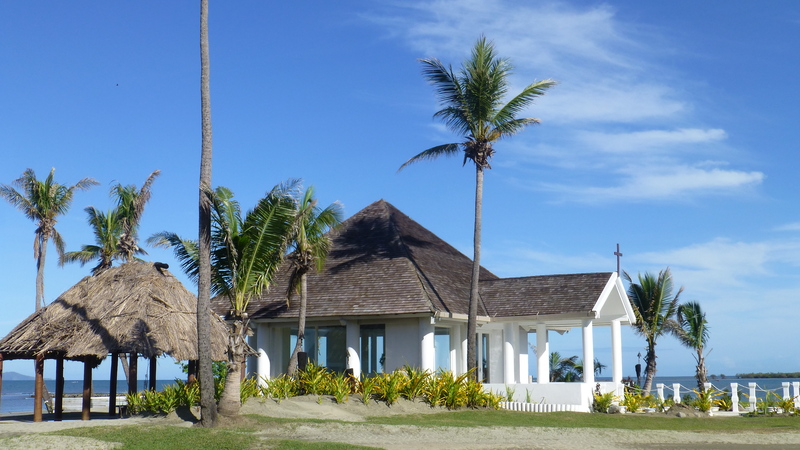 But we didn’t stay here for the whole of our time in Fiji. 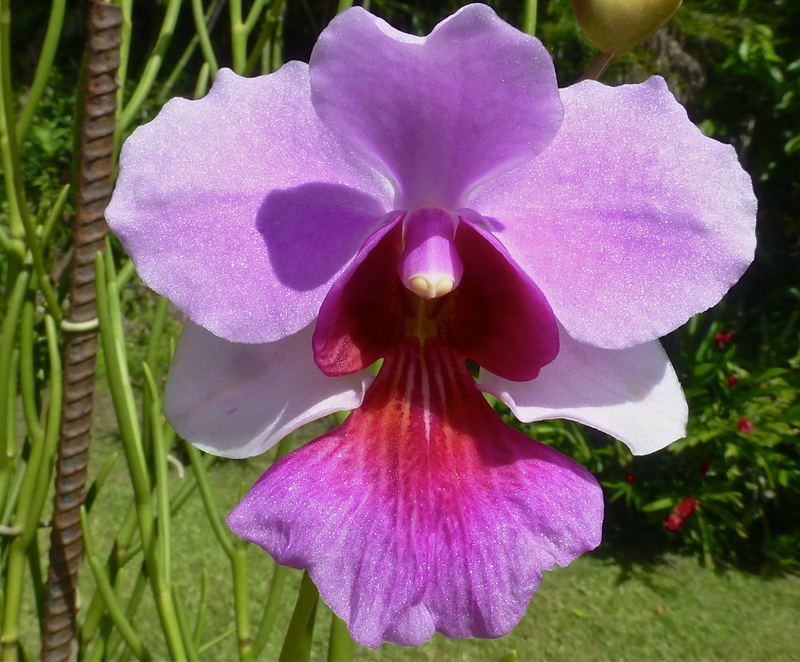 The purpose of the trip was to cruise to the Yasawan and Mamanuca Islands. We’ll start that adventure in the next episode. We had what can only be described as a ‘soft landing’ in Burma / Myanmar! And I don’t mean at the airport. I mean at our hotel – our home away from home for the first couple of nights. We didn’t stay at one of the large, rather impersonal hotels you can find in any big city centre anywhere in the world. No, we stayed out in the quiet, tree lined streets of the Embassy area. In fact we stayed where the British Governor lived when this country was a province of the British Empire, ‘The Governor’s Residence’. Thank you ‘Captain’s Choice Tours’ – this was a really good choice. 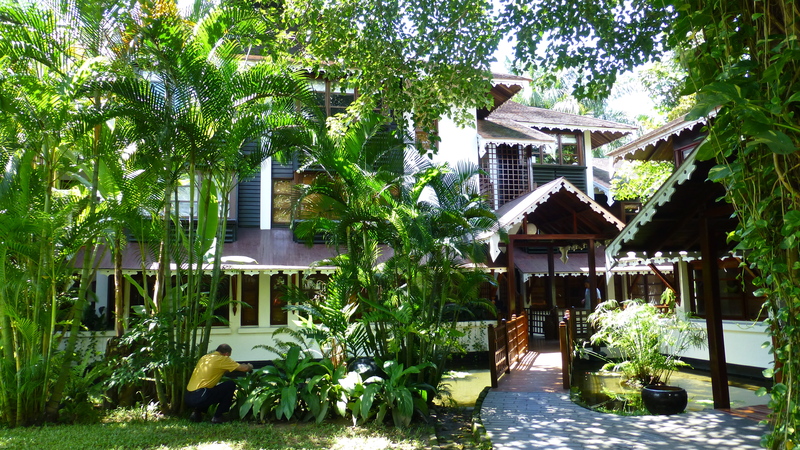 This imposing teak mansion, beautifully restored and set in a tropical garden, is a truly delightful, small hotel. There are no ‘plastic smiles’ here. 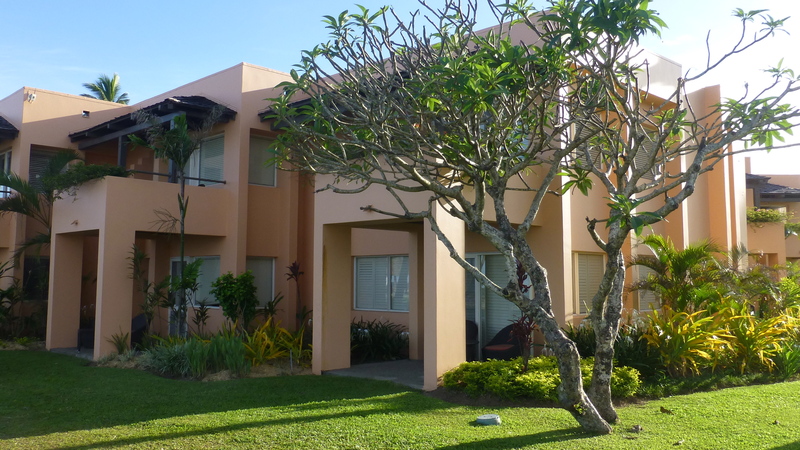 This is a place where you are instantly made to feel at home, part of an extended family. 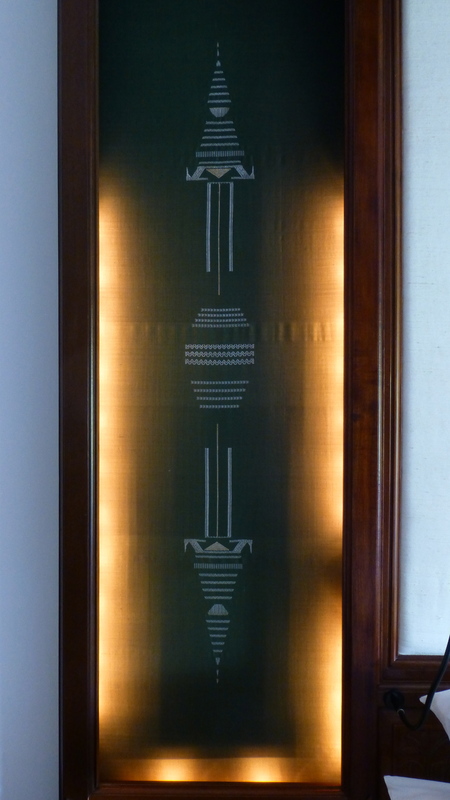 Here we were introduced in a very special way to the genuine warmth and hospitality of the Burmese people. How lucky were we! After a refreshing drink and warm welcome, David and I were taken to our room by a very friendly man called Thomas! Well he would be friendly with a name like that, wouldn’t he! It turned out that Thomas, a Belgian, is the Manager of the hotel, and an excellent hands-on Manager at that. He’s well respected and liked by all the Burmese staff and instantly liked by his guests. It did not take us long to learn what an excellent establishment he runs. Thank you Thomas. 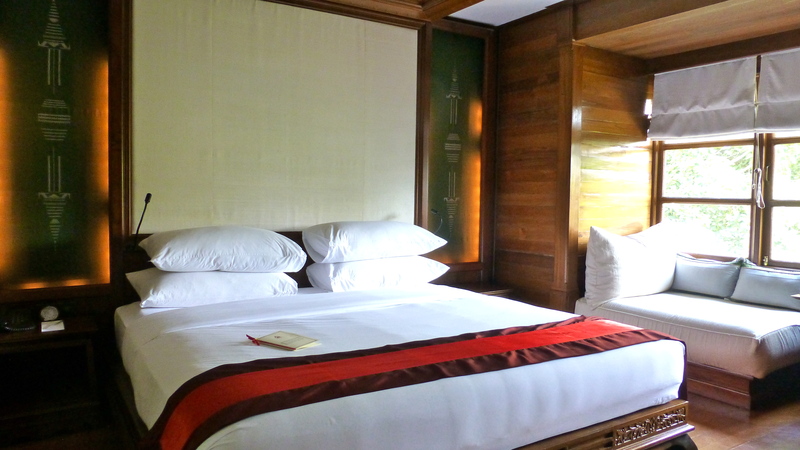 Our room was nothing like the usual city hotel room… this one reflected the country we were in with teak walls and floors and Burmese carvings and decorations. The bedside lighting was stunning. Soft lighting surrounded an abstract art work that represented the many Pagodas we were to see in this mainly Buddhist country. 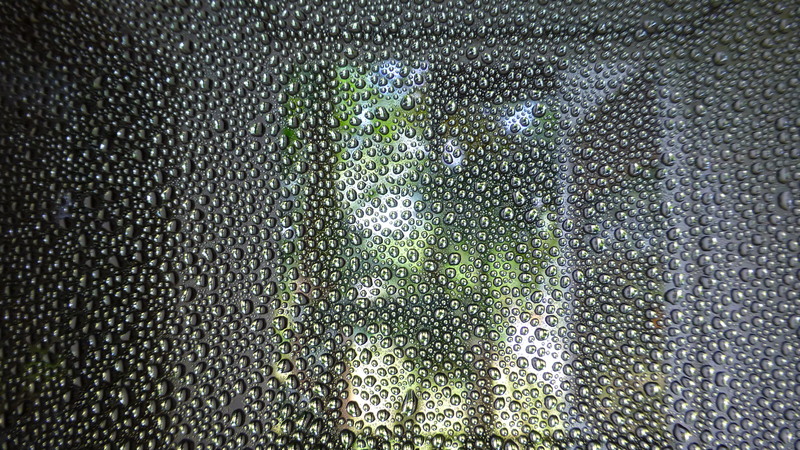 The view through the balcony door was ‘abstracted’ by condensation – the cool inside air condensing the hot, humid outside air. Delightful – and so was the cool air after the heat outside. 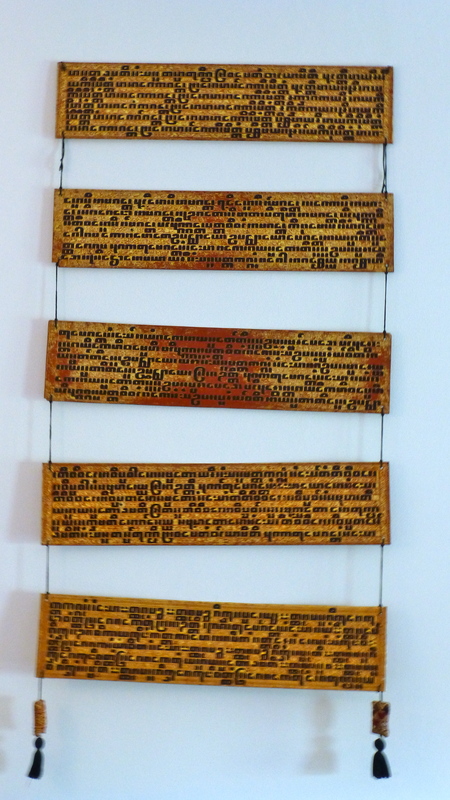 All the room decorations were of Burmese origin, this one introducing us to the Burmese language script. 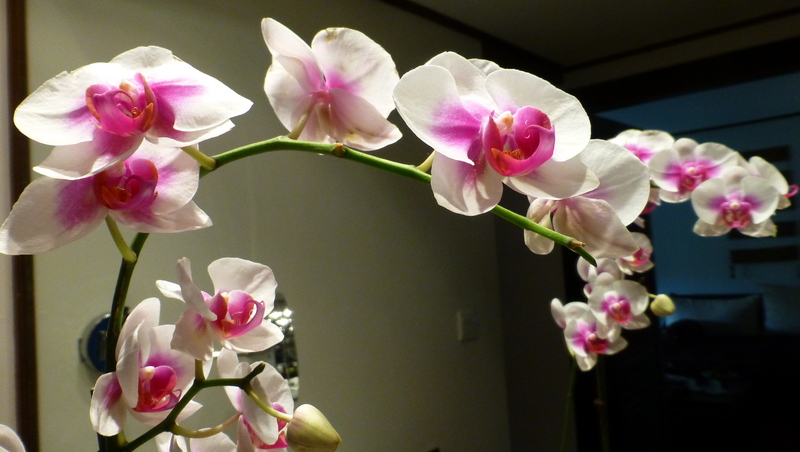 A lovely touch – in many Asian hotels, orchids feature in main room displays, but this was the first time we’d had a magnificent orchid like this in our bathroom! In the bowl of fresh fruit in our room was this rather interesting one that neither of us had seen before. 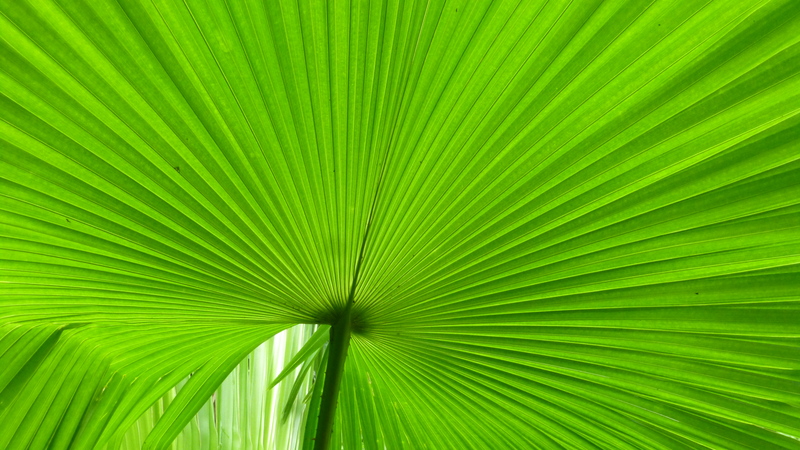 It comes from a very short stemmed Palm Tree, native to Brunei. The leaves of the tree are up to 6 m long. 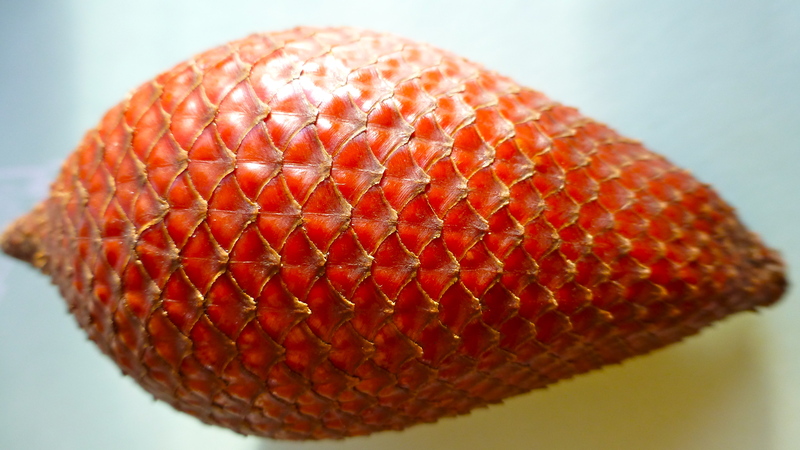 The unusual, scaly skinned fruit grow in clusters at the base of the stem. The flesh of the fruit is both sweet and acidic and, to our tastes, it’s not very nice. 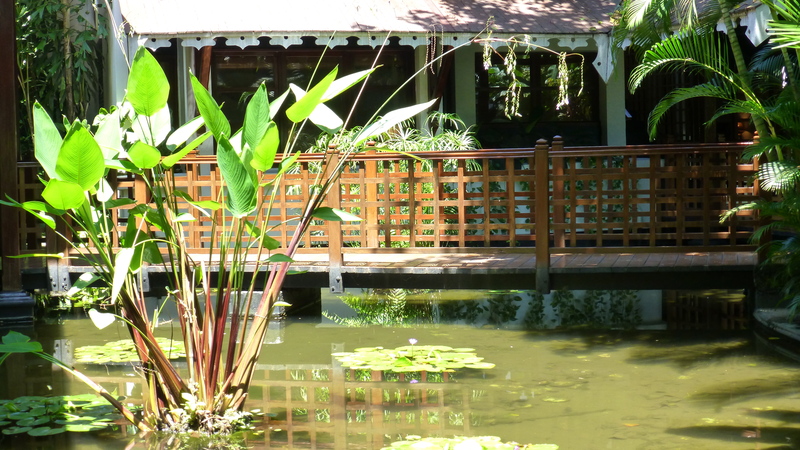 One of the very special features of this boutique hotel is the lush tropical garden. We were able to meet some of the gardeners and thank them for their work. We got smiles all round when we greeted them with the words ‘Mingala ba’ which is the everyday general greeting meaning something like Hi or “Good-day!” We’d also learned the word for ‘thank you’ which we translated phonetically as “Cheese Zoo” . They all seemed to understand – and smile! 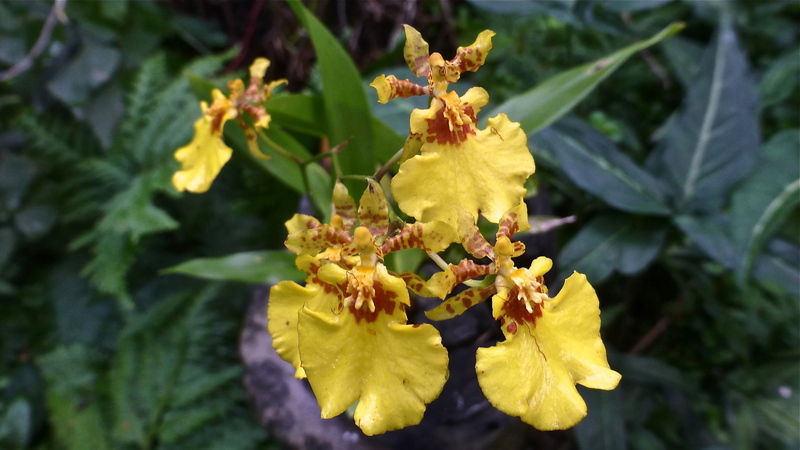 They are very proud of their gardens and were delighted when we took so much time to inspect the plants and photograph some which were new or unusual to us. 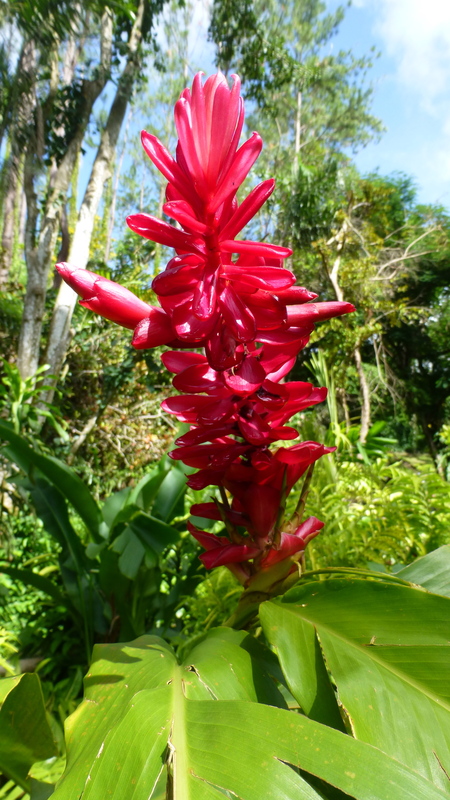 In fact, the garden was totally tropical, unlike ours in Canberra, so there was much to enjoy. David deep in the garden looking at a ‘bat flower’ plant – something I had never seen before, nor had many of our group. 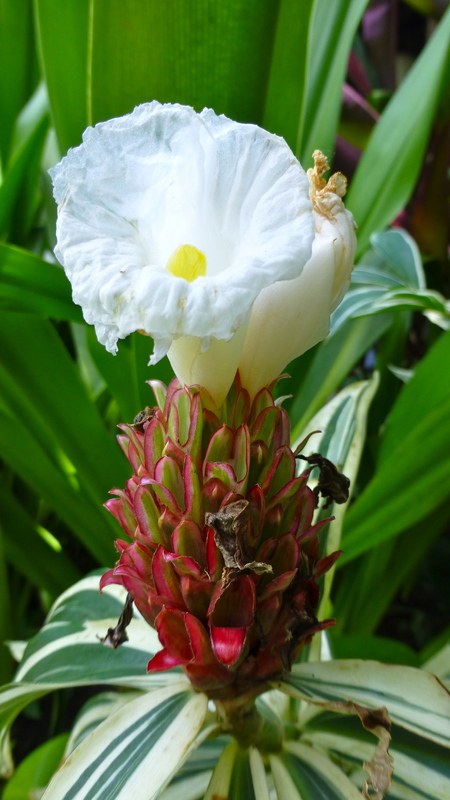 I was totally fascinated by this flower. There were many in the garden but this one shows all the various stages of the seed heads in one shot… new unopened ones, full heads with their clusters of seeds nestled in a ‘cup’, and some that have dropped their seeds and are finished, hanging down. 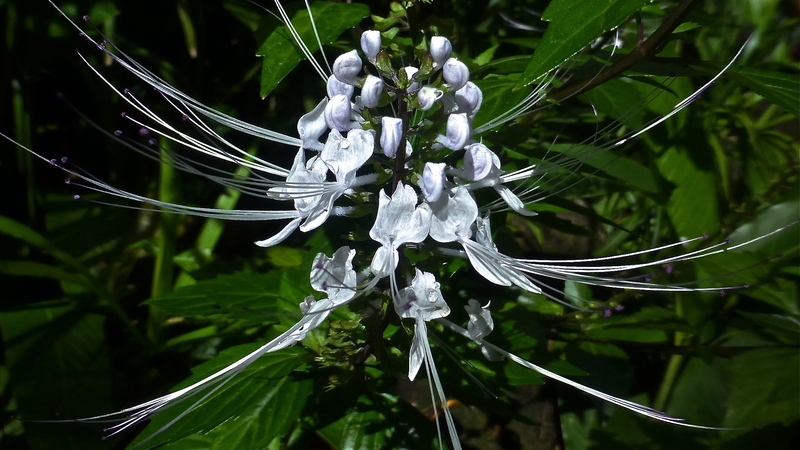 And those ‘whiskers’ were a real delight – far longer than I could get into this photo. 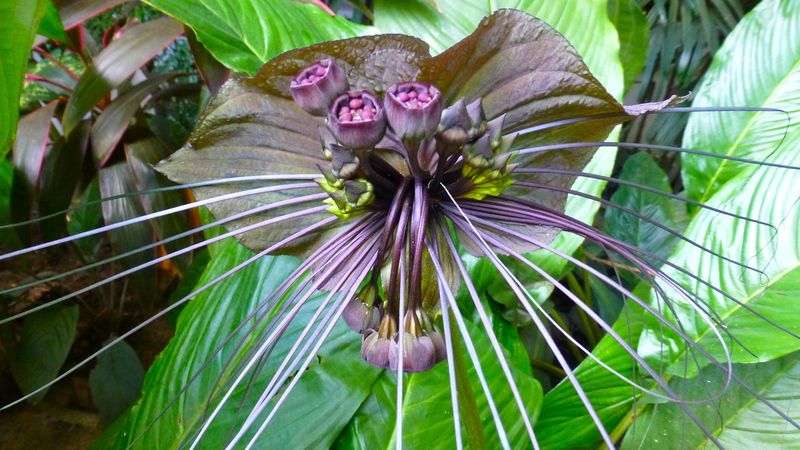 The plant is also called dracula-flower, but I think bat flower is more descriptive although, when we showed the plants to others in our group, they renamed it ‘cat flower’. 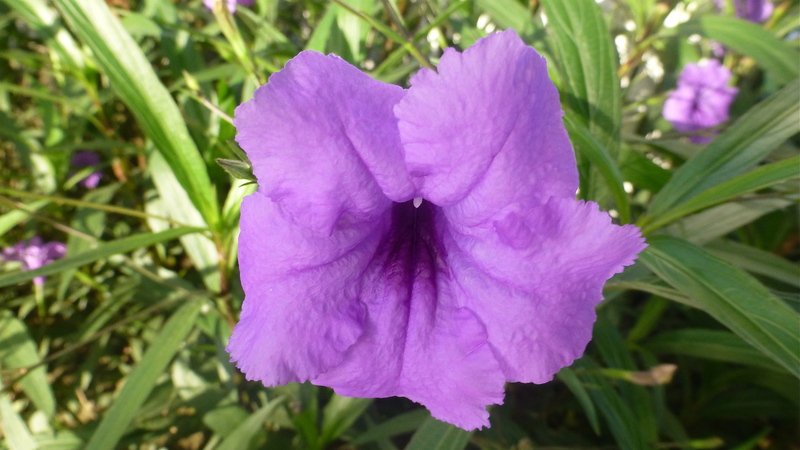 It comes originally from Thailand. 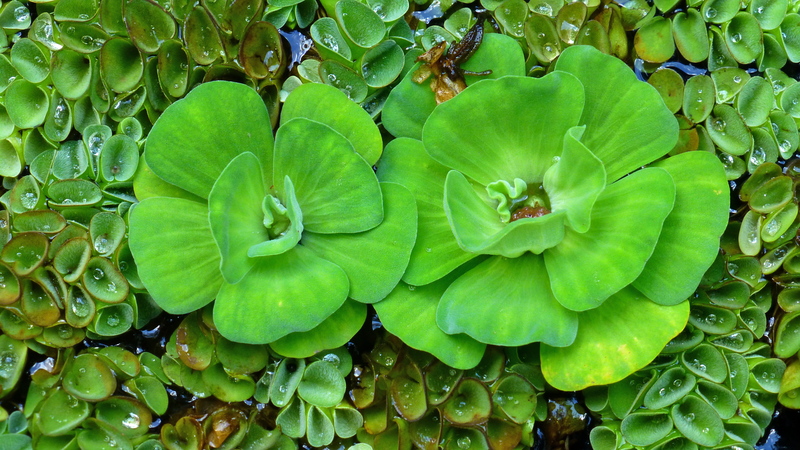 In the lily pond below our room, was this water loving member of the ginger family. 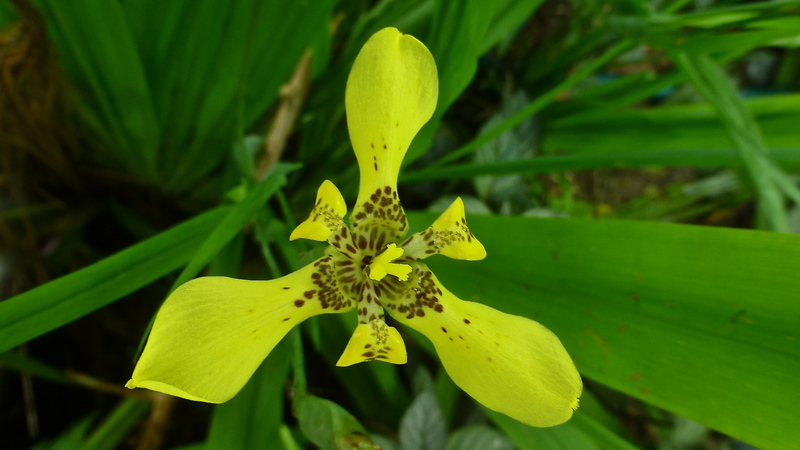 We don’t know what it’s name is but, apart from being a delightful vertical addition to the usual pond plants, it has the most amazing ‘fishing rod’ flowers. 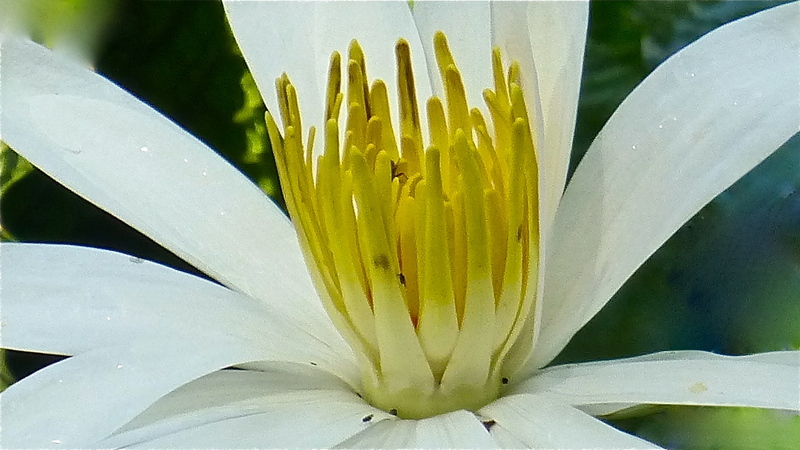 It was difficult to get a good photo of this delicate, unusual flower with so much light behind it, but I tried! 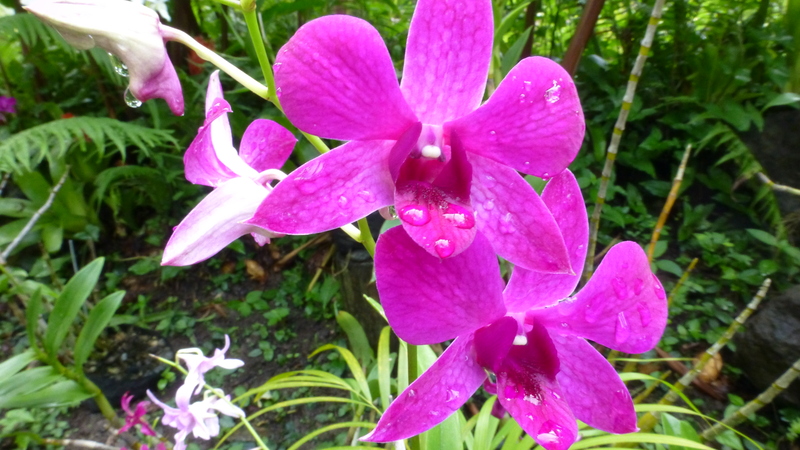 I just love plants that hold drops of water and there were many of those in this hot, tropical garden. 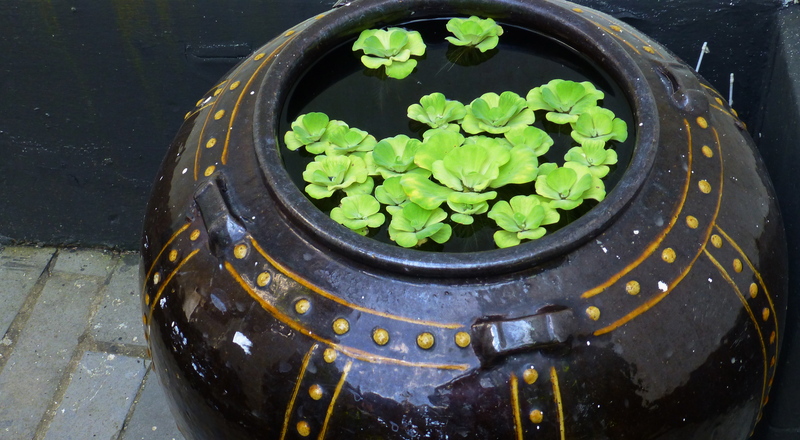 These water lettuce were growing on the top of water in a decorative pot of which there were several dotted throughout the garden. Water pots are very important throughout this country. In the villages and some towns where water is not ‘on tap’, water is put into pots, the sediment allowed to settle to the bottom and the water on top is then used for drinking water. We were to visit some pot making families later in our trip. Here, the pots were decorated and used as garden ornamentation. 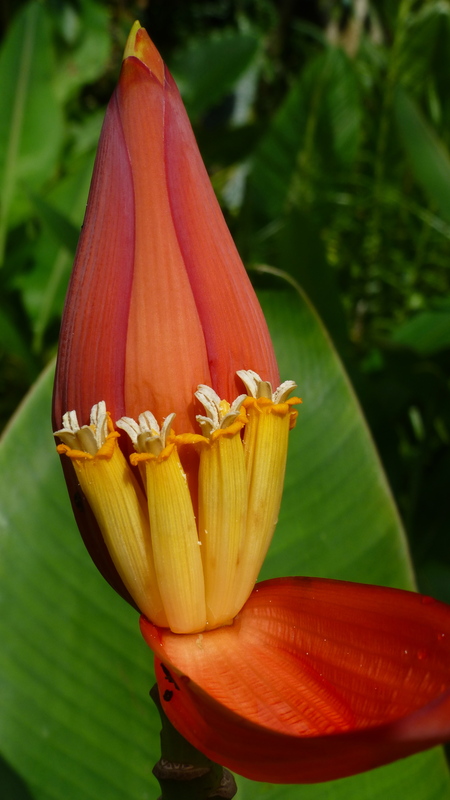 We were lucky to see flowers on this ginger – it had almost come to the end of its flowering period. 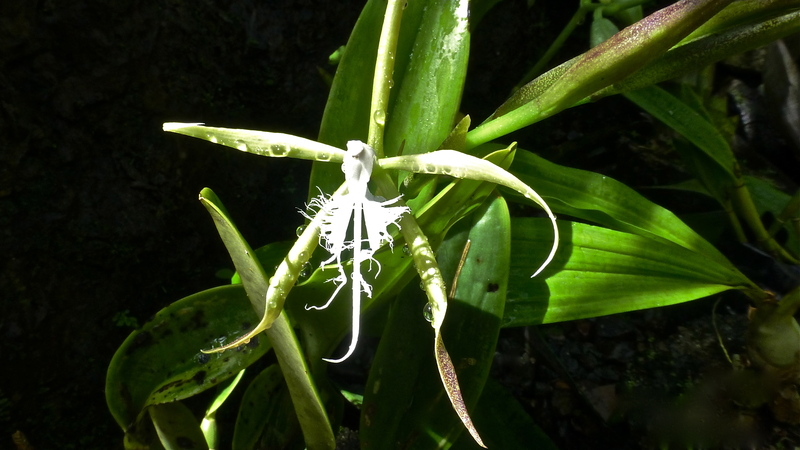 A fascinating plant. A popular place in the garden is the pool. 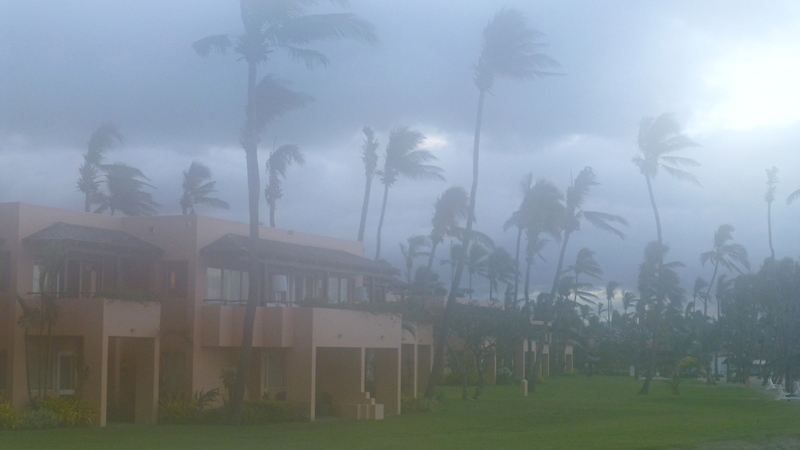 It winds around the verandah and under the entrance bridge. 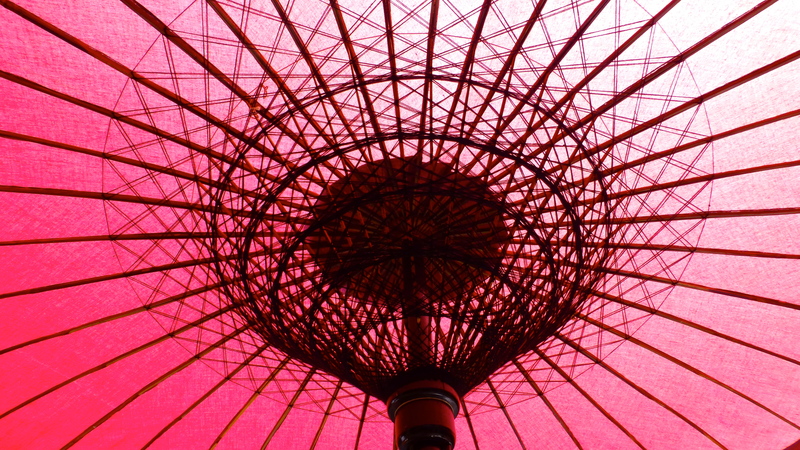 The intricate workmanship of these garden umbrellas is all hand made! We saw them being made later in the trip. 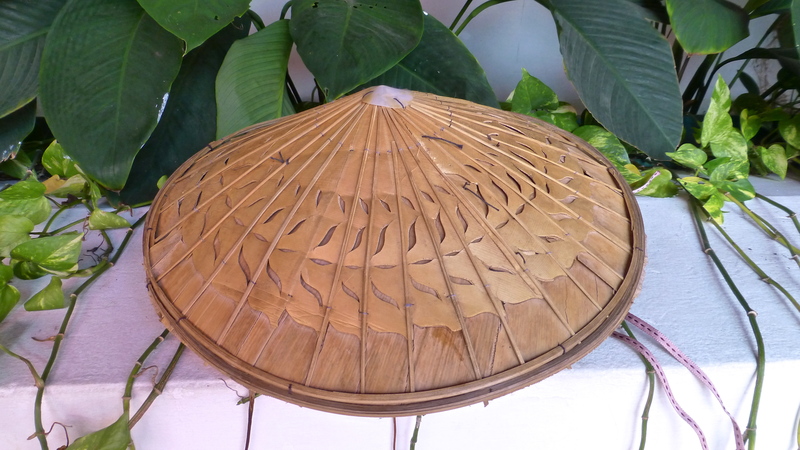 These bamboo hats were available for those who wanted to sun bake. Not for us in that force, hot sun! We chose the cool of the verandah. 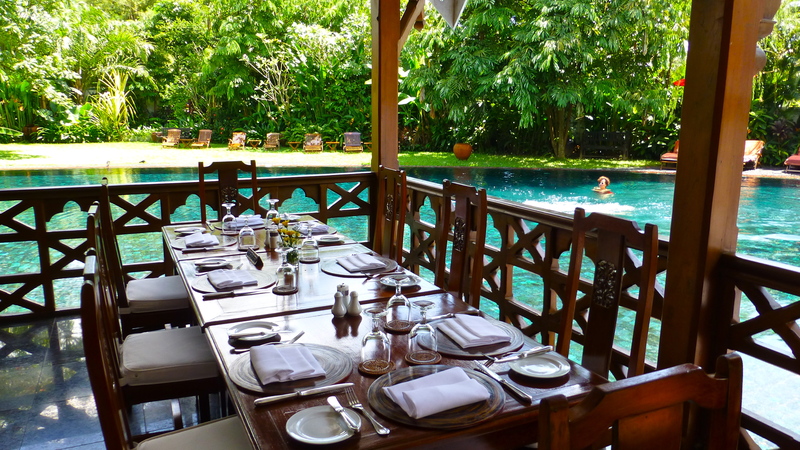 And now, can I invite you all to have a refreshing lunch by the pool in the cool of the verandah of the main ‘residence’! The food served in this hotel is exceptionally good – fresh and beautifully presented. This was David’s lunch. 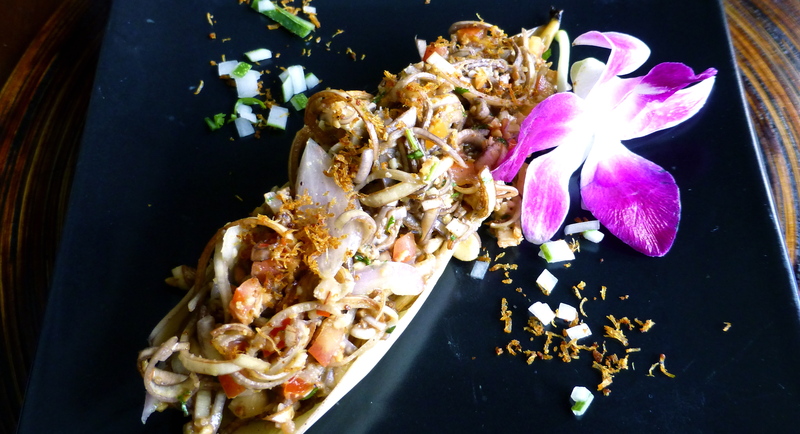 The head chef, Ian Murray, hails from Scotland and runs an excellent kitchen providing both Burmese and western food. From Me Me we began to learn something of the Burmese philosophy of life – grounded in Buddhism but developed into a daily way of life that emphasises ‘we’ rather than ‘me’ and that promotes good karma and well being between all people. She emphasised the need to suppress emotions such as hate, anger, revenge – to let them go, as they only hurt the person who harbours them rather than the person or persons targeted. This seems to have been the Burmese way of dealing with the hated junta and explains why, after so many terrible years of fear and repression, they can still smile and be so gentle and friendly. What a lady! 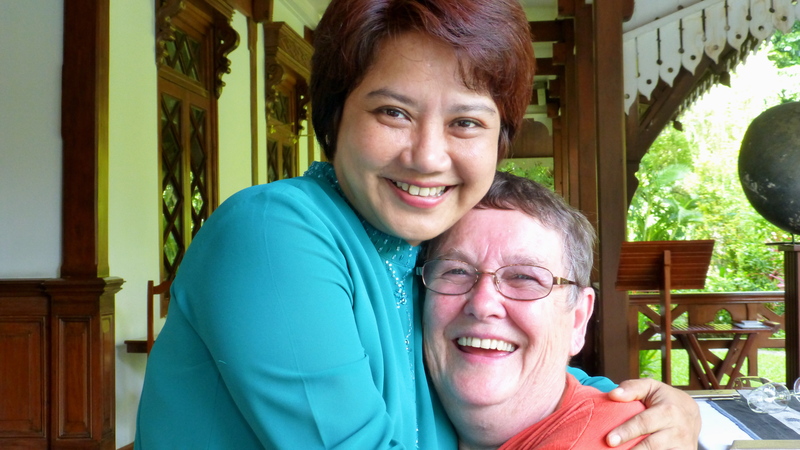 We felt so privileged to meet her – and this hotel is fortunate to have her on its team. The food provided at TGR is always fresh and varied. 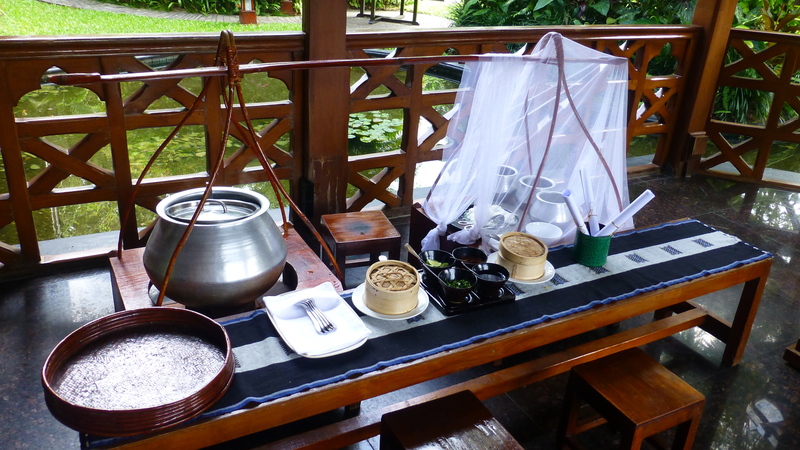 For breakfast you could choose from an incredible array of a the more usual ‘western fare’ or you could have, as David did, a Burmese breakfast cooked fresh right here beside a lily pond. 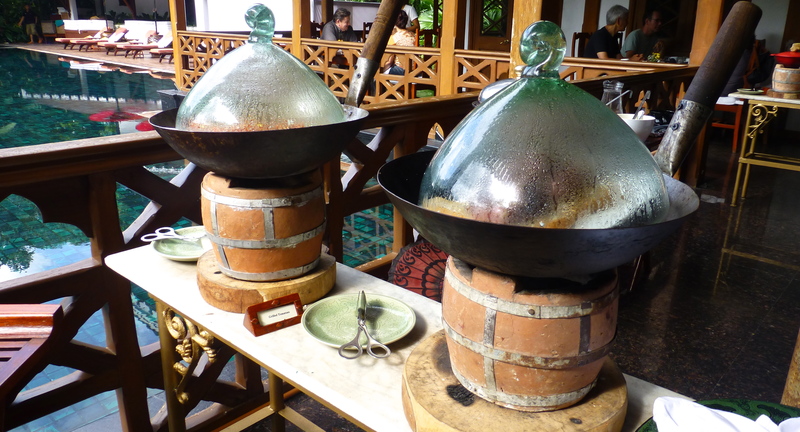 Very effective clay pot fires kept food hot at the omelette making table. Another delightful lady we made special friends with at this hotel was Suzie – a PR person in the hotel. Suzie is a young lady I could cheerfully smuggle out of Burma and bring home with me. She speaks excellent English and has a well credentialed University degree in Physics. So why is she a PR lady in a fine hotel in Yangon? There are just no jobs for her in her chosen field here – yet! She did go to work in Abu Dhabi for two years but found life there too impersonal and empty after her close knit family and community life in Yangon. She couldn’t wait for her two year contract to be up so she could come home. And that’s lucky for TGR because she is a superb PR person. To get to work from home, she could take three buses – one and a half hours each way. Having seen the buses, I’m so pleased that her brother brings her to work by car and comes again to pick her up after work. I just know that she’s a very cherished person in her family, and a very special part of the TGR Team. As are all the members of ‘The Governor’s Residence’ team – an Orient Express Hotel, ably managed by Thomas. Our stay with them was a wonderful introduction to our ‘Captain’s Choice Tour’ on which we would see some very different facets of life. We both highly recommend TGR as a starting point for any journey to this country. It prepared us, in a very friendly, gentle way, for the long, hot days of exploration ahead and gave us a first hint of the wonderfully warm welcome that we were to experience everywhere we went in this country of Burma / Myanmar. 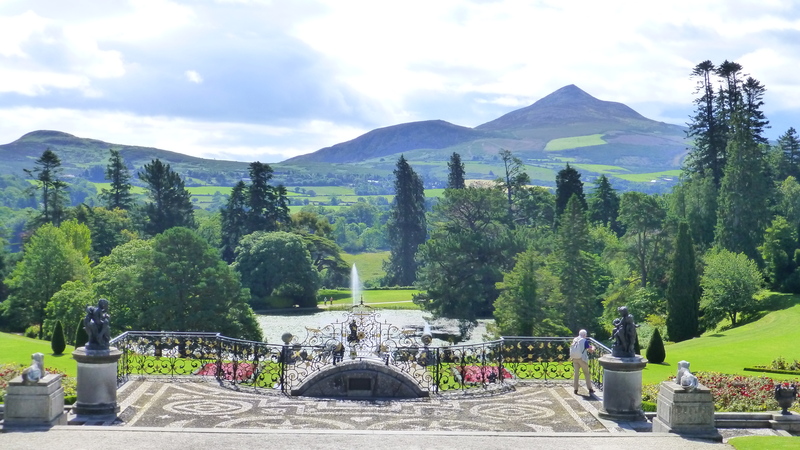 The classic view of Powerscourt looking down the immense staircase and across the gardens to the Wicklow mountains beyond. 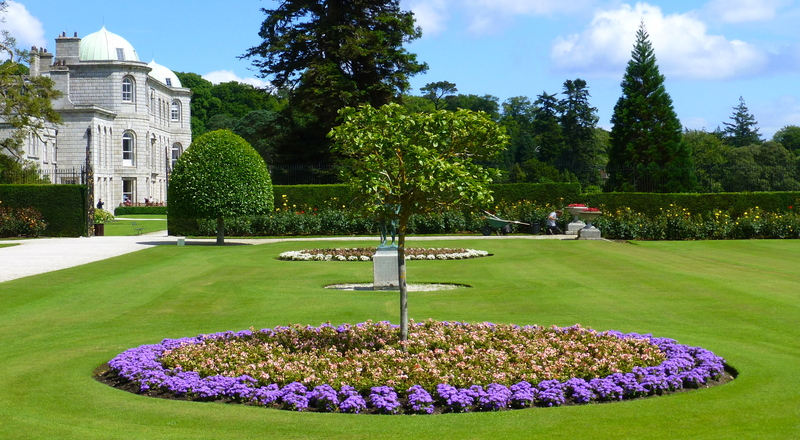 There are wide lawns and formal gardens at the foot of the first part of the great staircase. 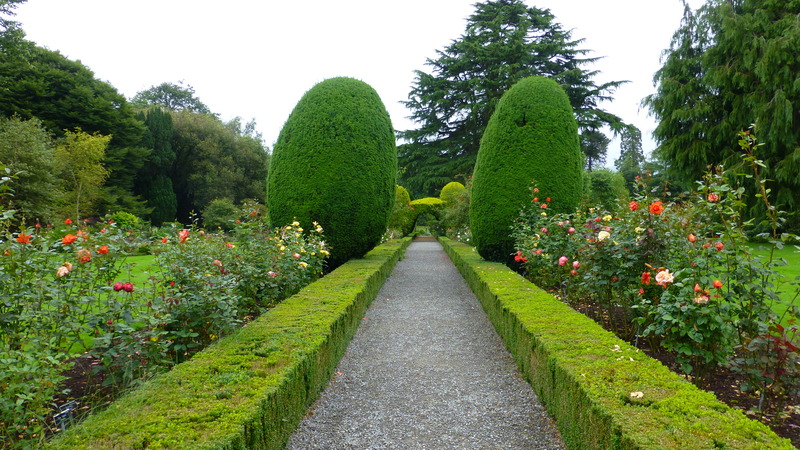 Formal rose gardens are set into the lawns on either side of the grand path. The roses in these gardens were all either red or yellow. 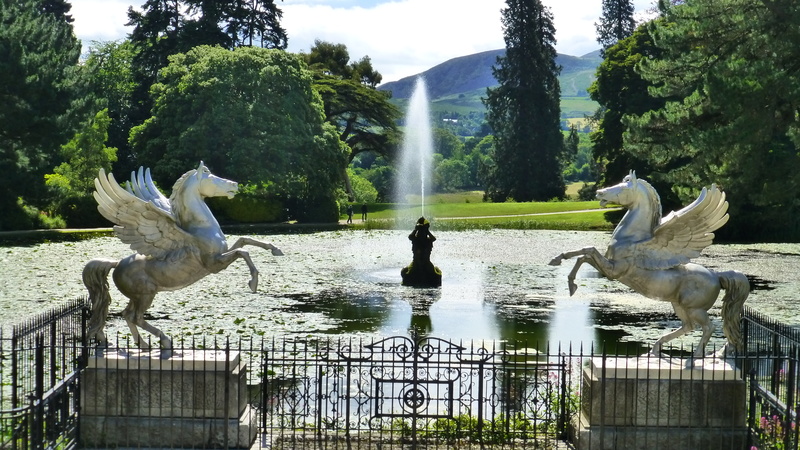 Down another great set of steps, the large water lily covered pool is viewed through the symbols of Powerscourt, two winged horses. 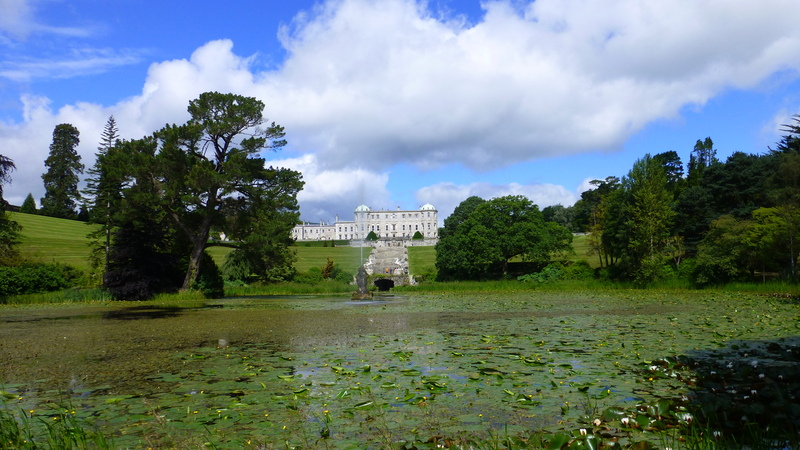 The shell of the grand house of Powerscourt as seen from the far side of the pool. Looking down into the ‘Japanese Garden’. 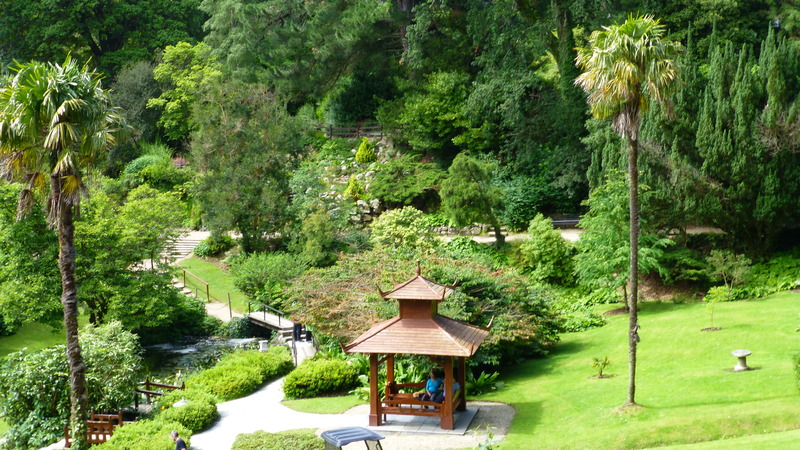 It has some features of Japanese garden design but is very much a European garden. 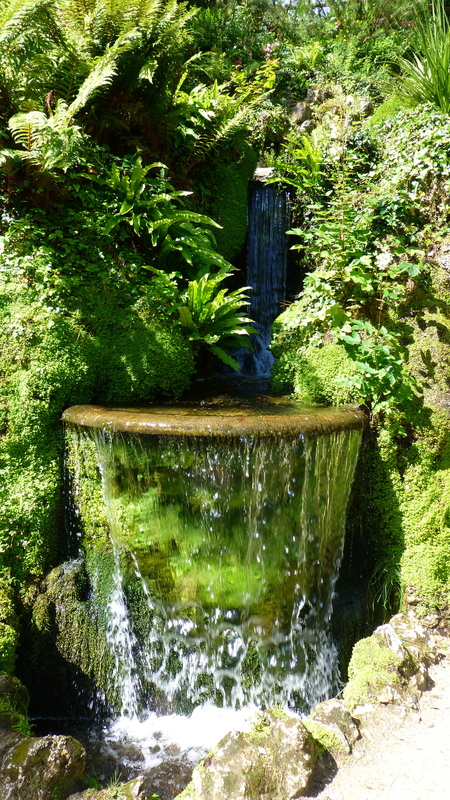 A small rill and several small waterfalls are a feature of the “Japanese Garden’. Another view looking down into this garden showing the Japanese style additions.. The view changes dramatically depending on whether you are down inside the garden or up on the edge. Light and shade on the trunks of a grove of trees in another section of the garden – reached after a long climb up a hill in the park. 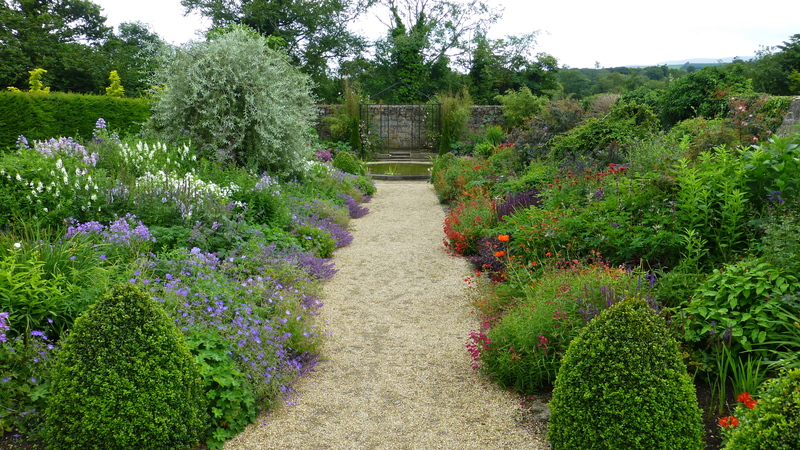 The long perennial borders in the walled gardens. 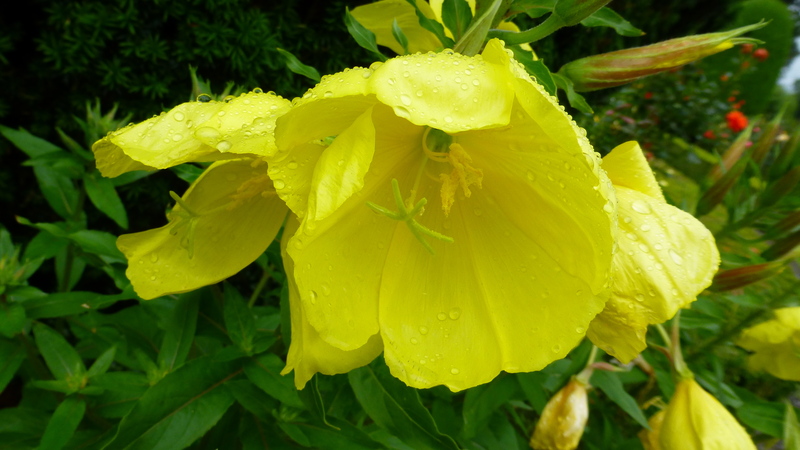 Evening or English Primrose makes a splash of colour in a predominantly green border. 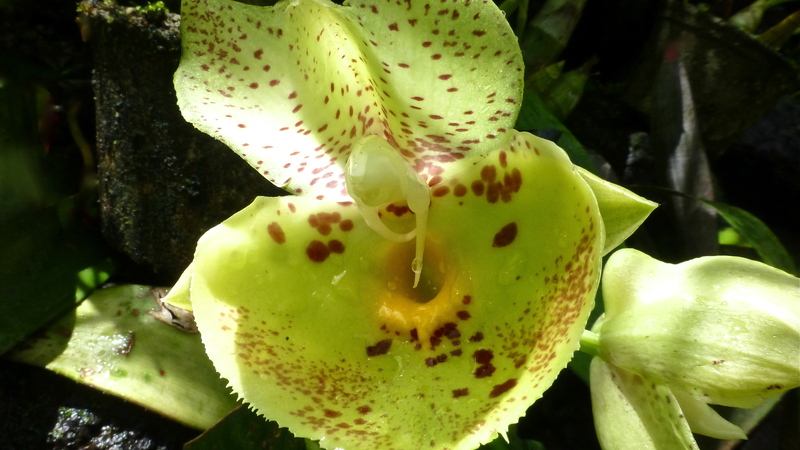 This may be seen as a common plant but the delicacy of its veins are beautiful. 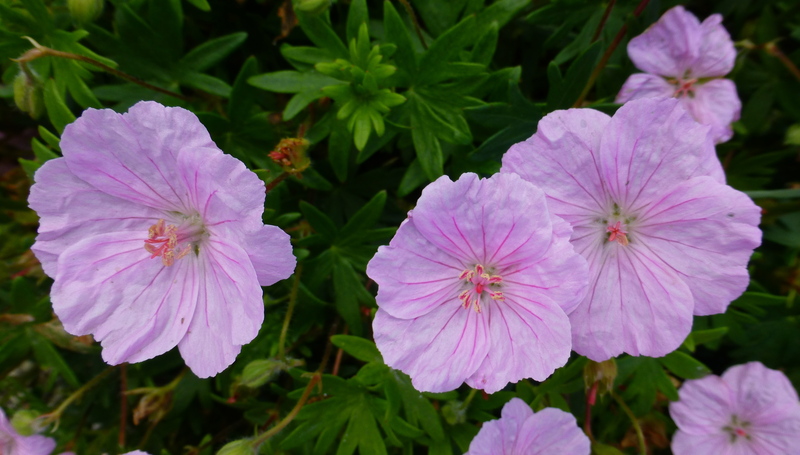 As in most gardens we have seen, various types of geraniums are used as bed fillers in the long border gardens – each flower delicate and beautiful. 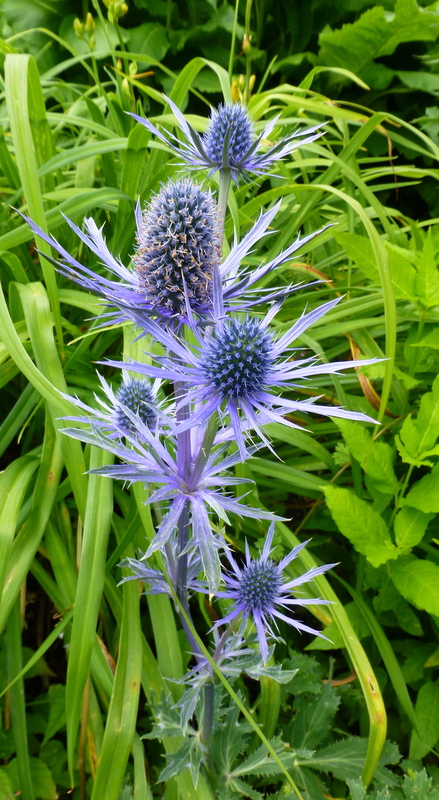 In amongst the more common plants are specimens like this prickly Eryngium. 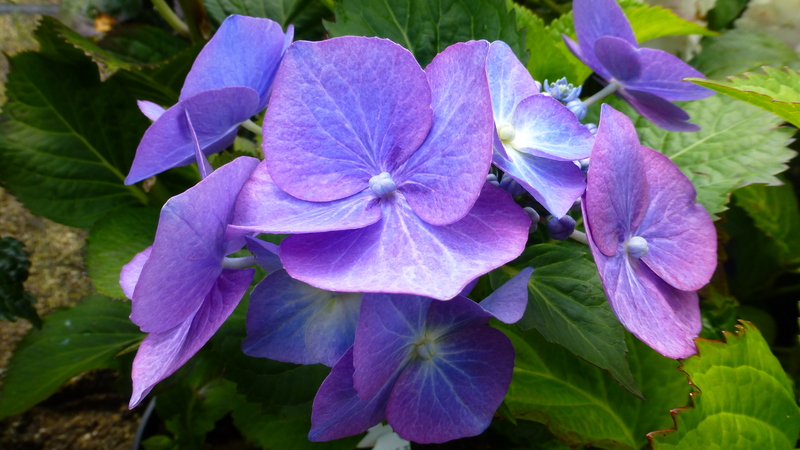 Hydrangea villosa originates in China and is not the common garden Hydrangea. 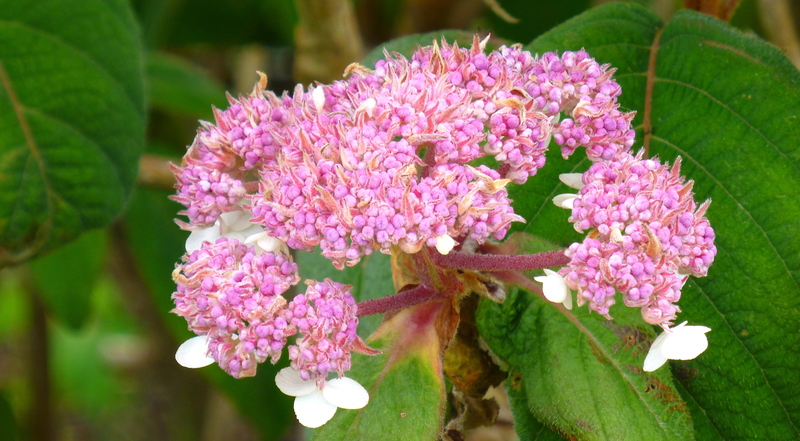 It’s totally deciduous and almost tree-like in form and flowers from late summer into autumn. It can withstand hot, dry conditions but, like us, was not so happy in the wet of this Irish summer! 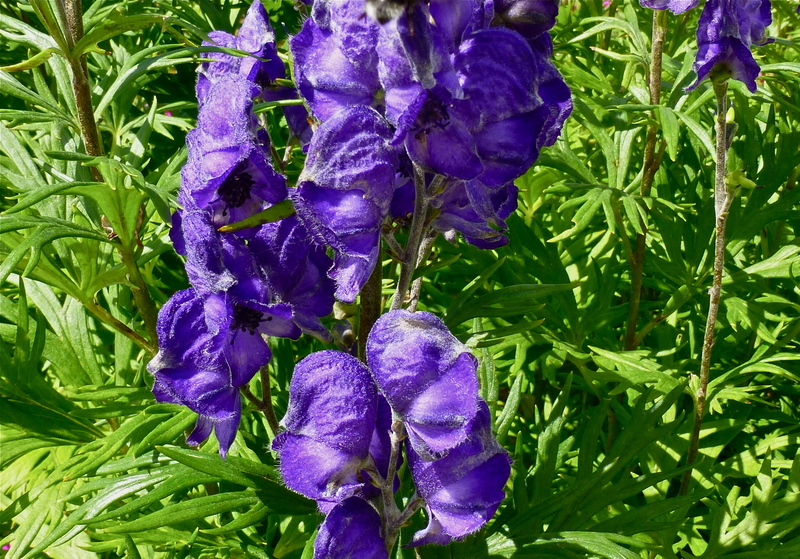 This beautiful blue plant was unknown to us – and unlabelled in the garden. The previous photo was just of the buds. 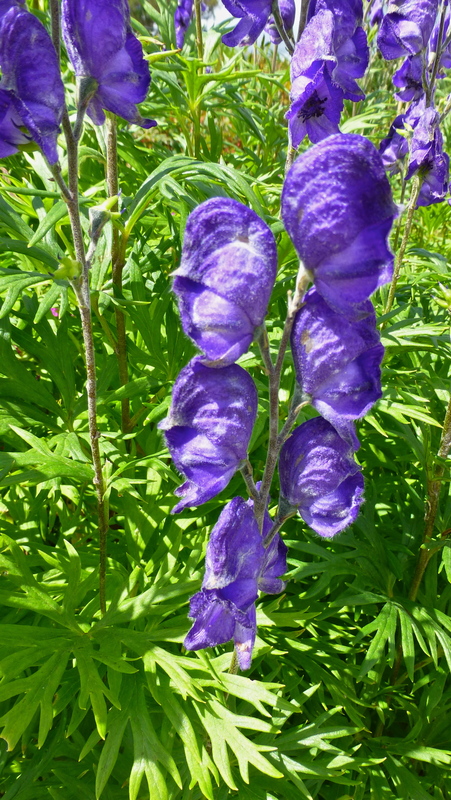 Following our friend Ross’s clue that this was probably a species of anaconitum or monkshood or maybe its a delphinium / larkspur. 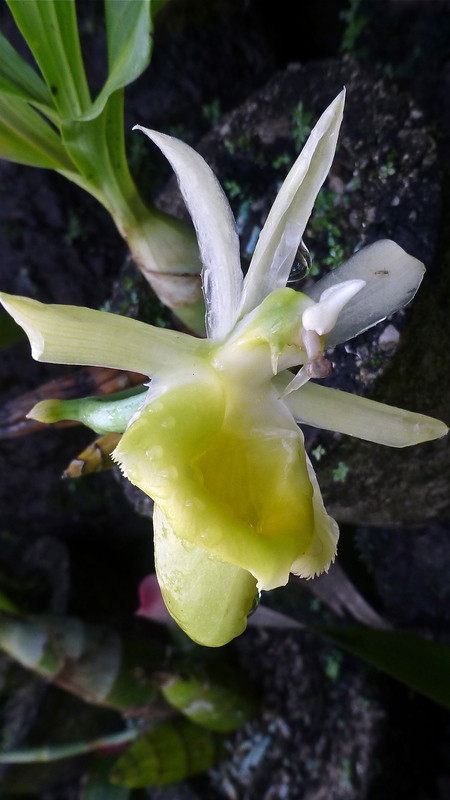 I checked my photos again and found one with buds open. Together with the leaves shown in the previous photo it may be possible to make a more definite naming. 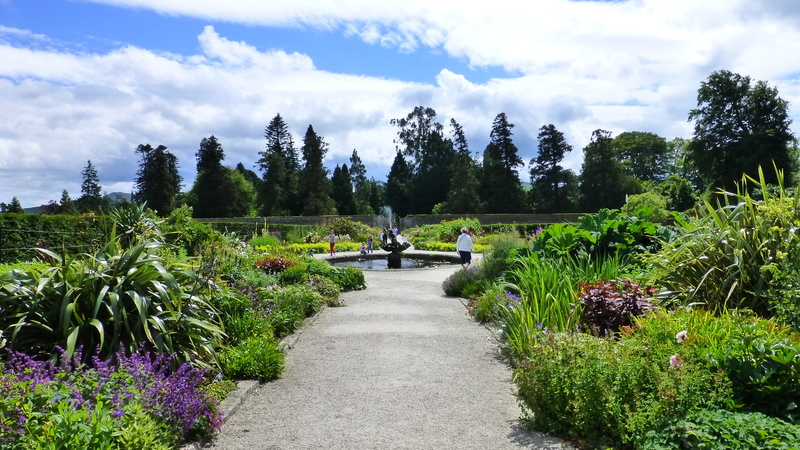 The sky – note the BLUE – and trees helped to set off the view of one end of the walled garden with its small pond. Back on the house level is a formal garden – the ‘keep off the grass’ variety! And on this level is a fairly extensive rose garden growing against a high and sheltering wall. 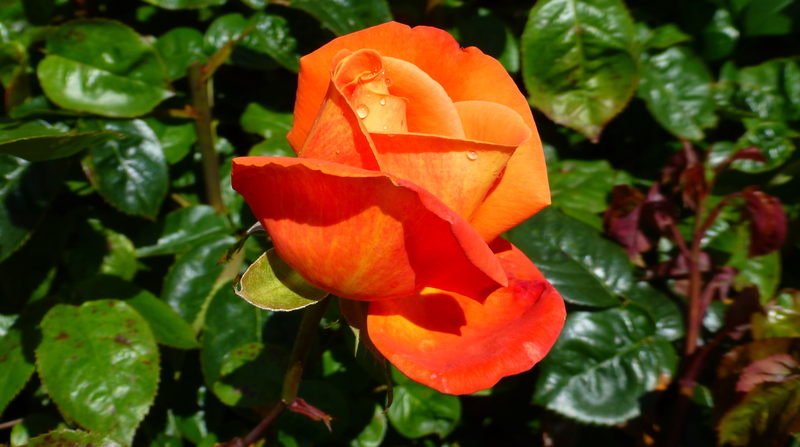 The perfume was heady and at last some roses to really enjoy. 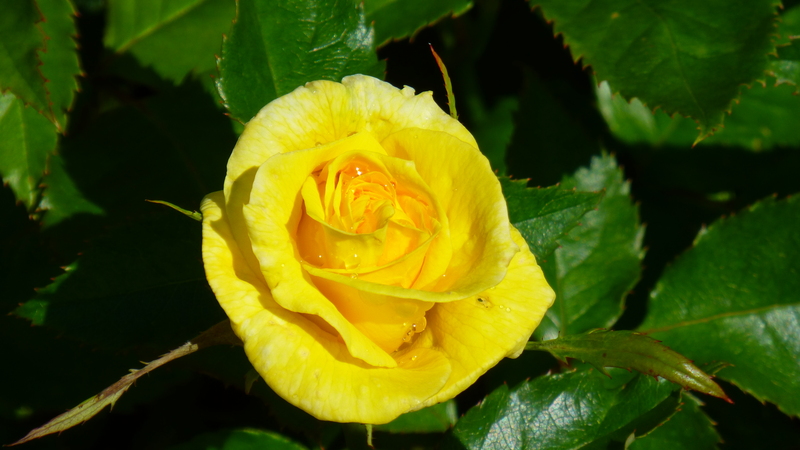 This rose has an apt Irish name – Whiskey Mac. Back to the lawn in front of the house – the views are expansive of park and skies. One of the features of this garden is the statuary. 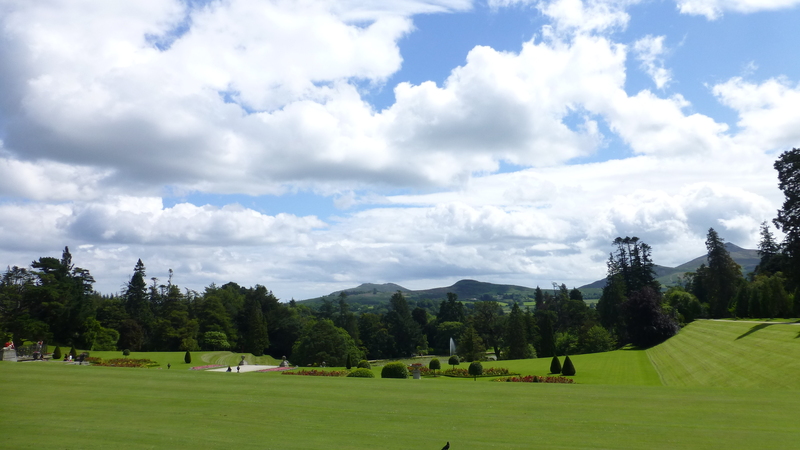 Another, more classic view, of the gardens and the Wicklow mountains from the front of the house. 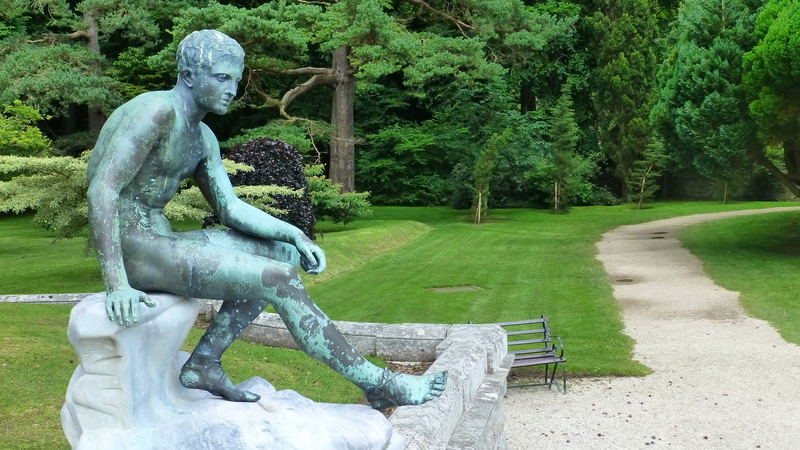 One of the less famous statues in Powerscourt gardens – a smaller, reflective style rather than the large brash ones used to make statements throughout this large park style garden. And in quiet out of the way corners there is evidence of age and decay – such a huge old garden takes an enormous amount of maintenance. 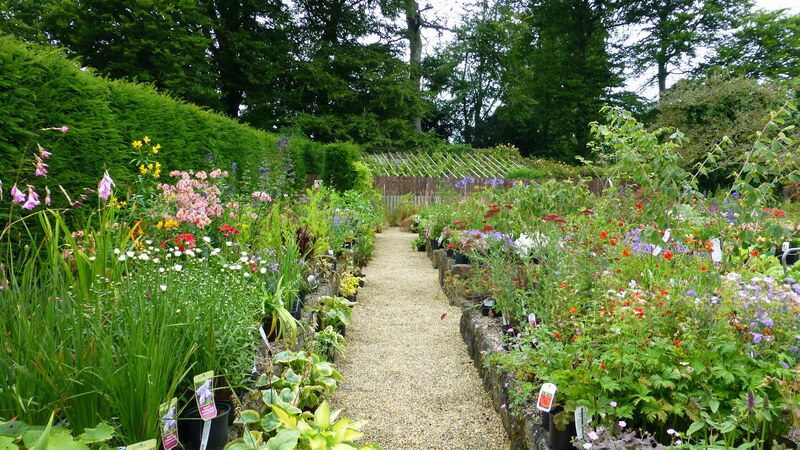 A rain storm seen approaching over the cafe wing of the house sent us scurrying to put on our wet weather gear yet again and leave the gardens for a dry area – the plant nursery out near the car park. 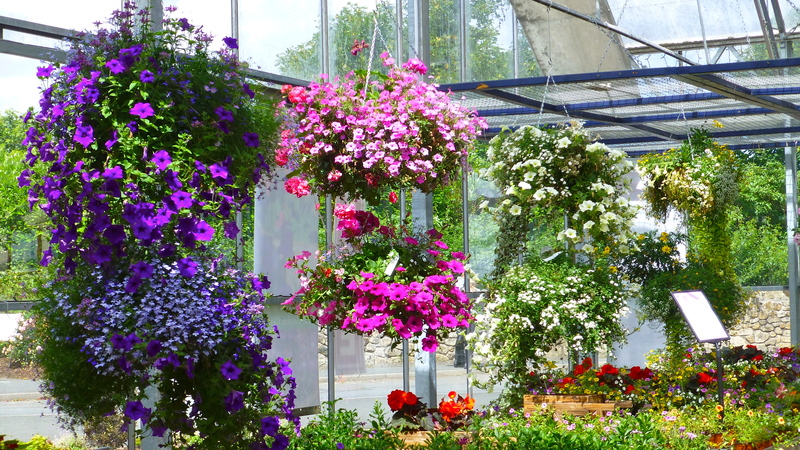 Powerscourt has a fine nursery and garden shop – oh to have been able to take home some of these ready made hanging gardens! We have seen these in so many places throughout Ireland as people take great pride in their villages. Choosing what we would buy if we could was fun. I loved this Hydrangea called ‘Bela’. 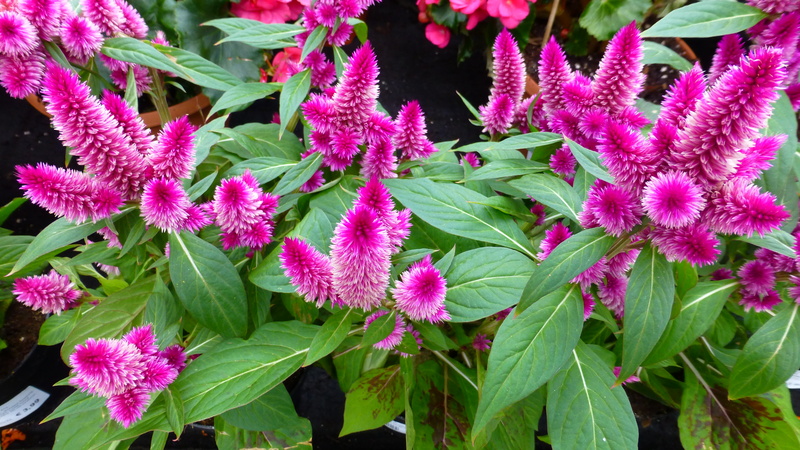 A small growing Cockscomb or Celosia called ‘Intenz’ was another favourite. 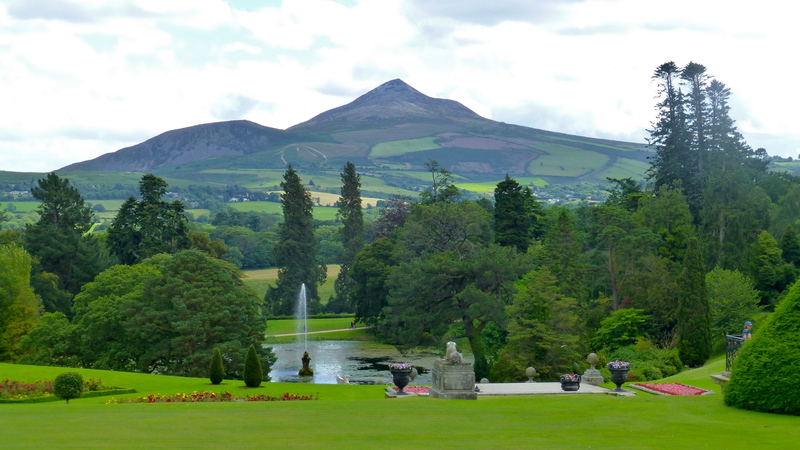 But no, we could look but not buy – and we will just take home our photos and our memories of a good day visiting this immense garden / park estate at Powerscourt near Dublin in Ireland. 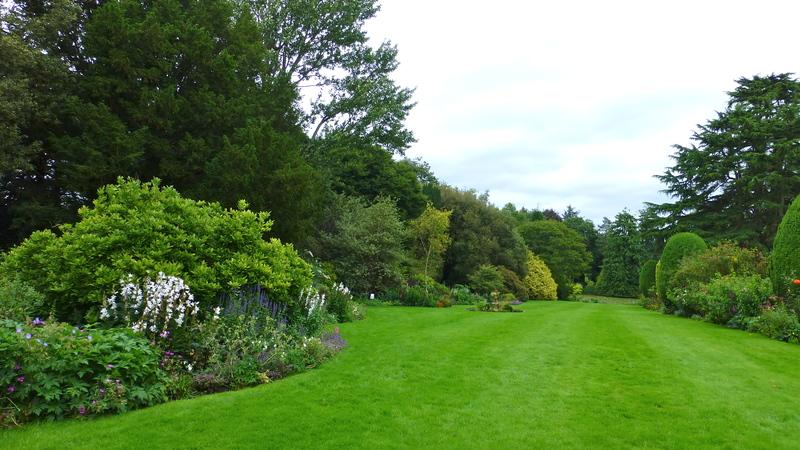 A garden for taking your time and just wandering, Altamont Garden in County Carlow is still little known. There were few there to enjoy this quiet and relaxing garden with us. 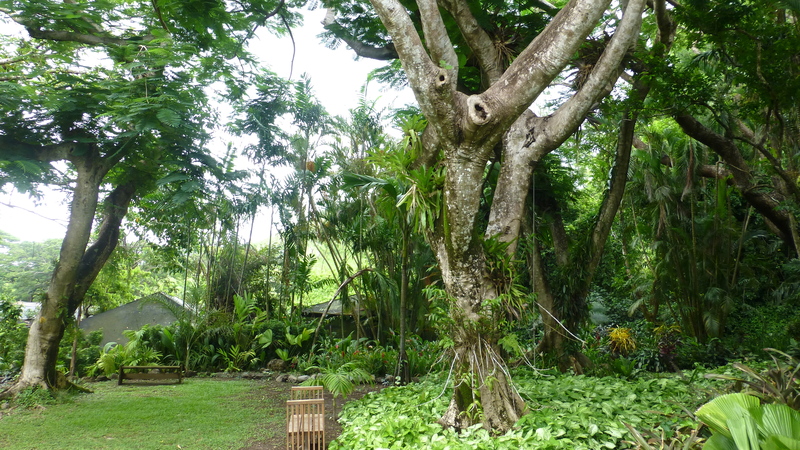 It’s a blend of formal and informal gardens located on a 100 acre estate. 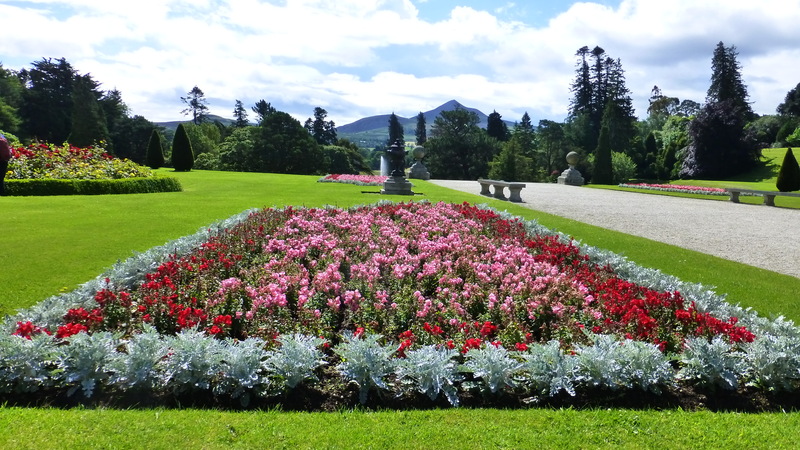 It deservedly ranks in the top ten of Irish gardens and is often referred to as ‘the jewel in Ireland’s gardening crown’. I’m glad we saw it before the busses start to arrive! Lawns are bisected by sculpted yews sloping down to a large lake surrounded by rare trees, very old trees (some 500 years old), rhododendrons and shrubs. 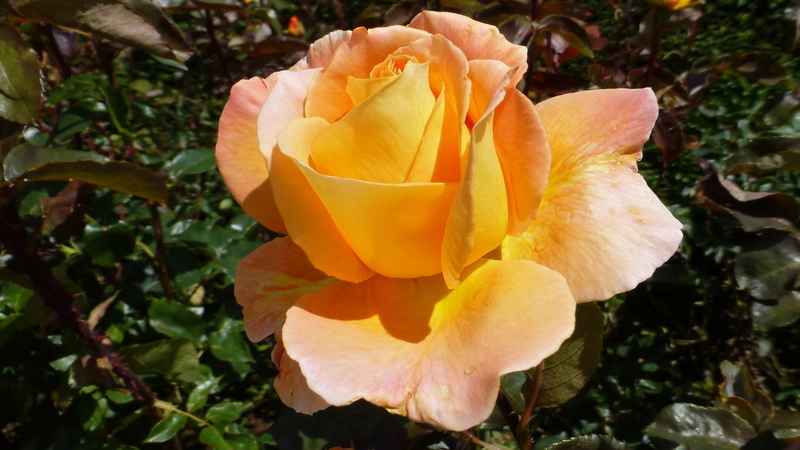 A profusion of roses, old fashioned and modern, lilies and herbaceous plants scent the air. A fascinating walk through the Arboretum, Bog Garden and Ice Age Glen with its canopy of ancient oaks leads to the majestic River Slaney. Unfortunately for us, the wet weather made it impossible for us to do the river walk – it was closed. This would be yet another wonderful garden to visit in the spring time – anytime it is special. 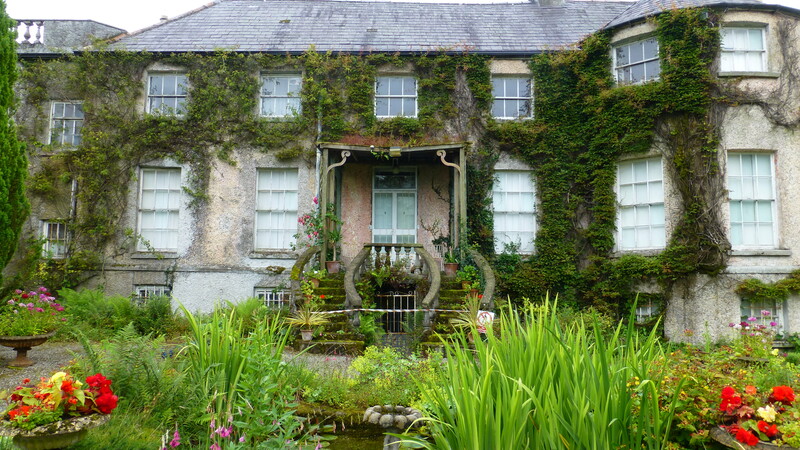 The decaying manor house at Altamount adds an air of mystery to these lovely gardens. No-one lives here now except for a couple of peacocks. 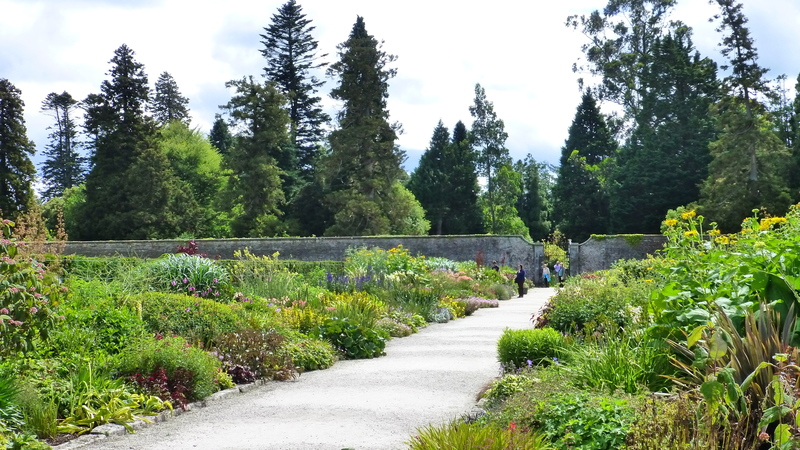 The path from the house leads to a formal garden of roses and lillies. 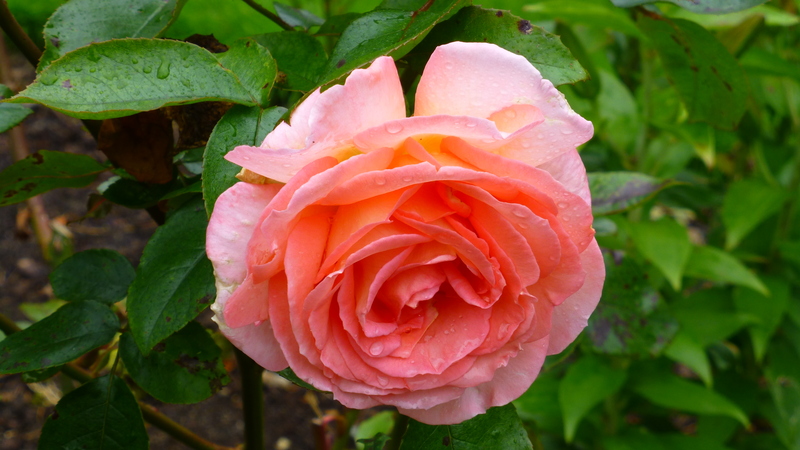 Many of the roses were rain damaged but some were still pristine. 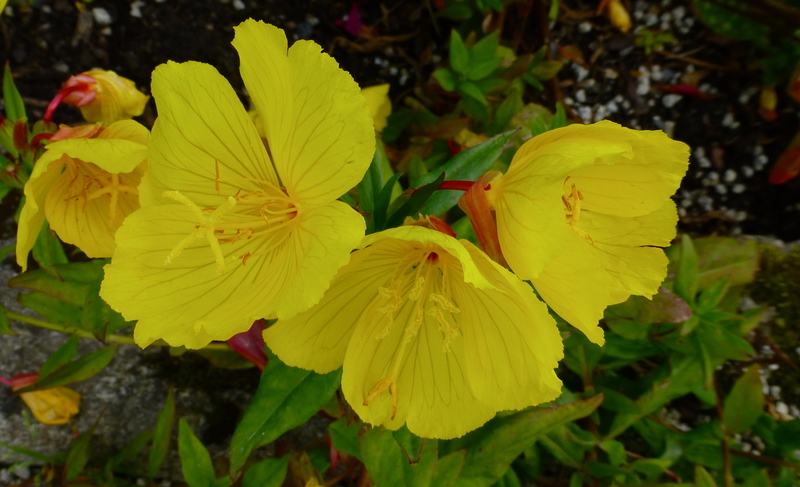 The large bloomed ‘Common Primrose’ had seeded itself in many places. 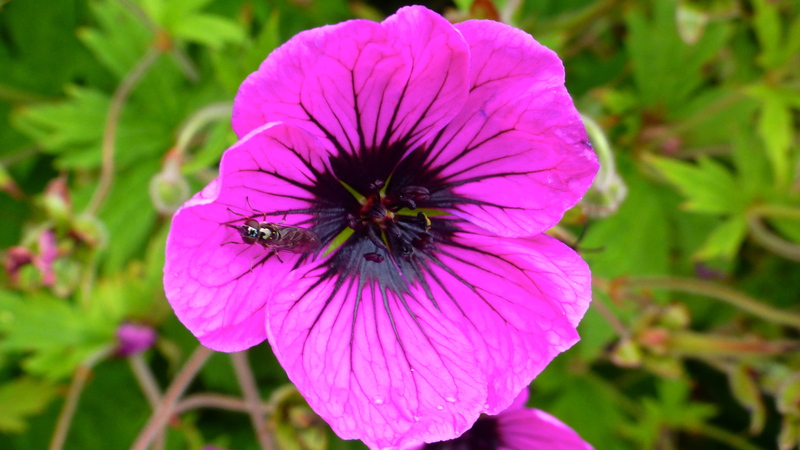 A wide variety of geraniums are used to great effect in the gardens. 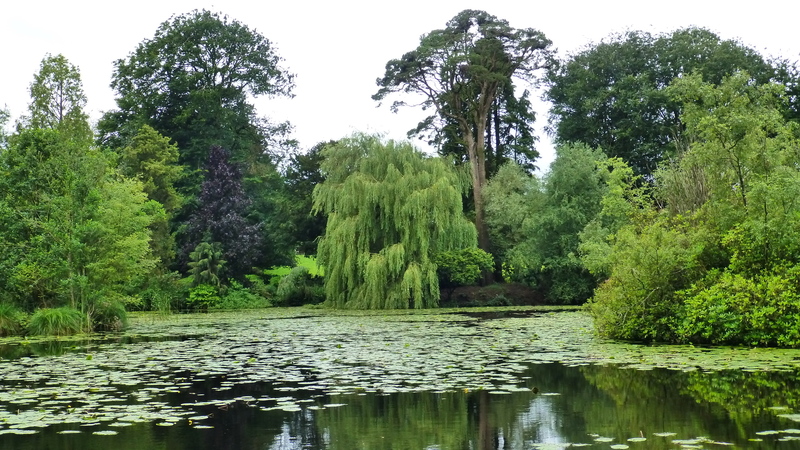 At the bottom of the garden is an extensive lake covered in water lillies and surrounded by mature trees and bushes. 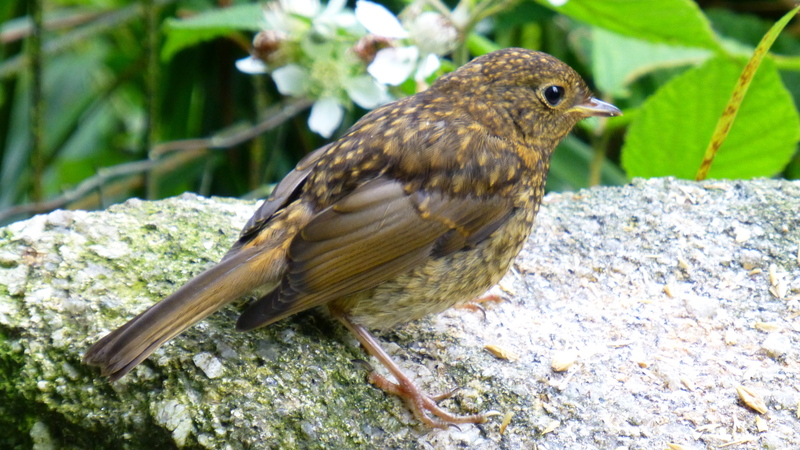 Down by the lake we found this baby robin – willing to sit still for its portrait. 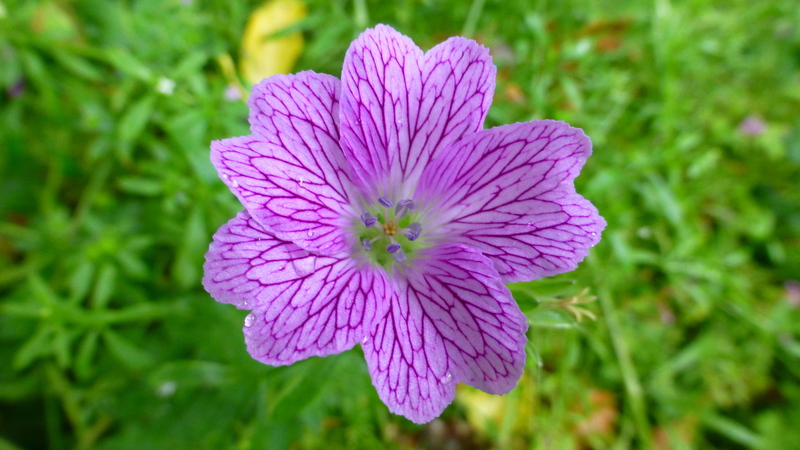 Even more varieties of geranium were used by the path near the lake… this one is spectacular. It’s A’s favourite. 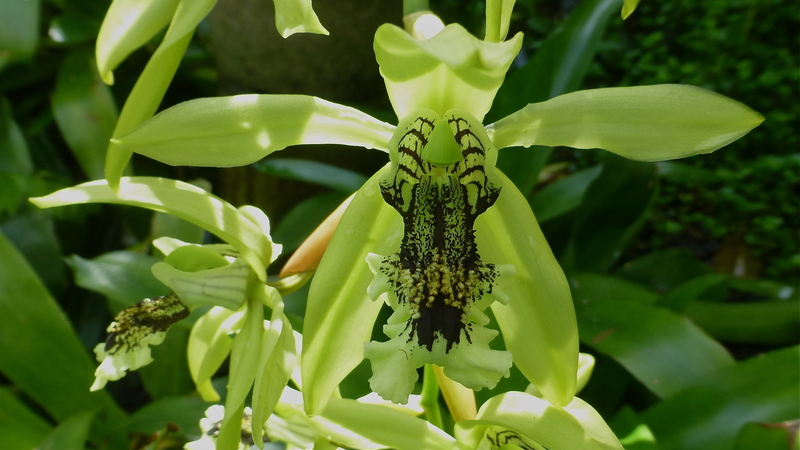 Can anyone name this one? Beyond the lake is a walk through a small aboretum. 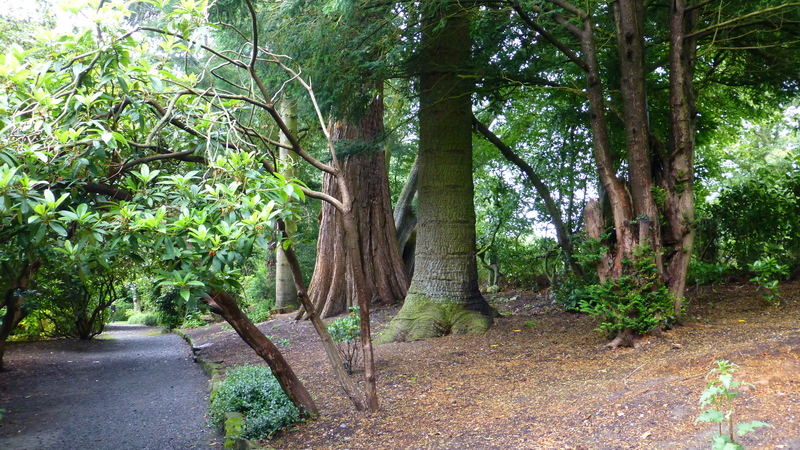 Some of the trees are very old indeed – up to 500 years old- and huge! The forest track arrives eventually at the other end of the lake. 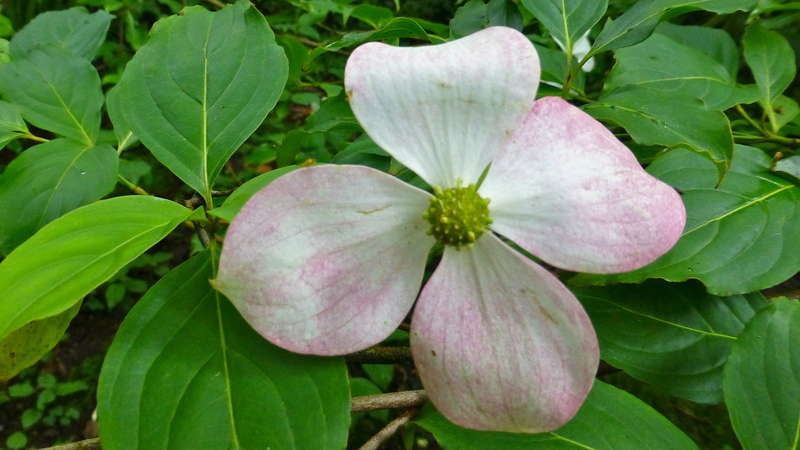 It was here that we found the only dogwood that we have seen in any of the gardens we have visited so far. From there we walked back up to the house across the wide lawns. 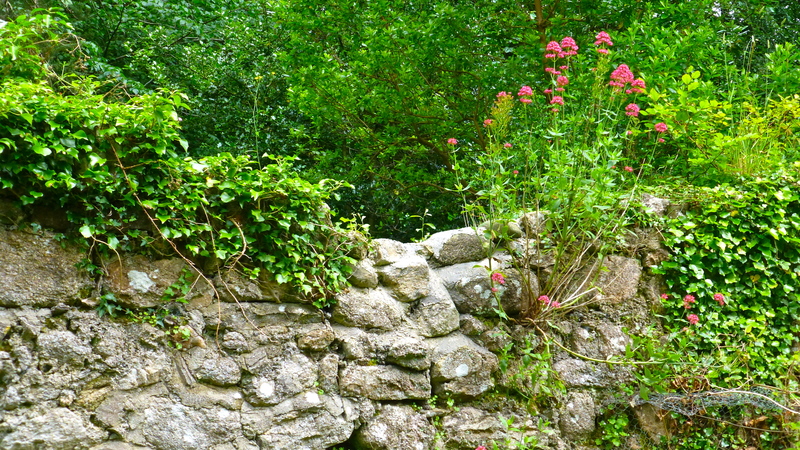 Beyond the house is the walled garden filled with perennials. One side off the garden is biased towards red flowering plants, the other towards blue. 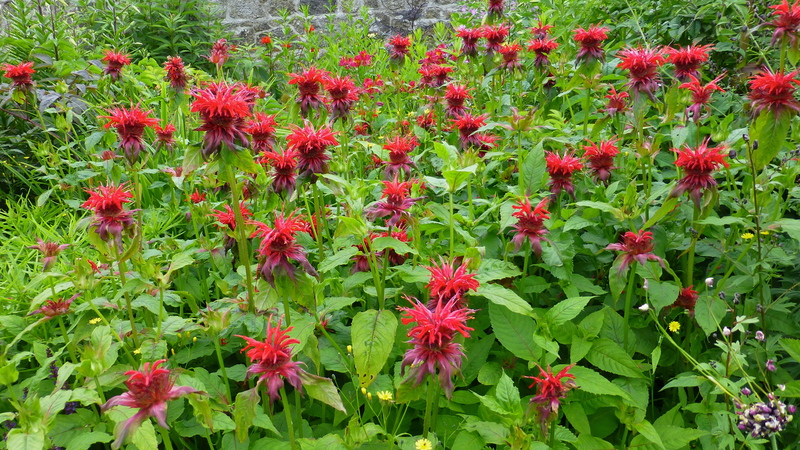 There was one plant that neither of us had ever seen before… Monarda didyma; the herb Bergamot. Thanks Ross, Donata and Michelle for the name. We’re so pleased to have such learned horticulturists as friends! 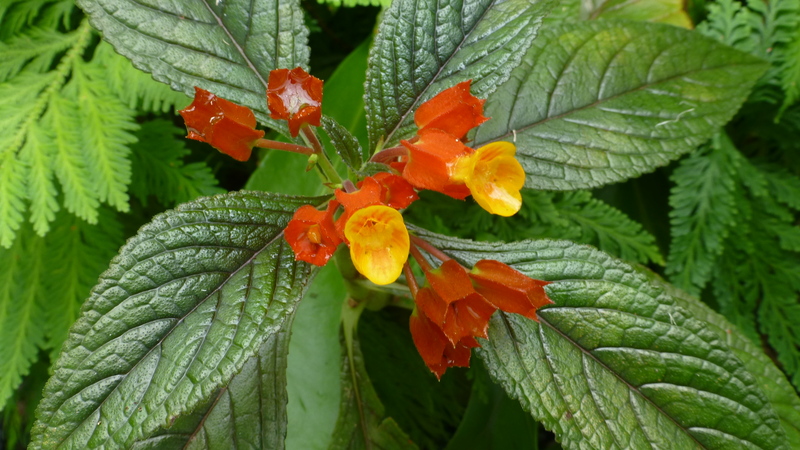 Don’t worry – there will to be more plants to be named as we start to write up all the gardens we have seen! 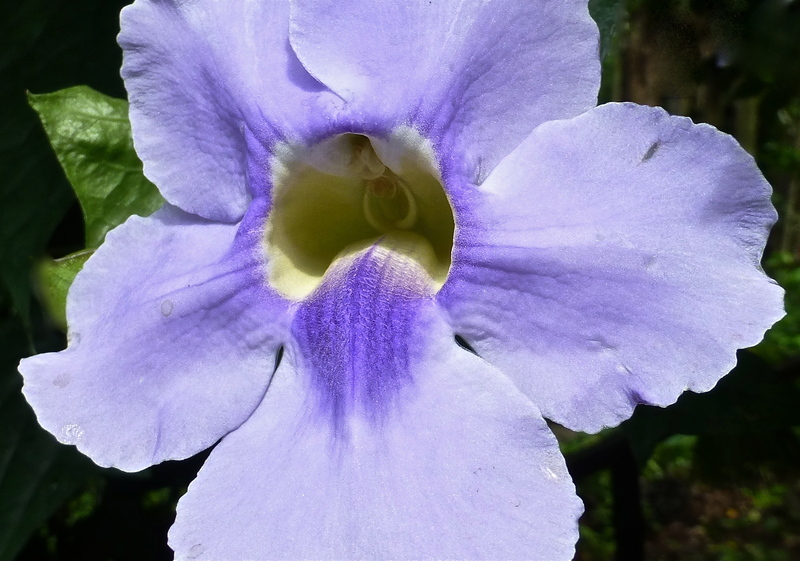 We are both good on colour, texture, shape and beauty of the flowers we photograph – but not so good on names! 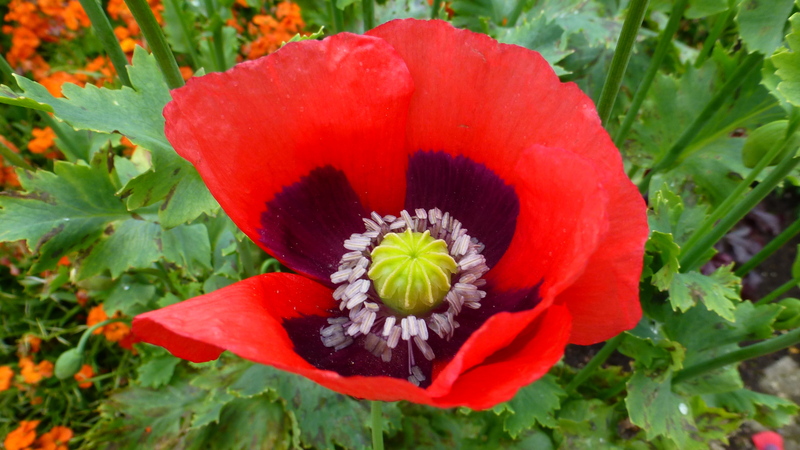 All but one poppy had been wind and rain damaged. This was the survivor! 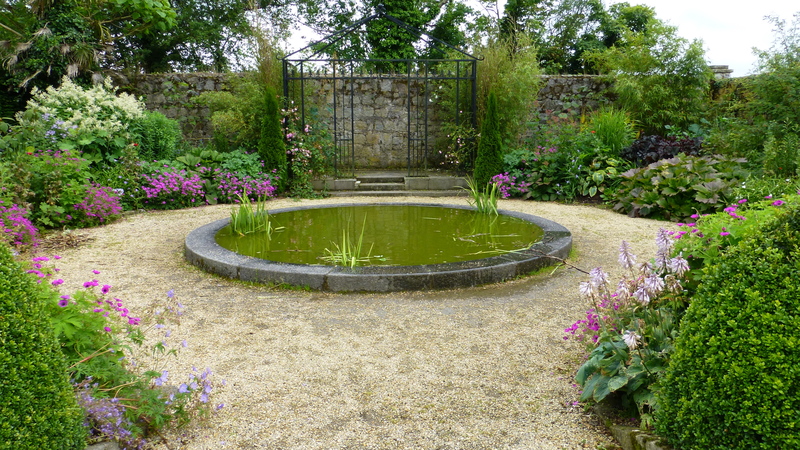 The walled garden ends in a small pond and many more geraniums are used. 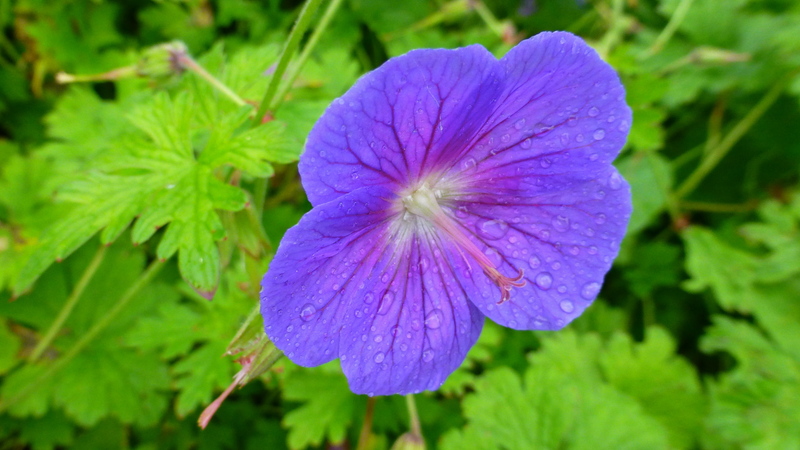 Another variety of geranium – all of them beautiful. Where the vegetable garden would have been in days gone by there is now a very well stocked nursery selling plants – if only we could have bought some! After almost three hours of happy wandering in this lovely garden – it began to rain… and so it was time to go and find somewhere for a very late lunch. 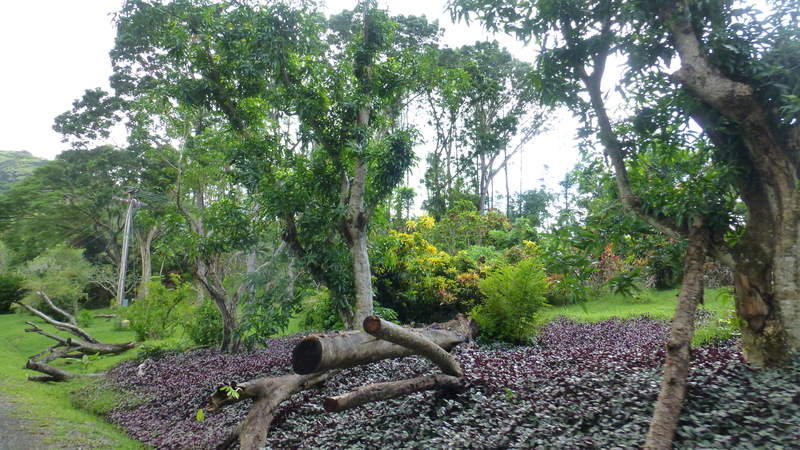 This is but a small sample of the plants and views that we had in this large and well kept garden. It belongs now to the people of Ireland and amazingly entry is free. We’d recommend it to any one living in Ireland or coming to Ireland.